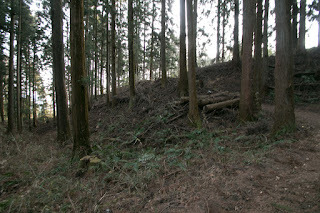 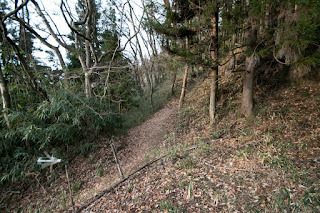 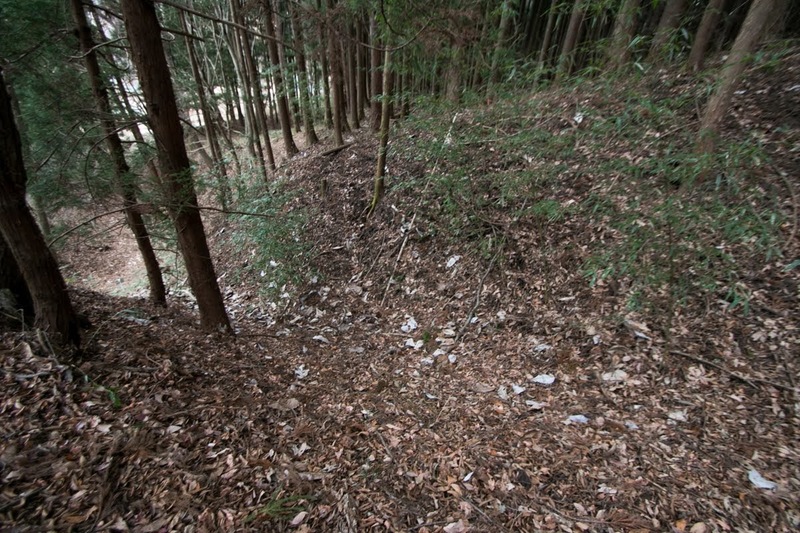 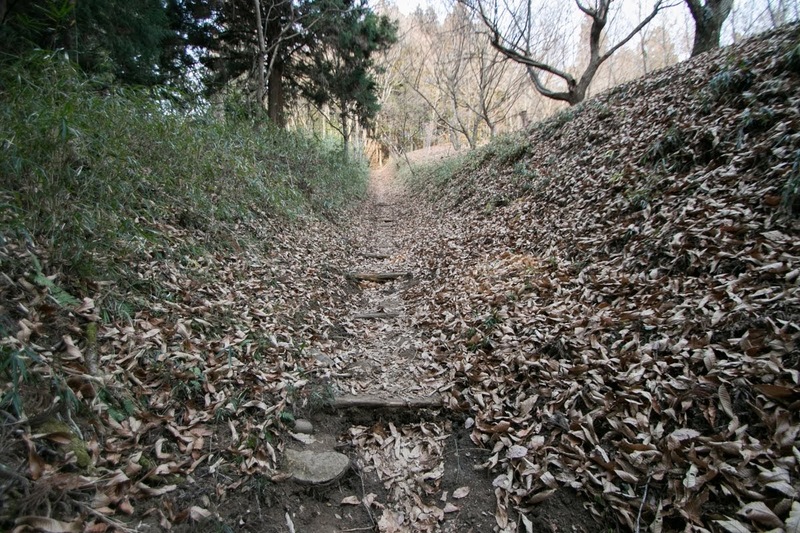 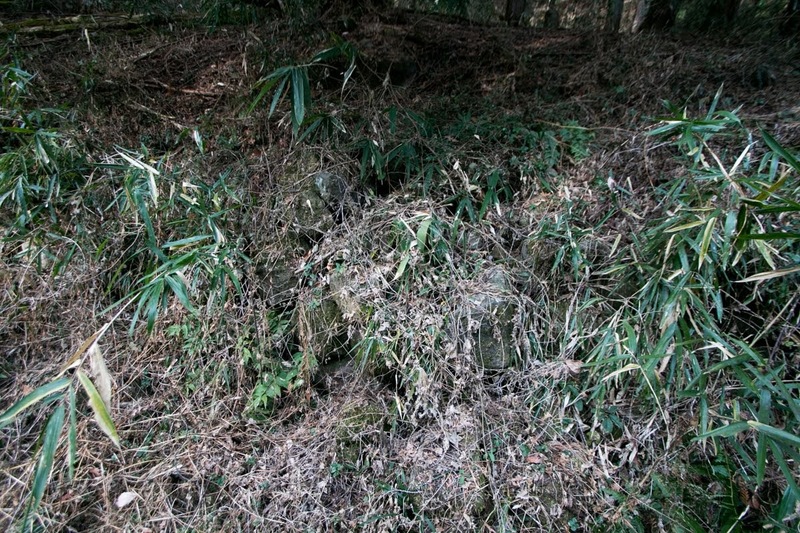 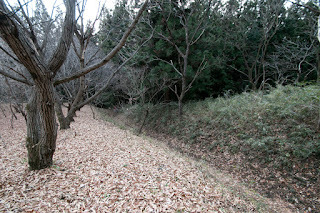 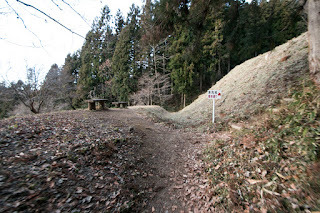 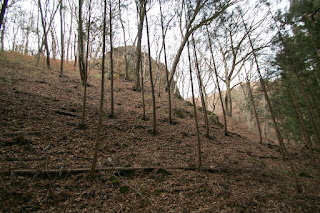 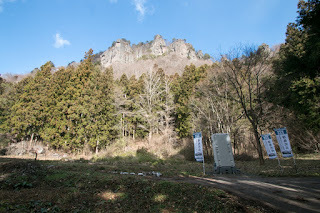 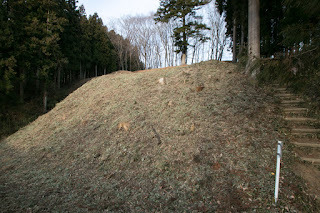 Iwabitsu castle (岩櫃城) is located from halfway to hillside of Mt. Iwabitsuyama in Agatsuma county, northwestern part of Kozuke province (Gunma prefecture). 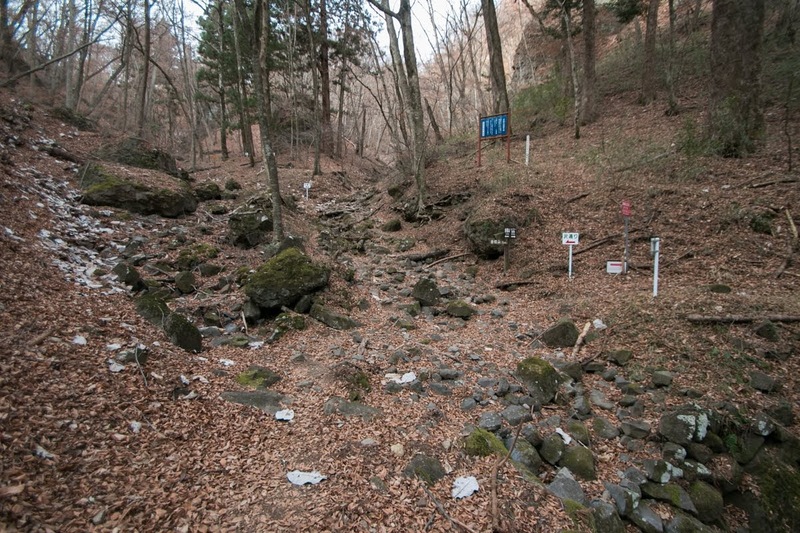 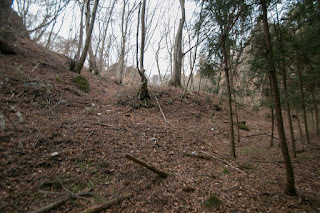 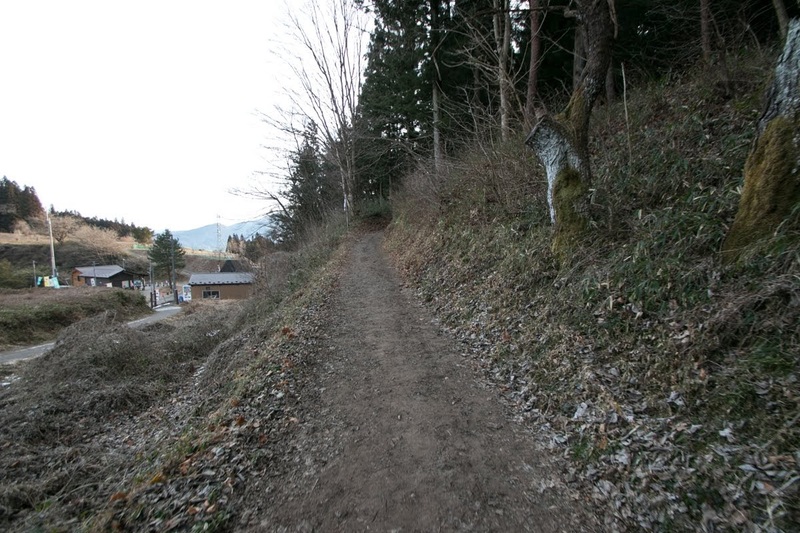 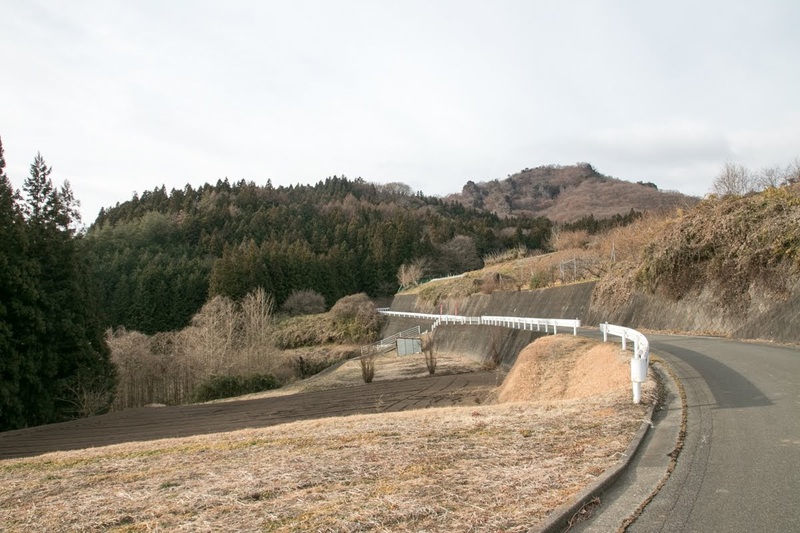 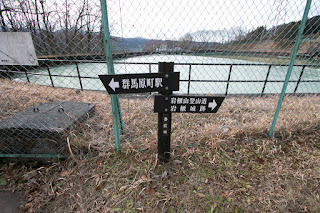 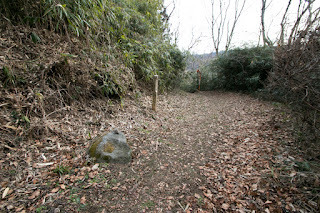 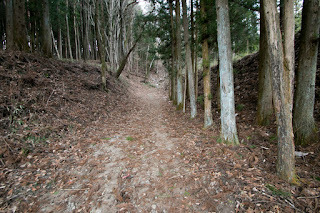 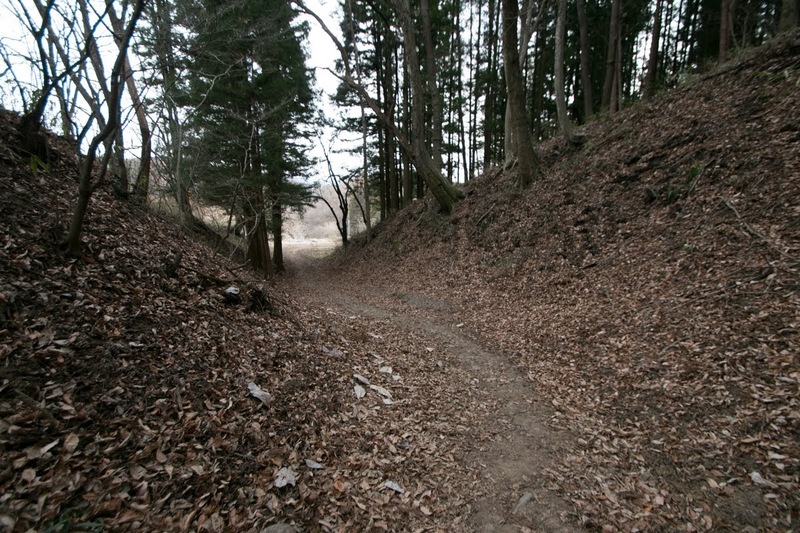 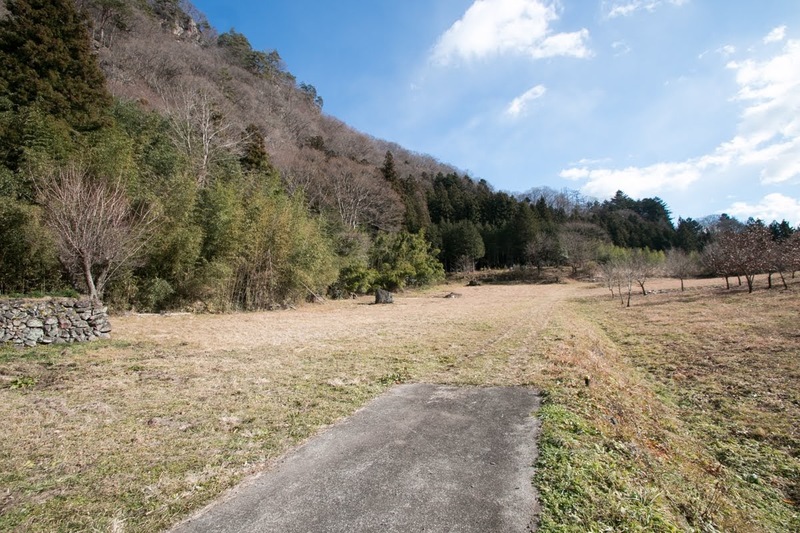 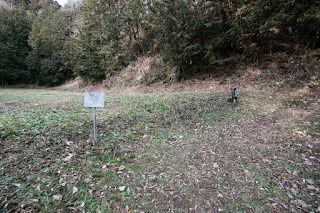 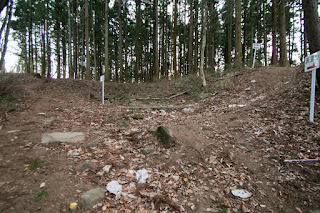 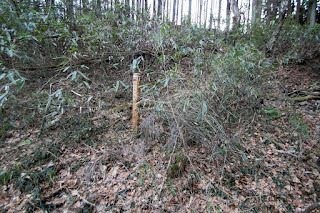 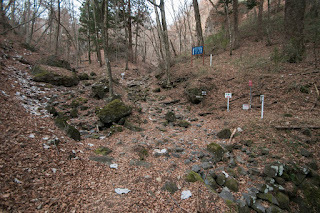 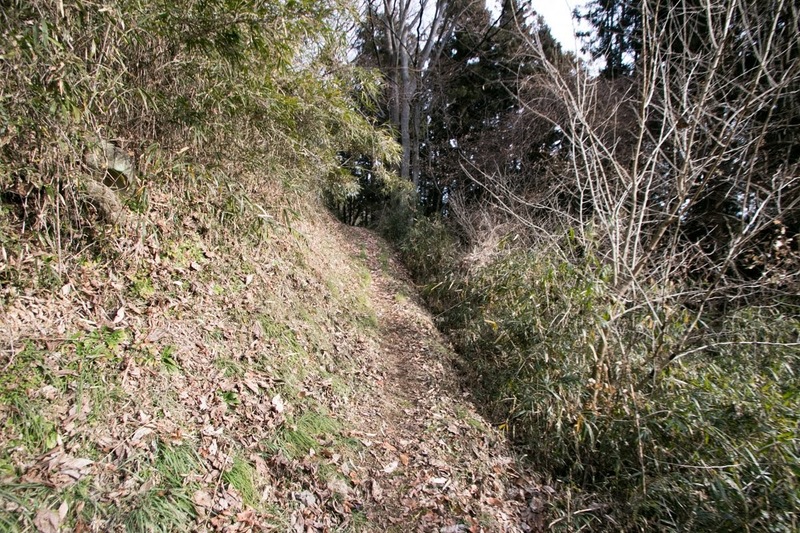 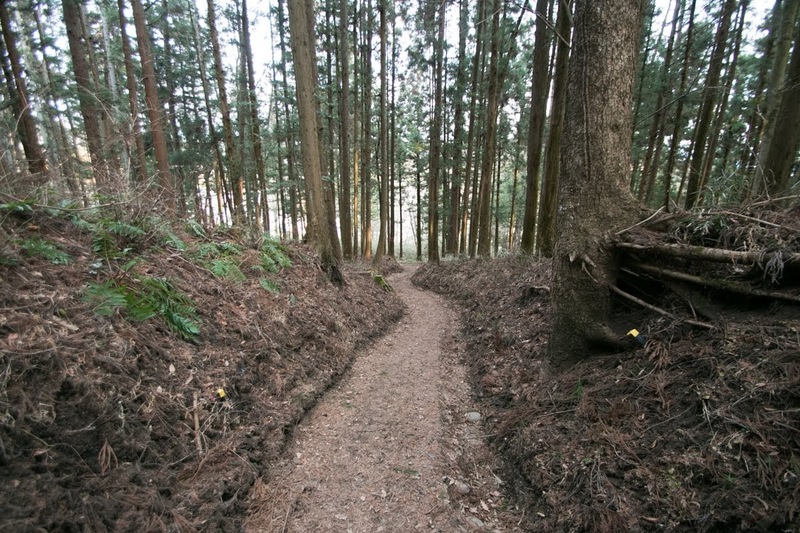 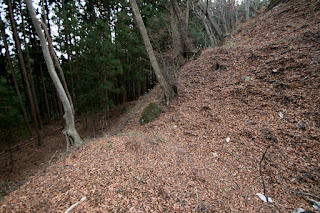 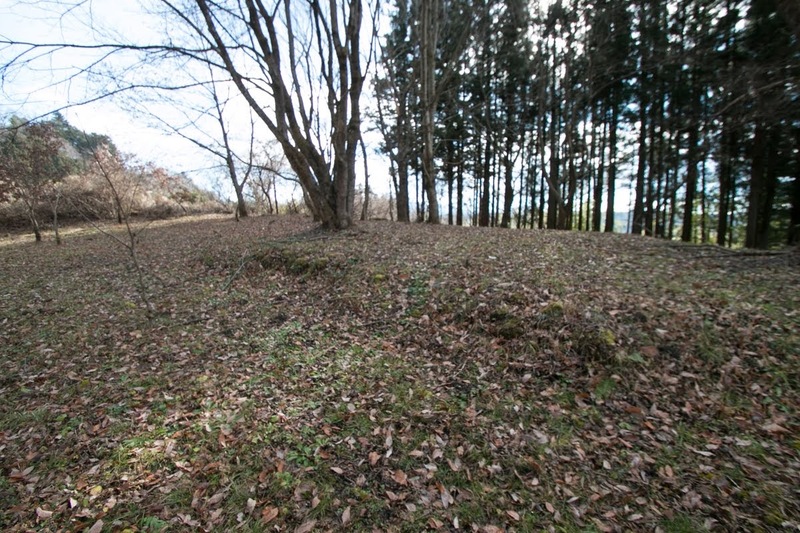 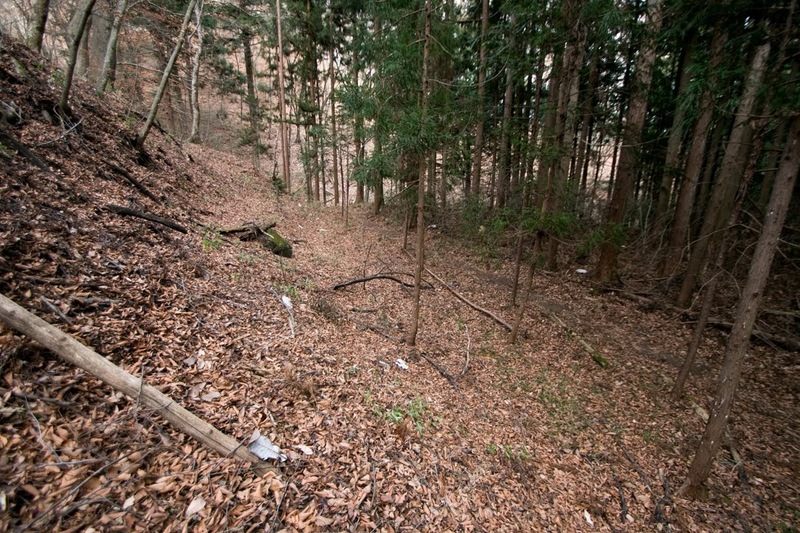 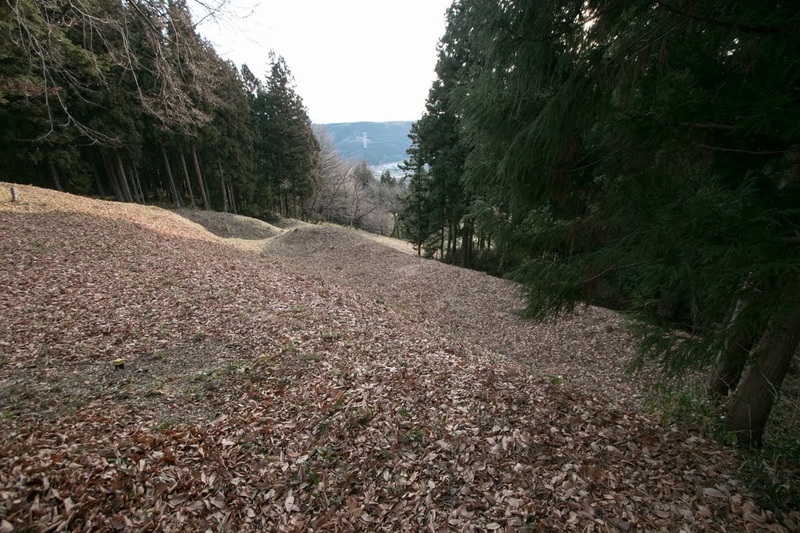 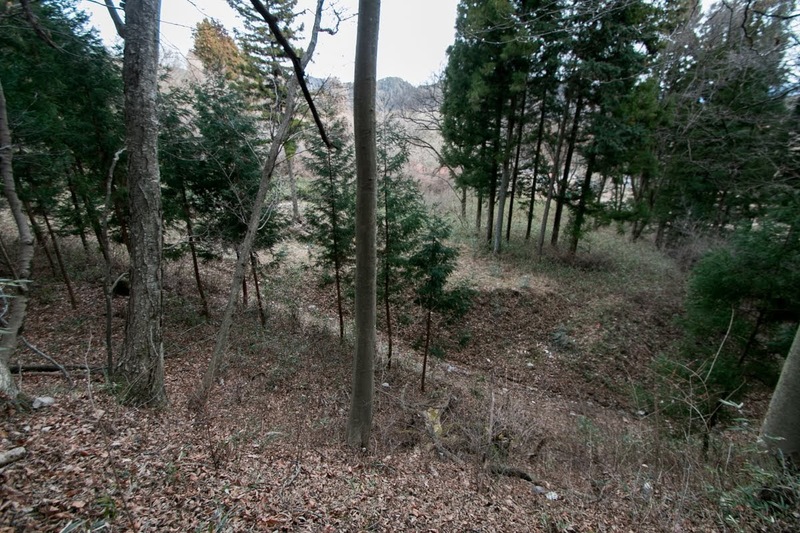 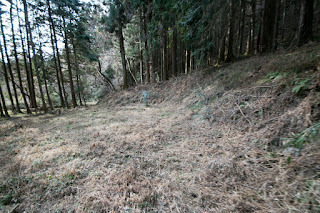 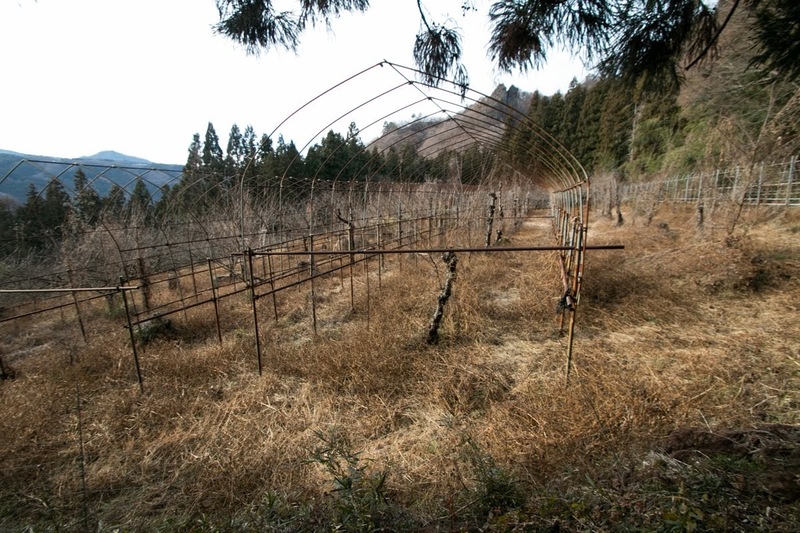 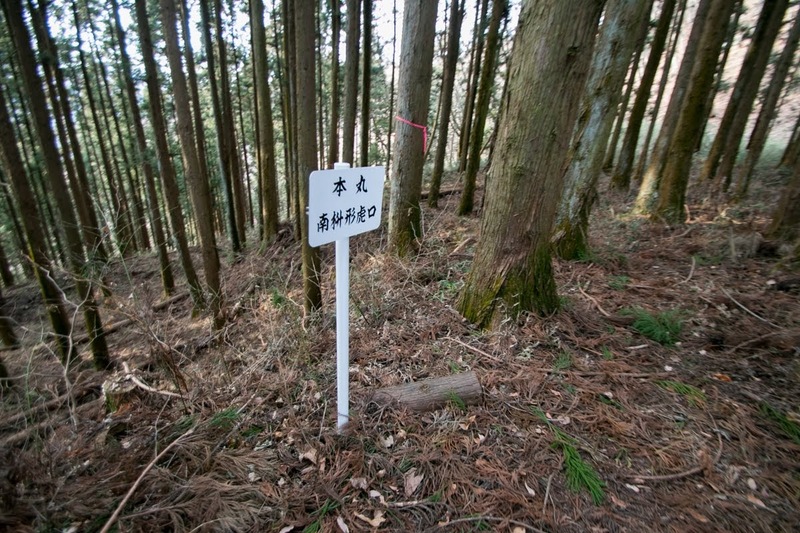 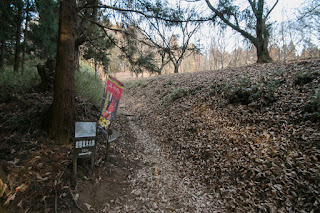 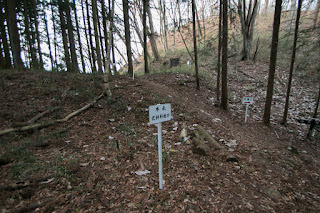 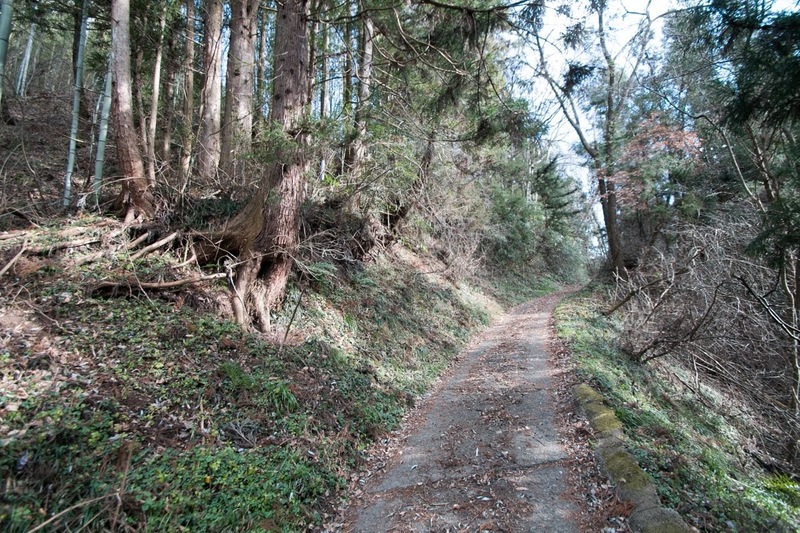 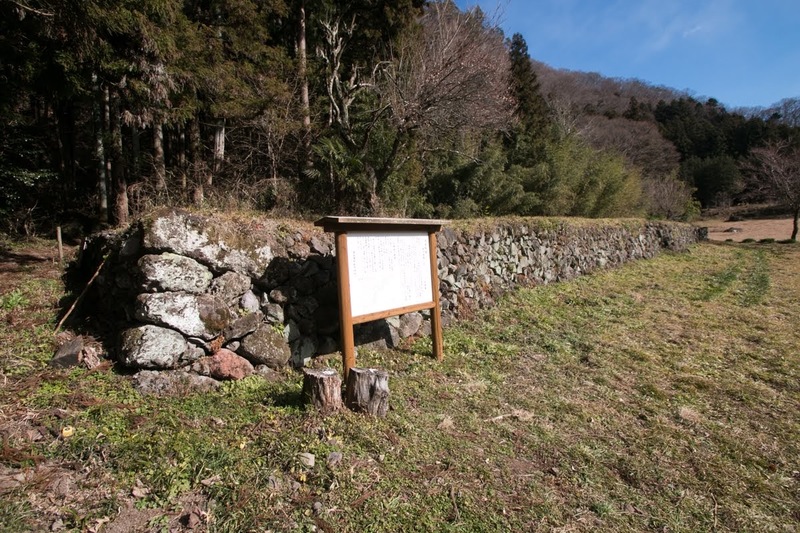 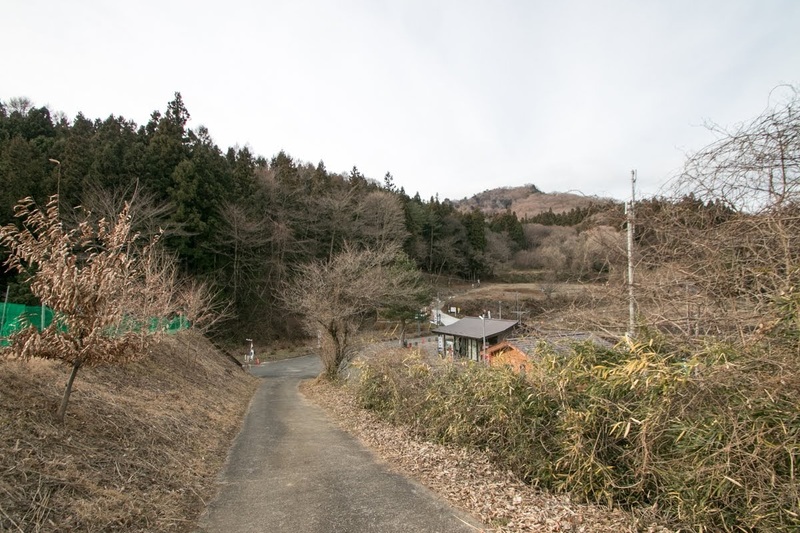 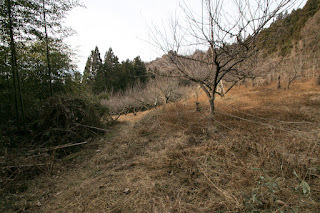 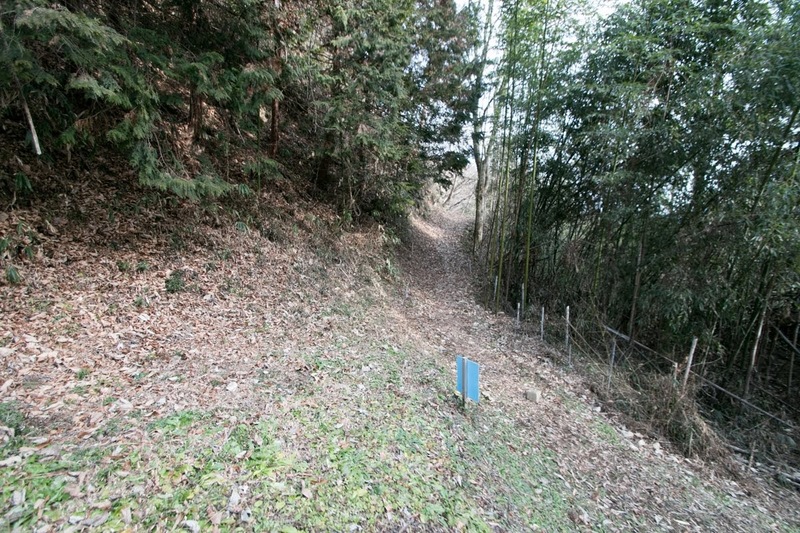 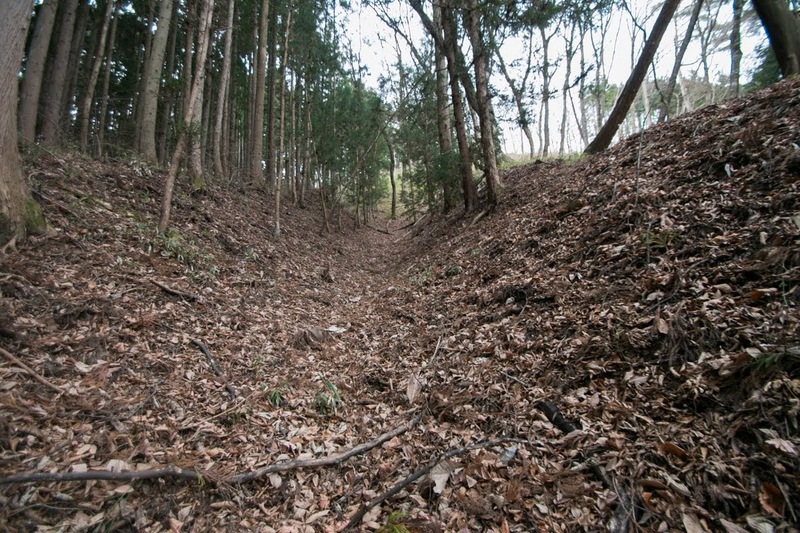 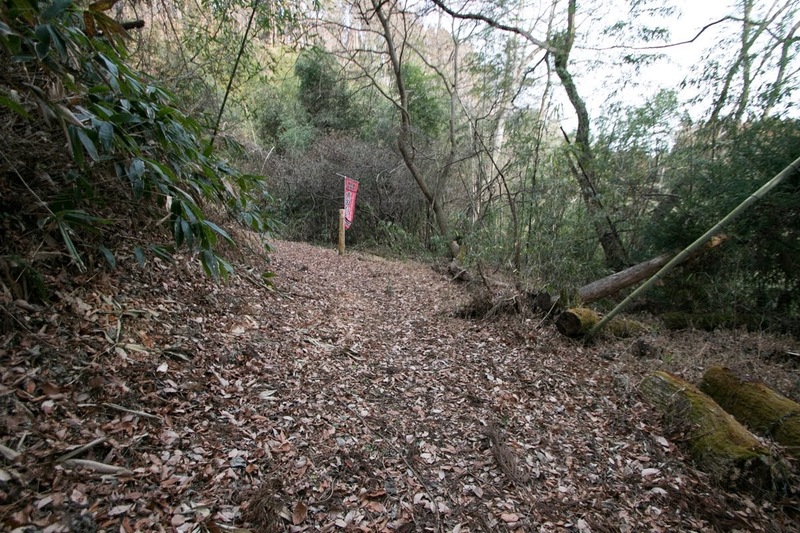 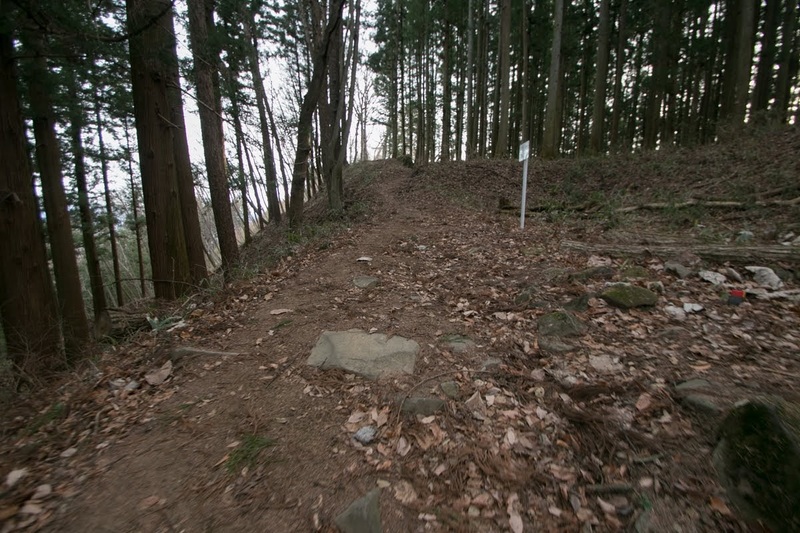 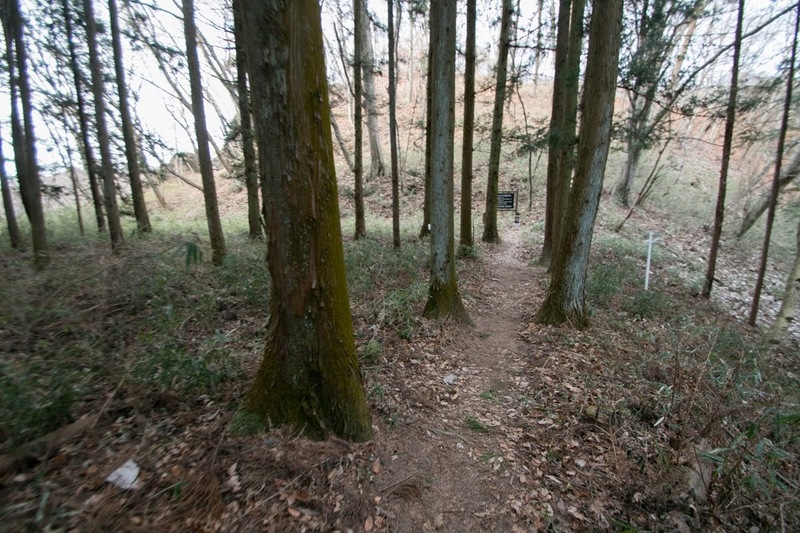 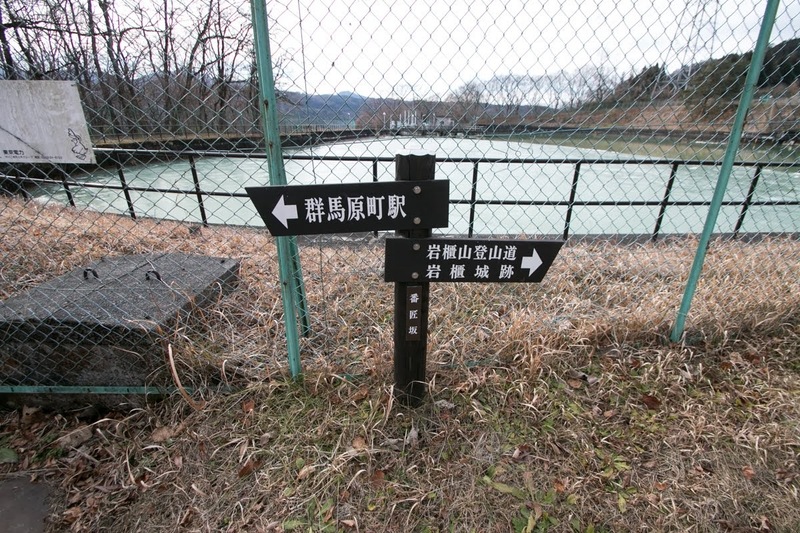 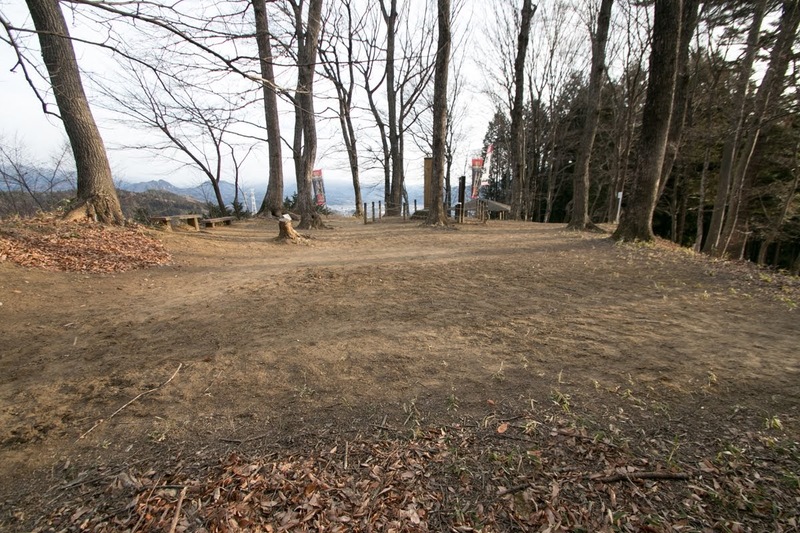 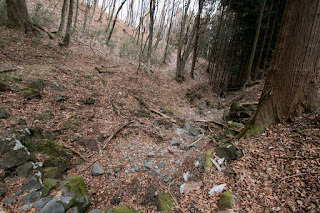 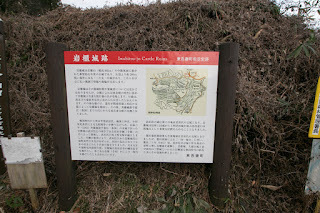 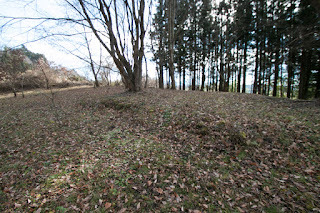 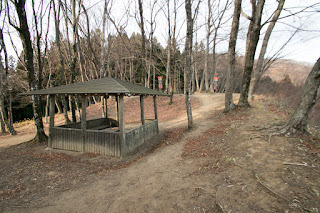 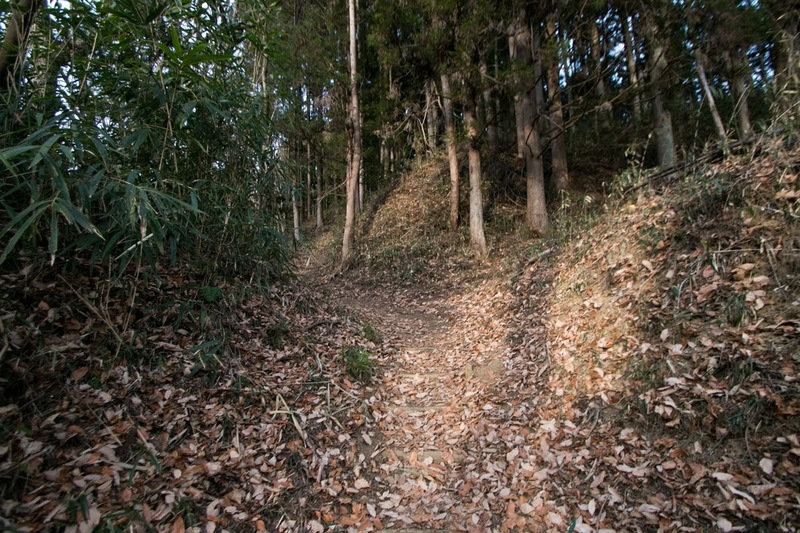 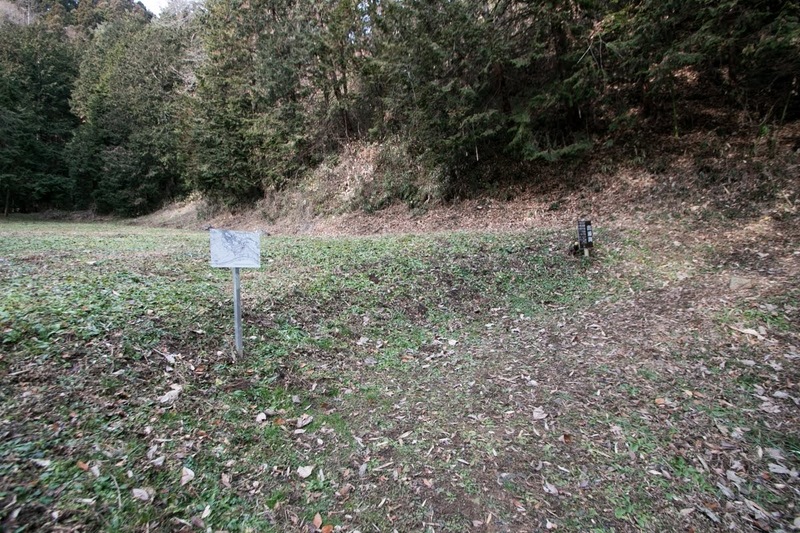 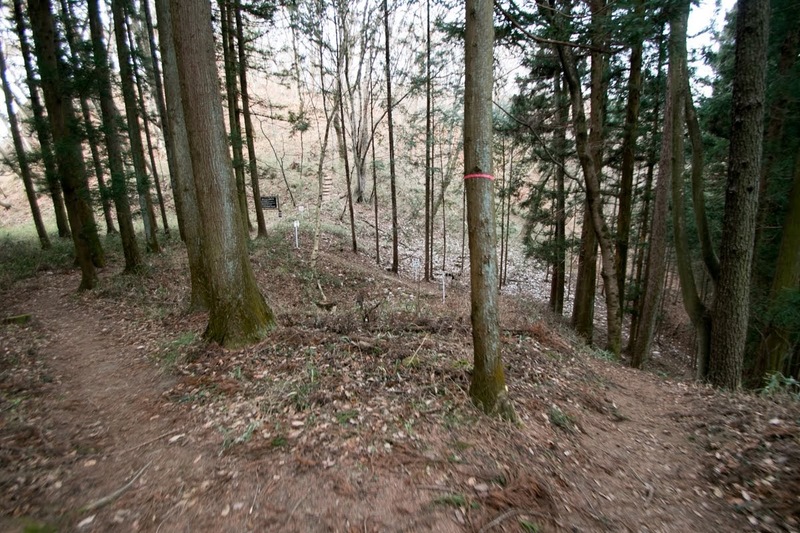 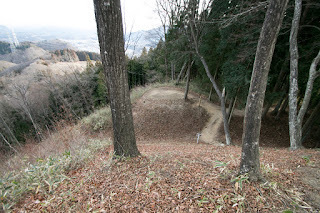 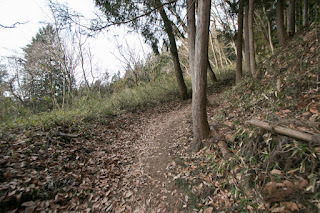 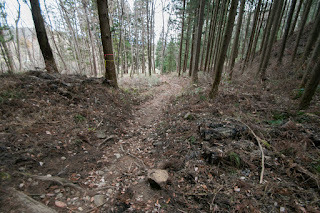 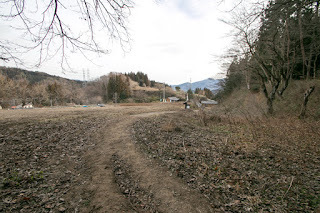 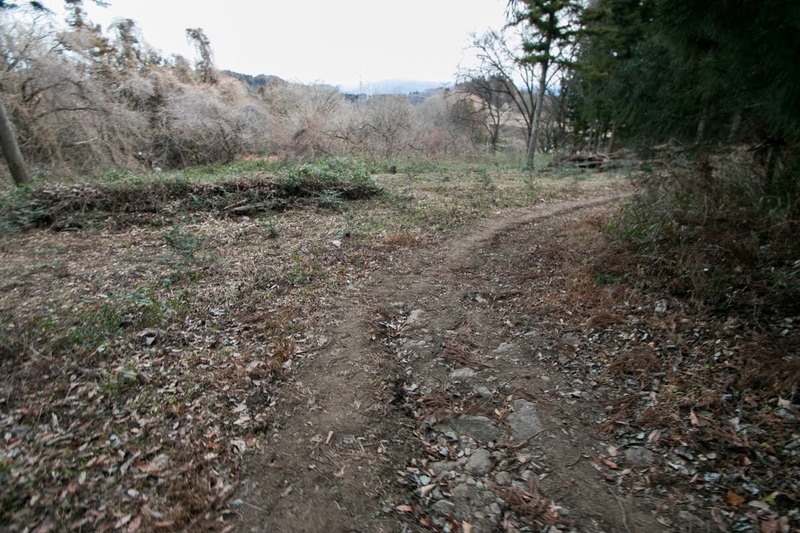 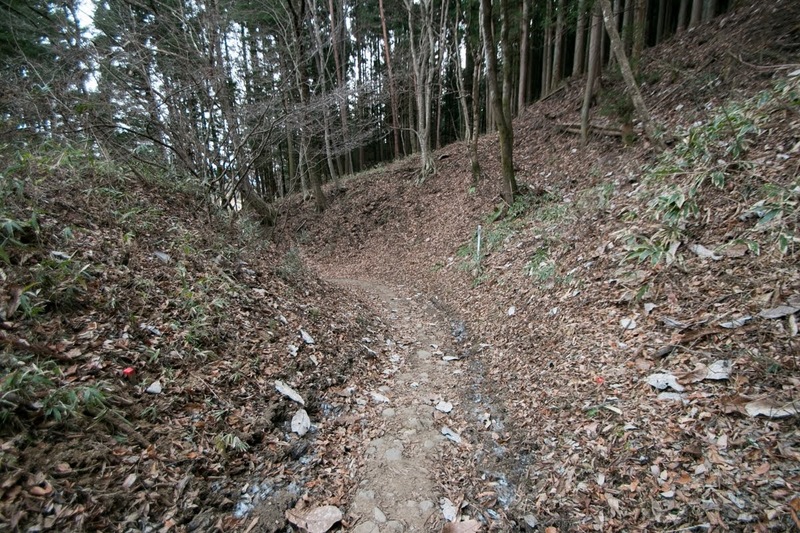 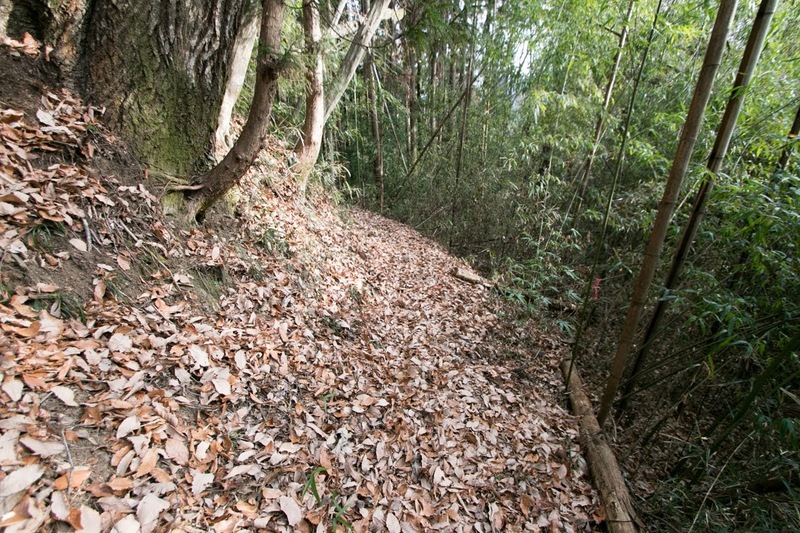 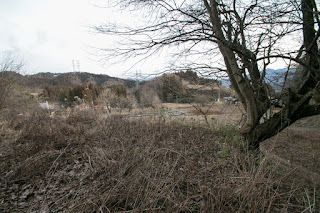 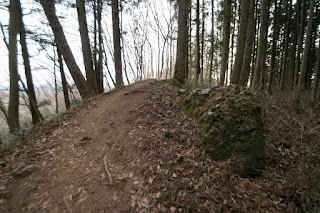 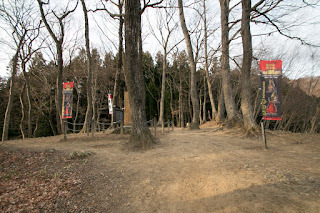 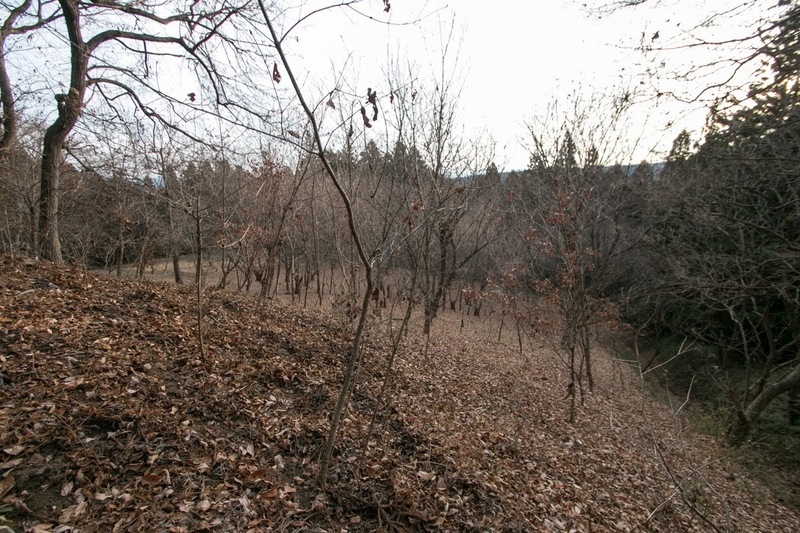 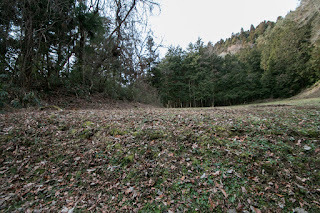 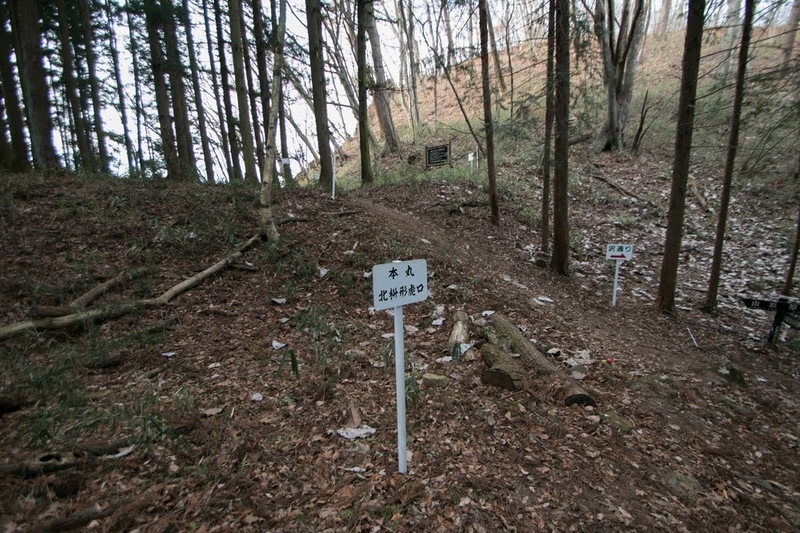 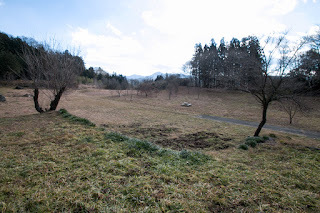 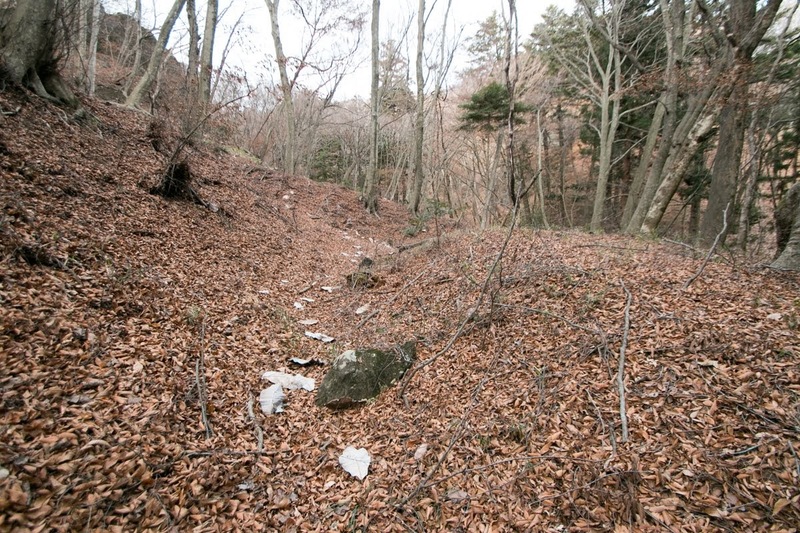 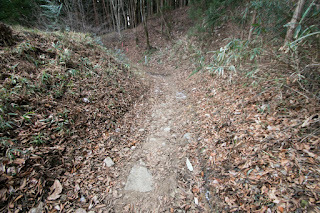 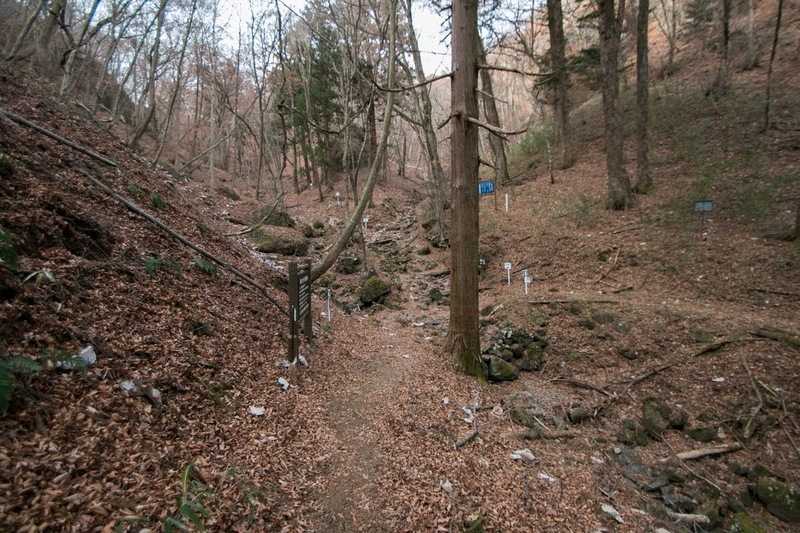 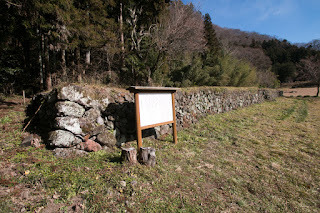 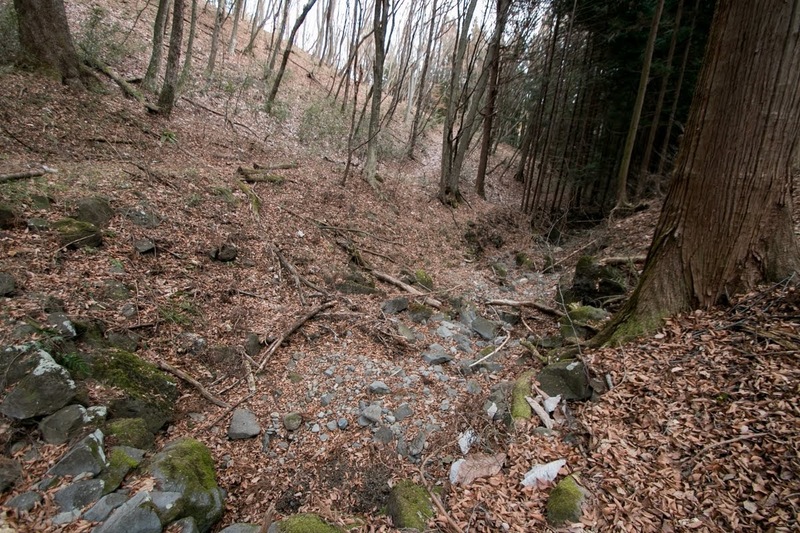 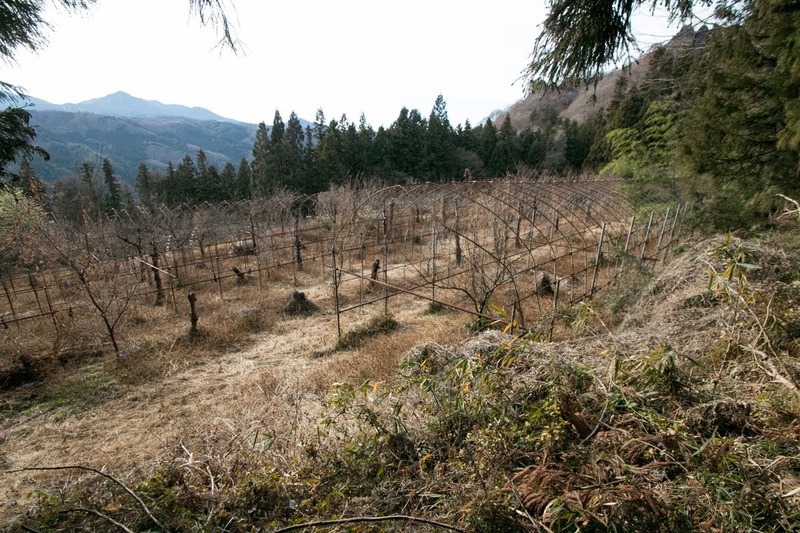 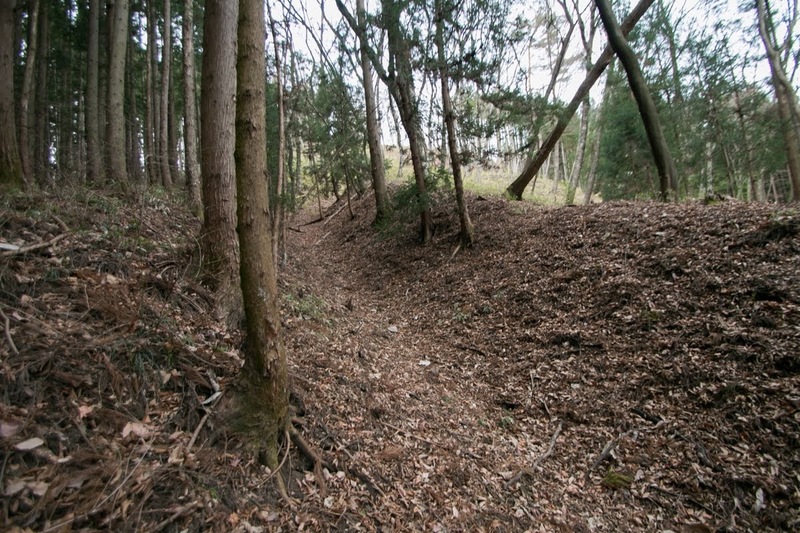 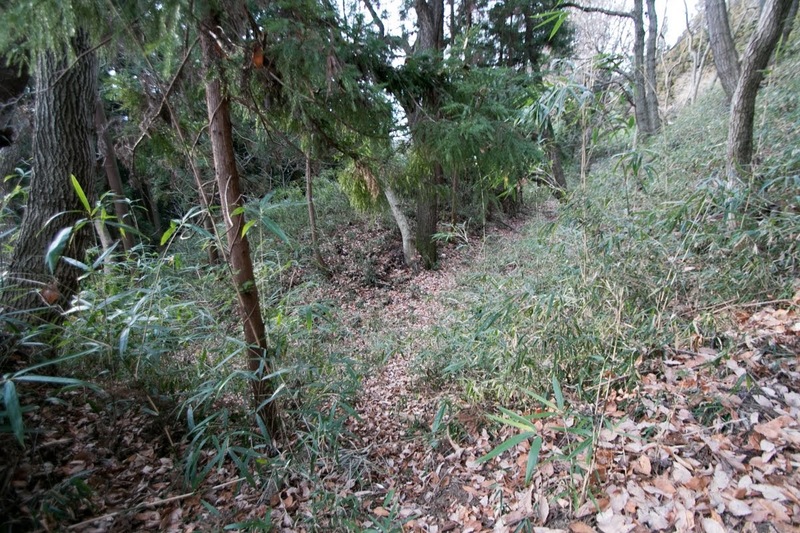 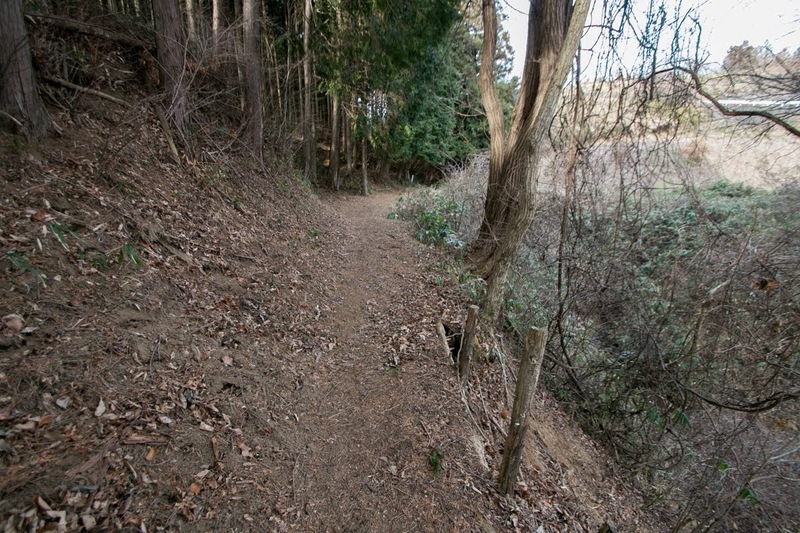 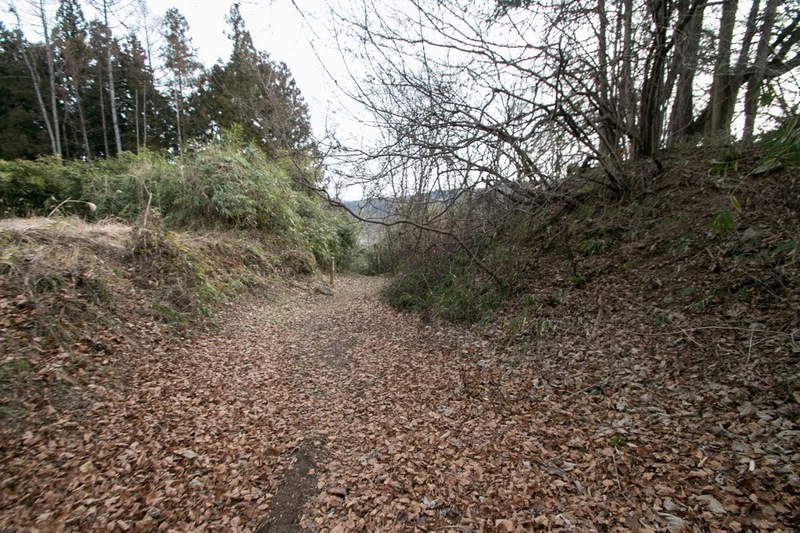 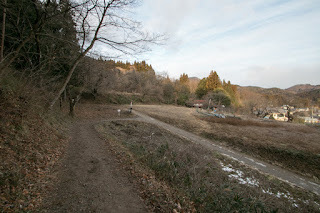 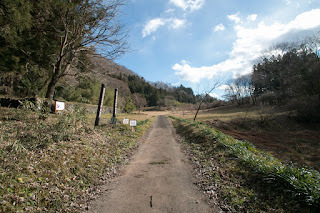 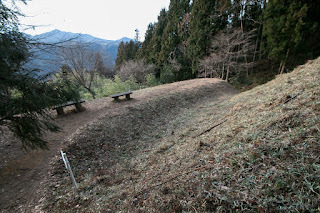 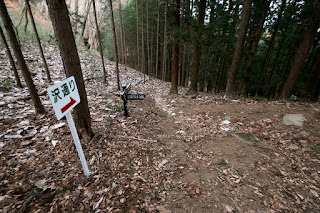 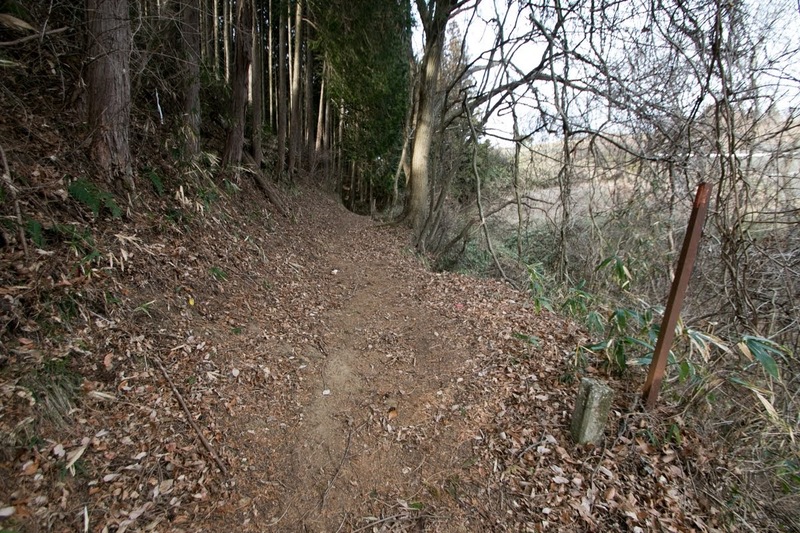 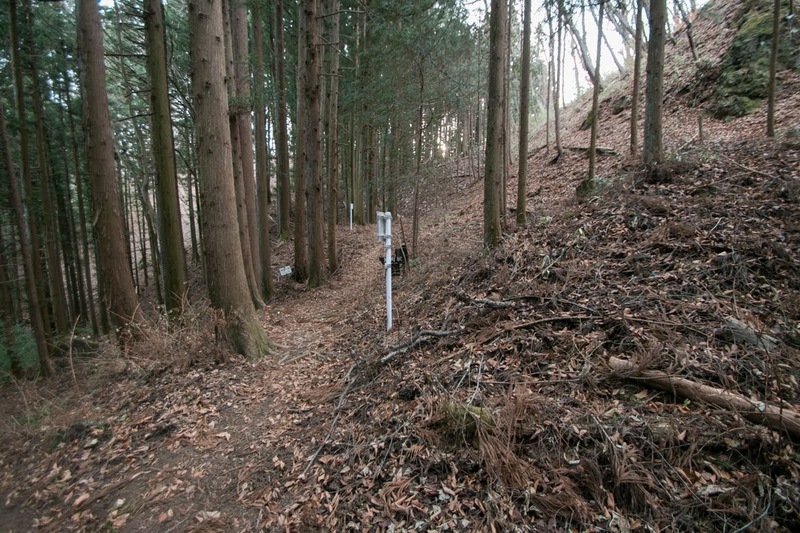 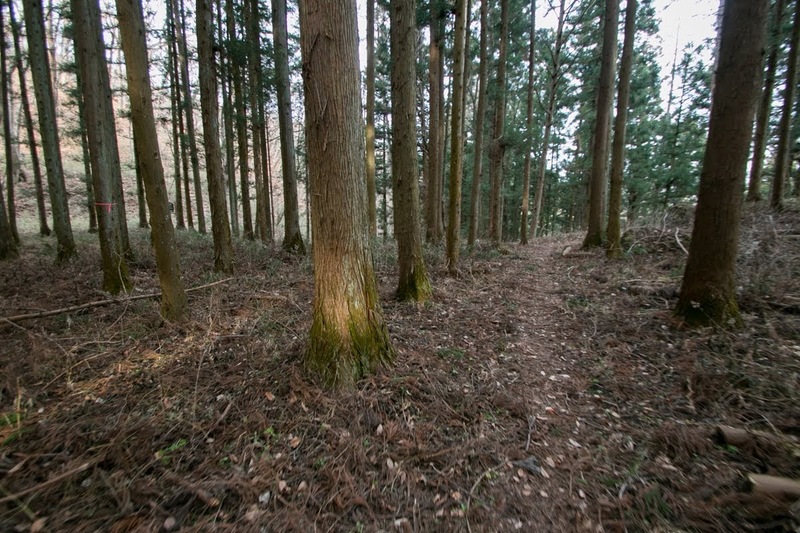 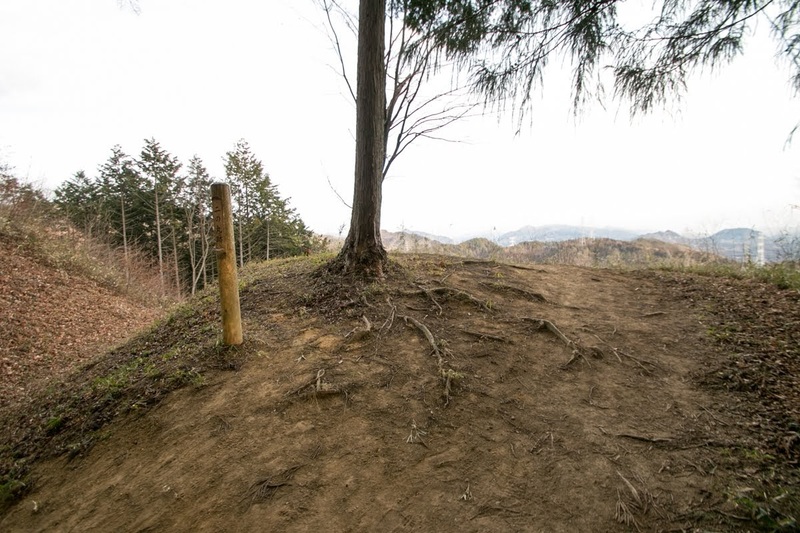 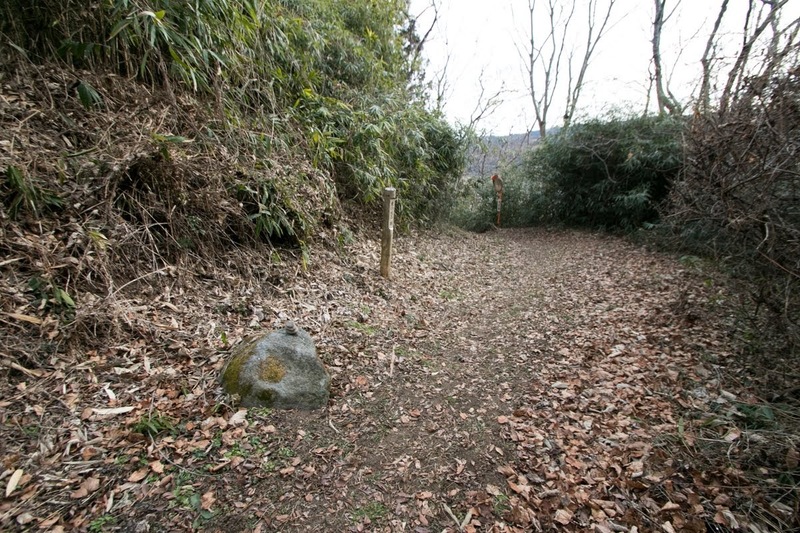 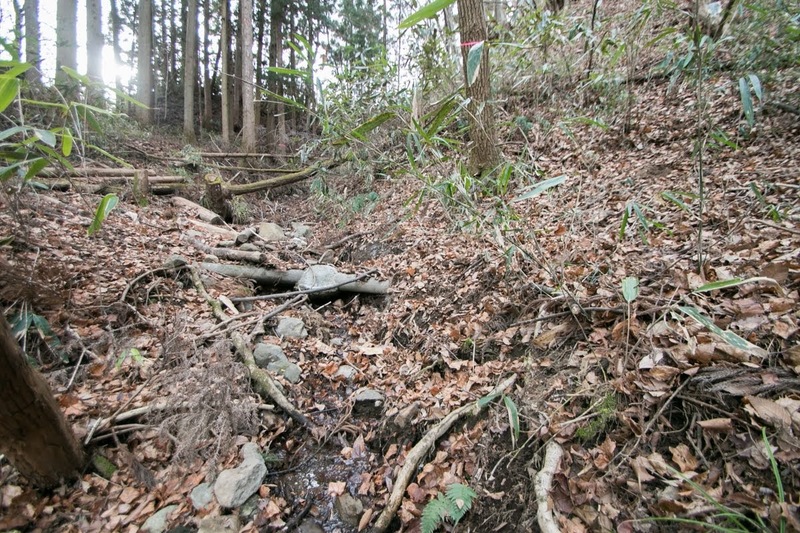 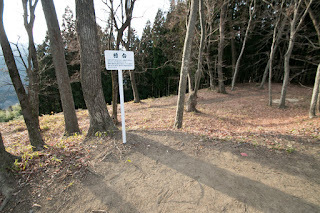 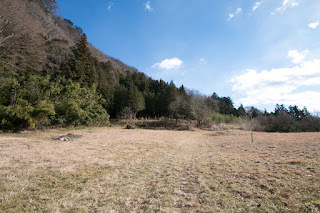 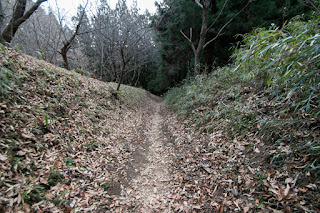 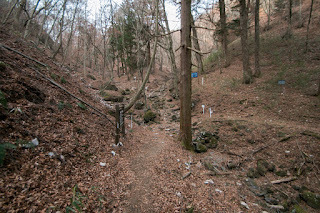 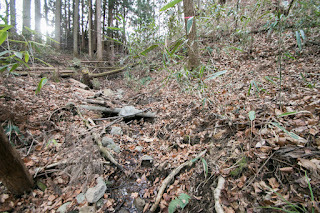 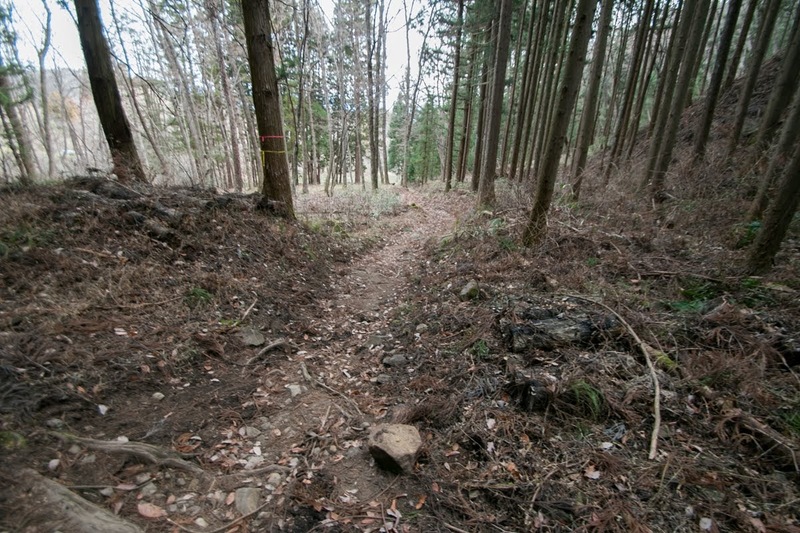 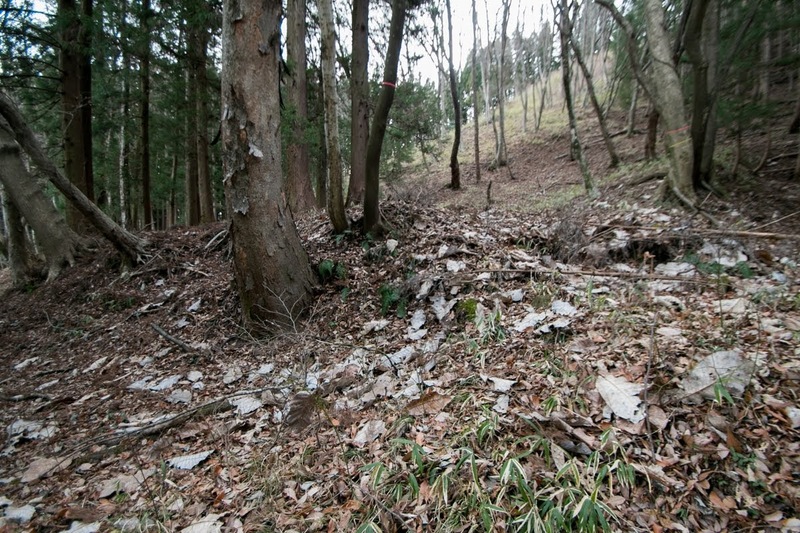 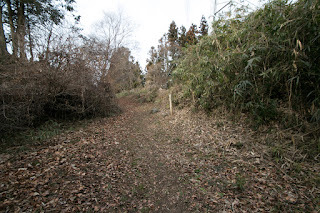 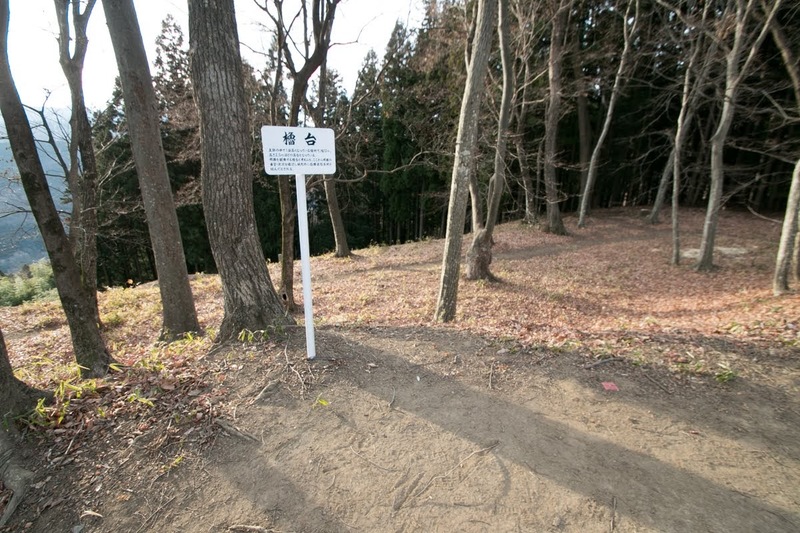 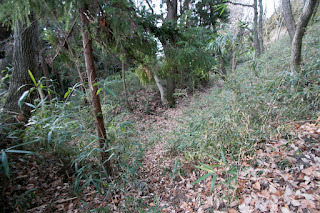 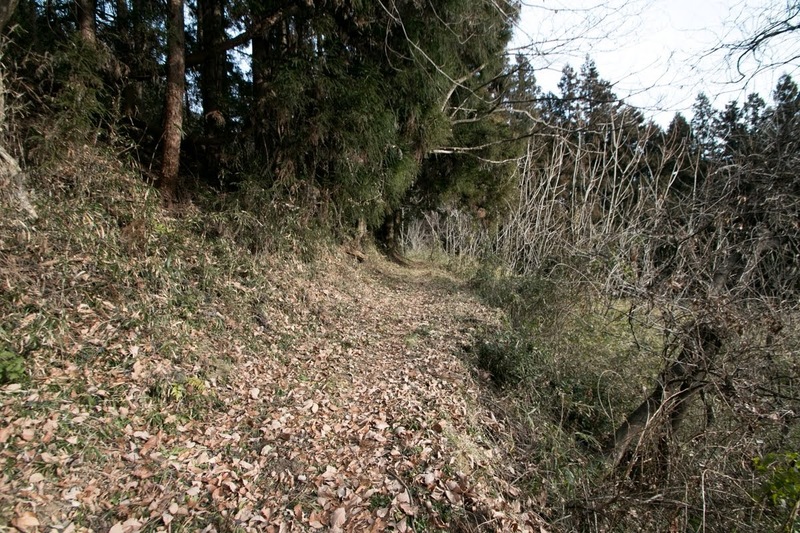 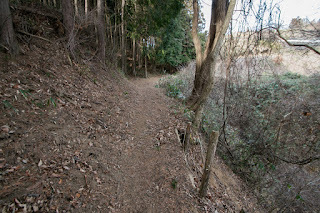 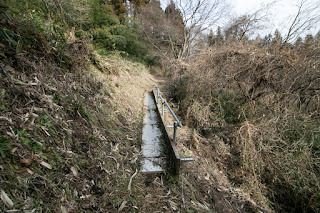 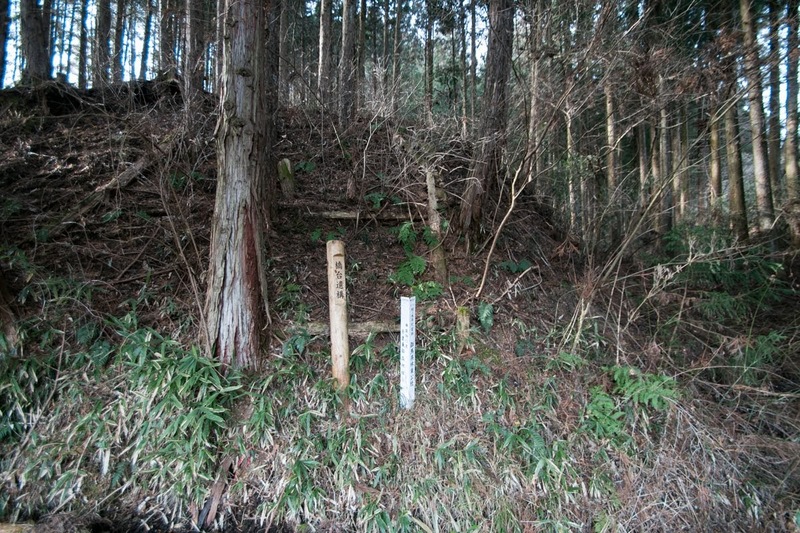 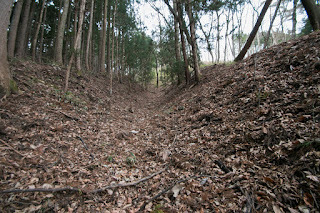 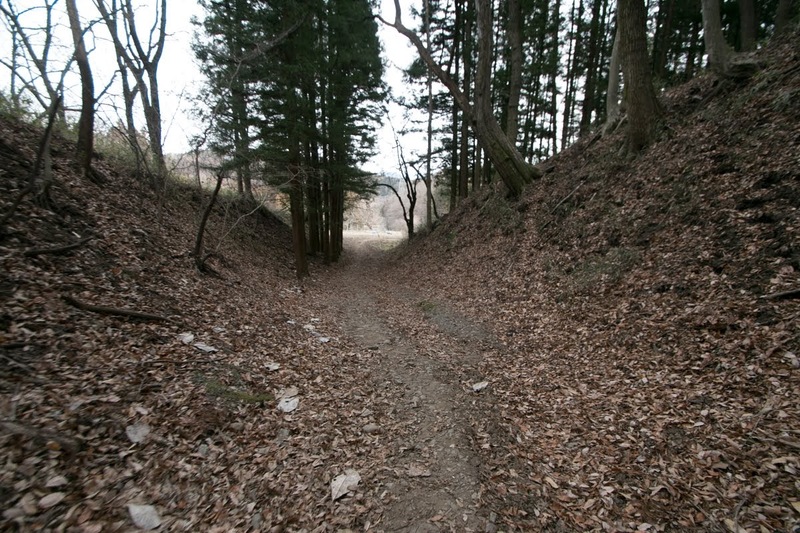 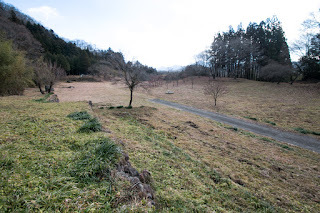 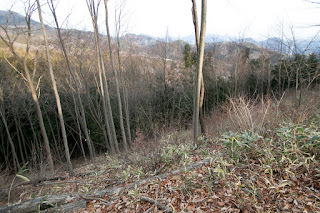 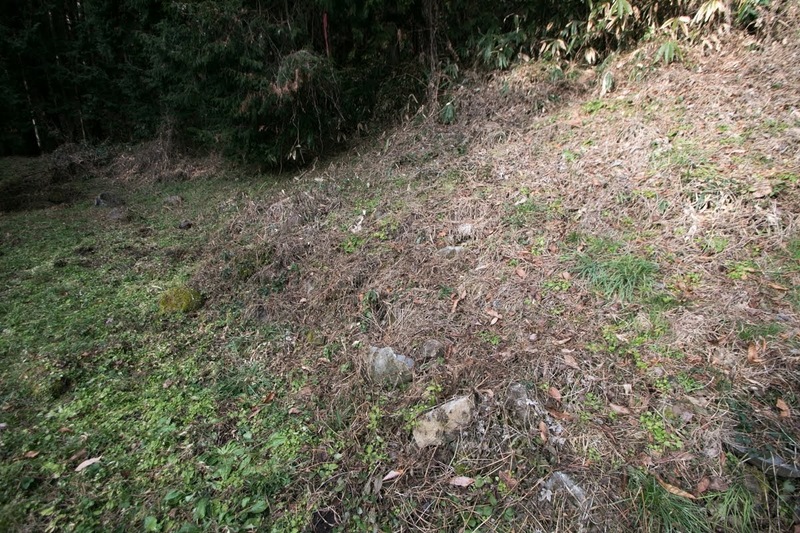 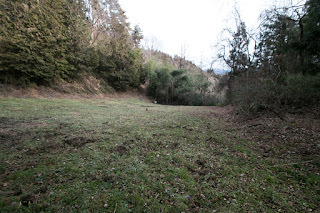 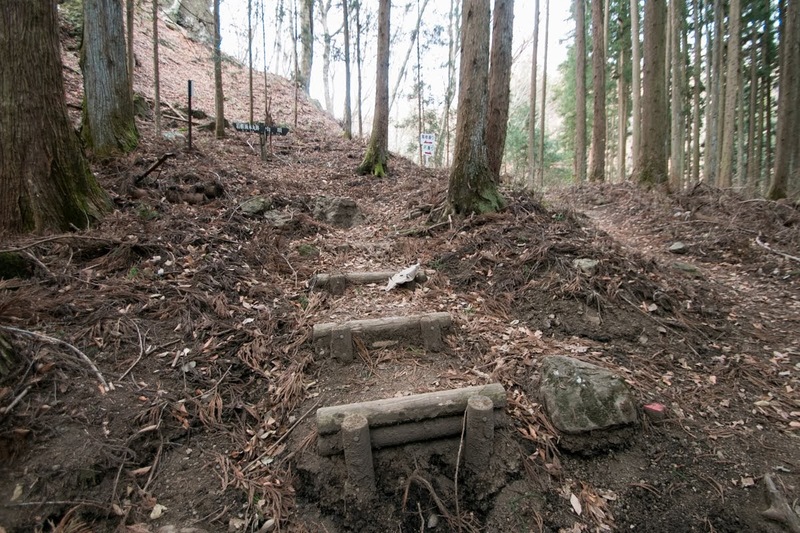 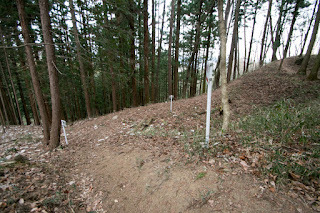 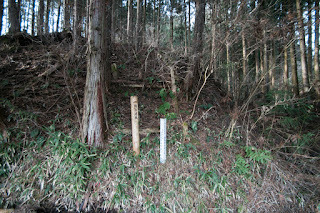 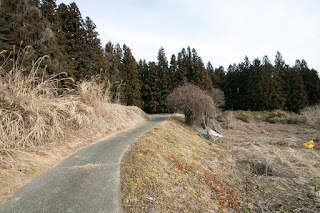 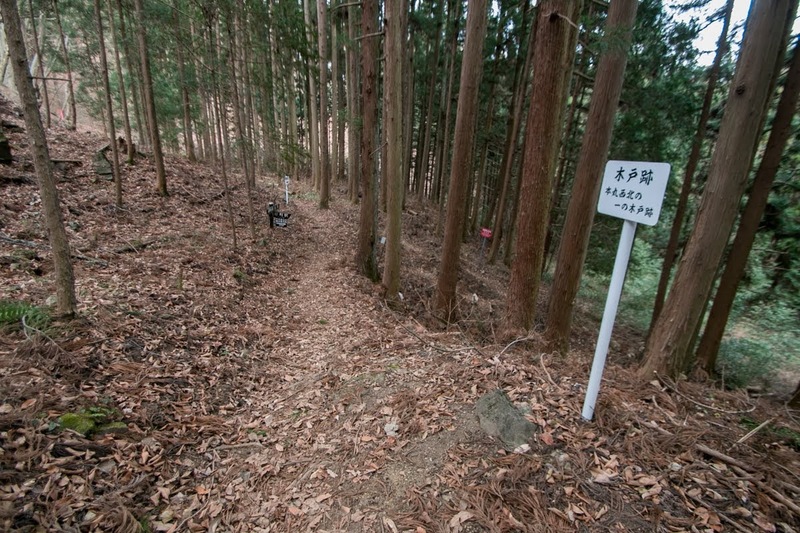 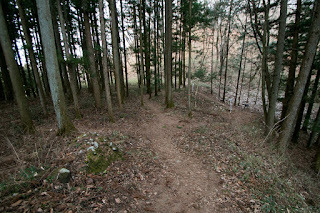 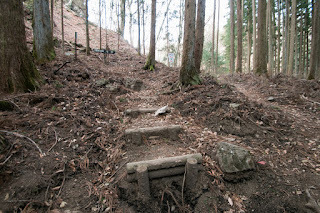 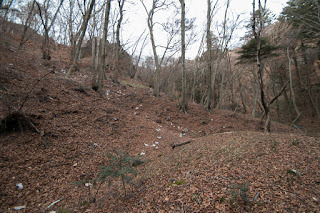 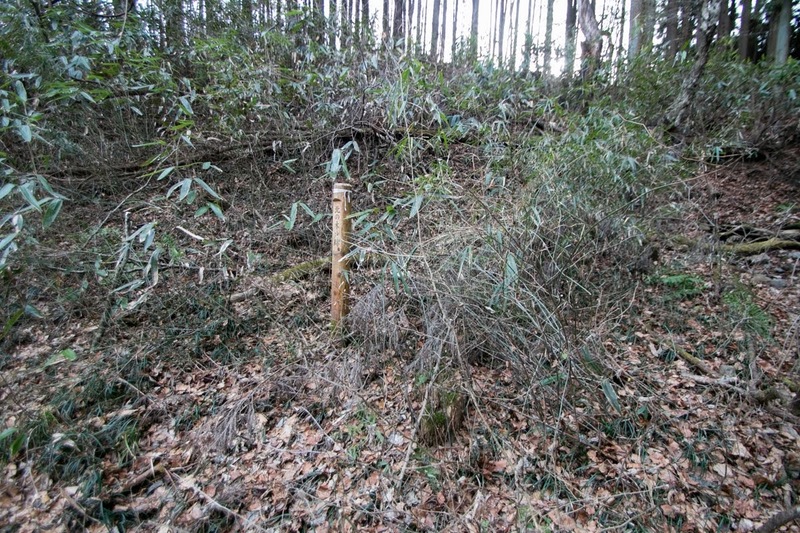 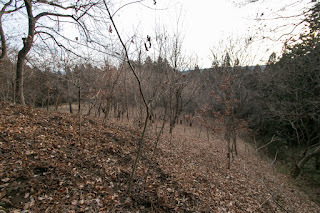 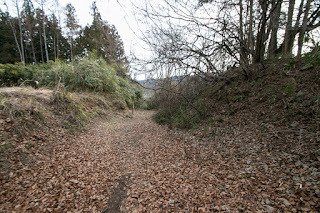 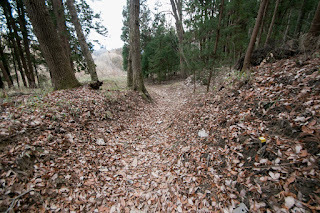 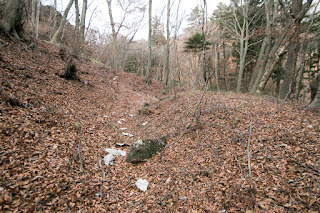 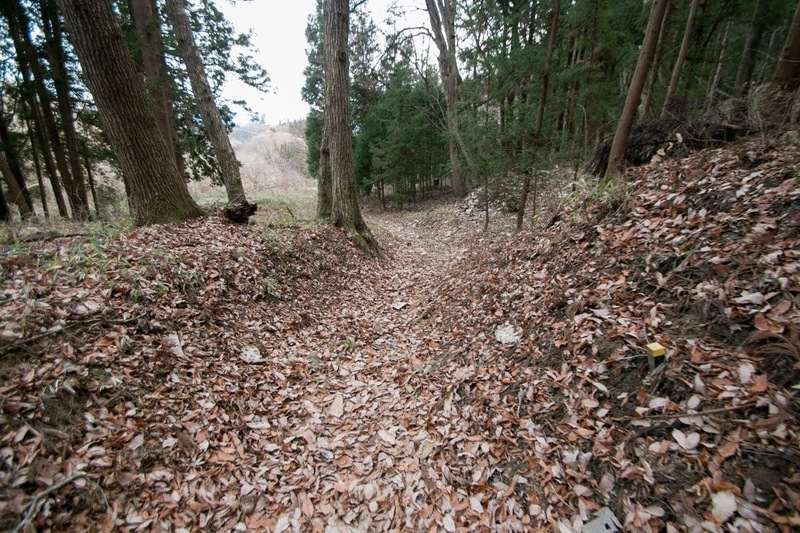 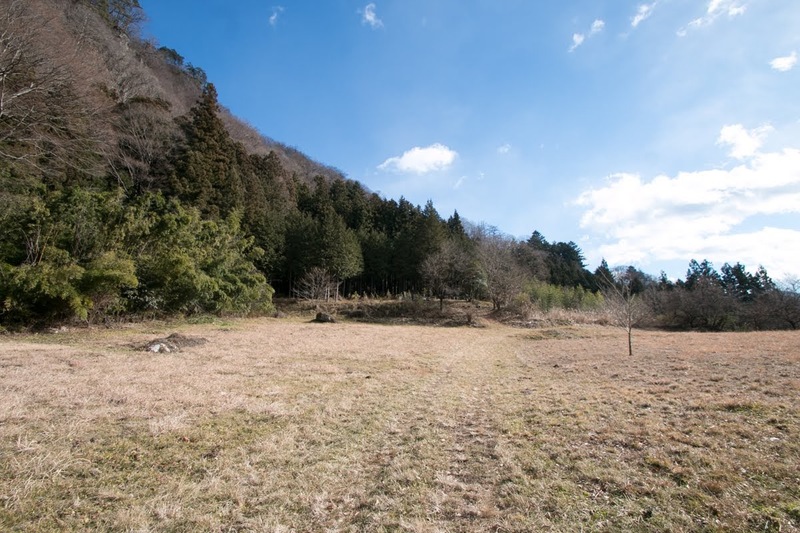 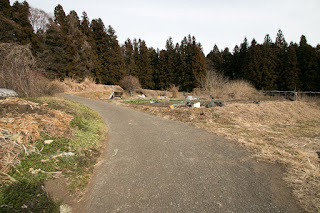 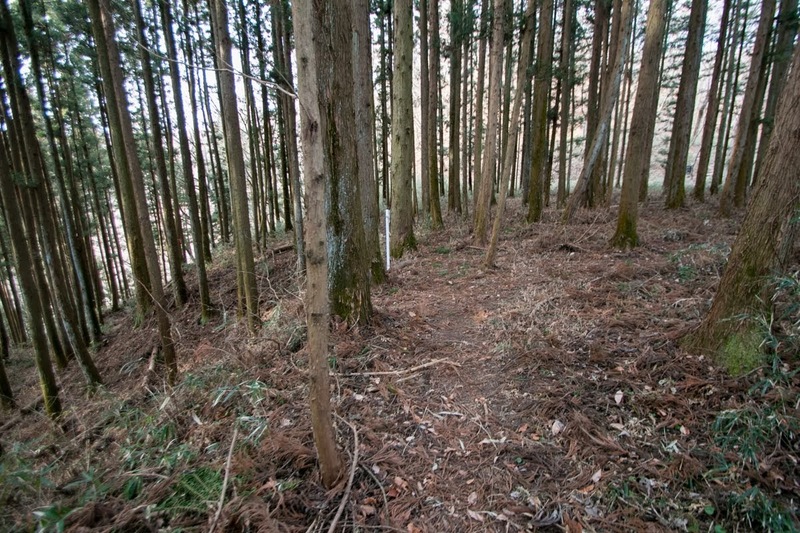 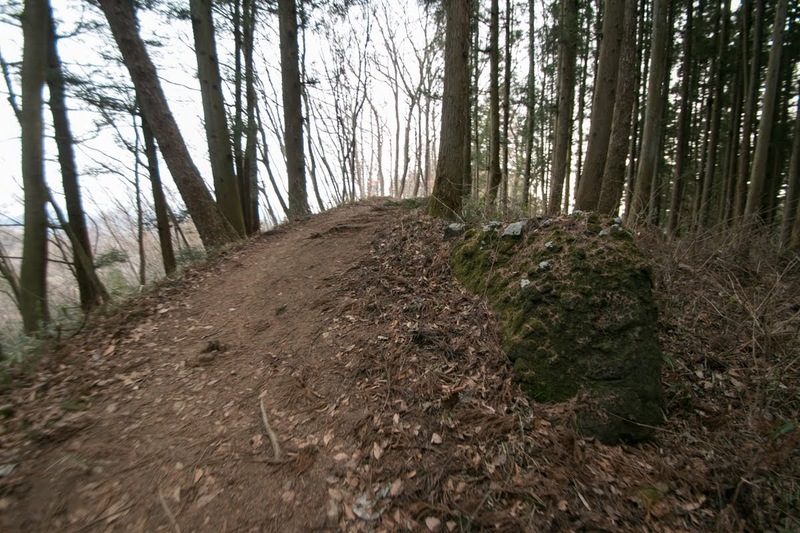 The site of the castle is in the the middle of long valley made by Agatsumagawa river, a tributary of Tone river, and along this valley Sinshu Kaido way pass from Takasaki city to Torii Toge path, the border of Kozuke province and Shinano province (Nagano prefecture). 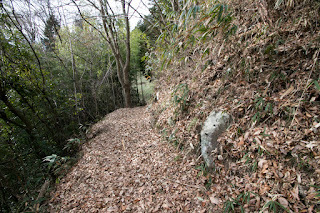 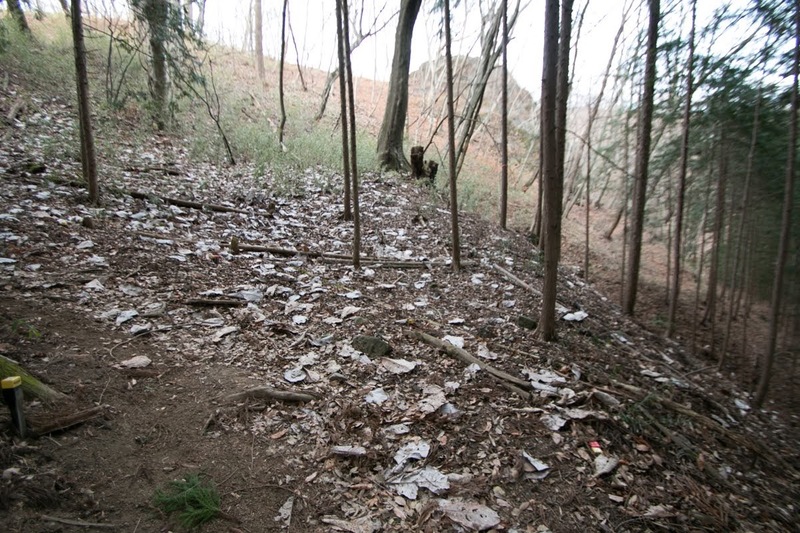 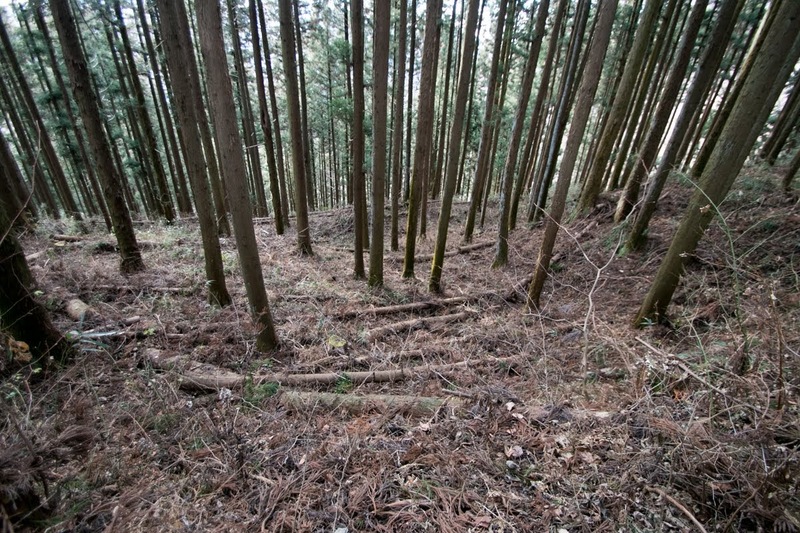 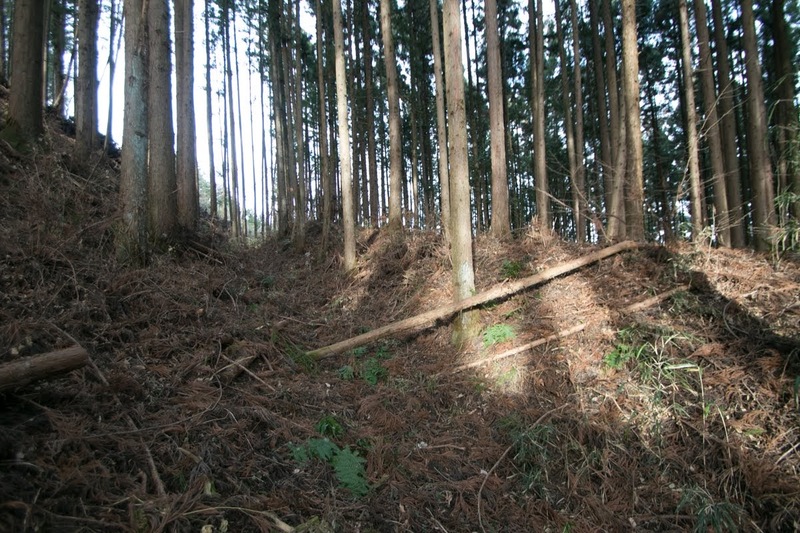 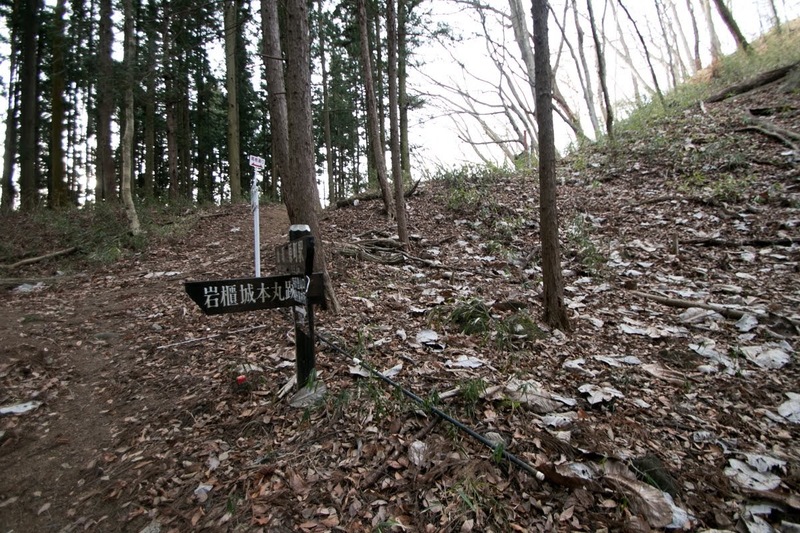 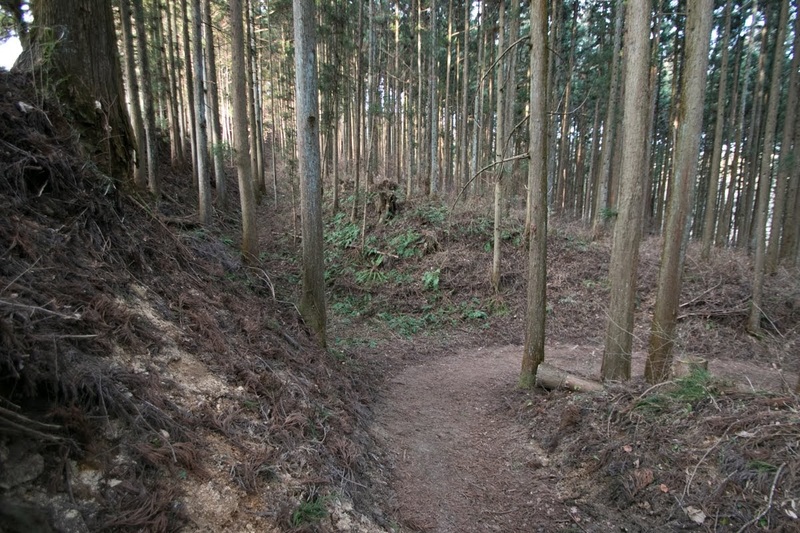 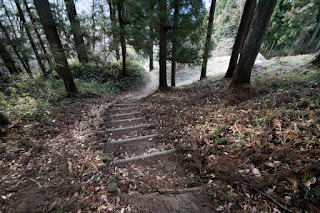 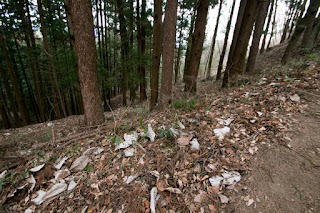 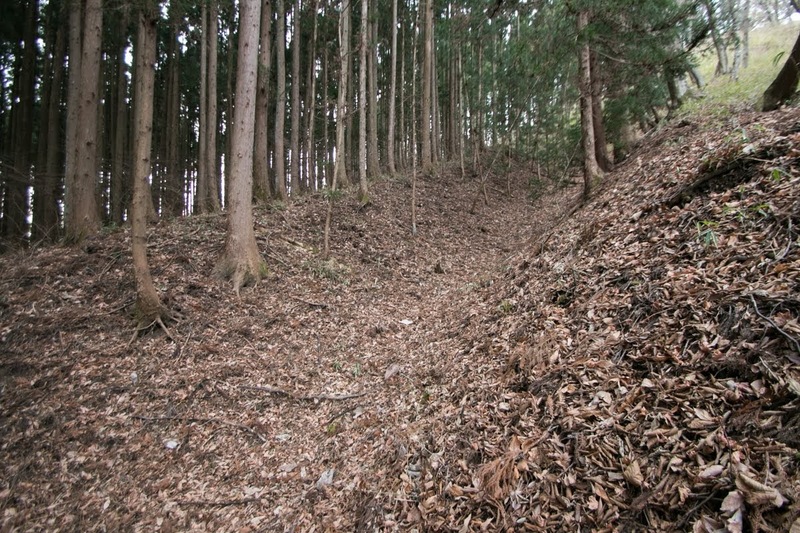 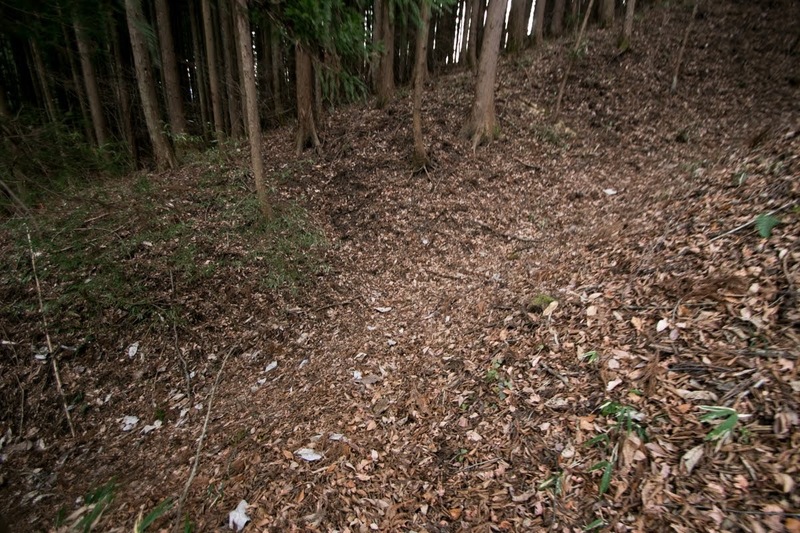 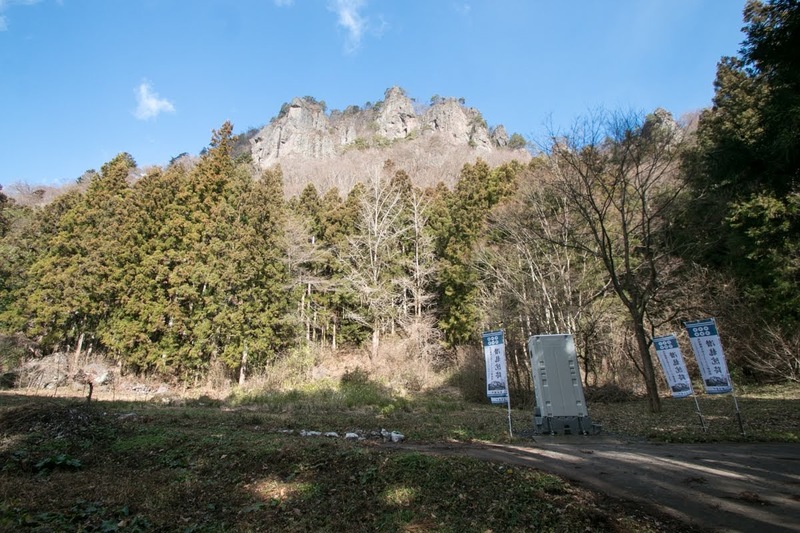 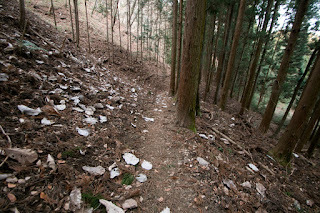 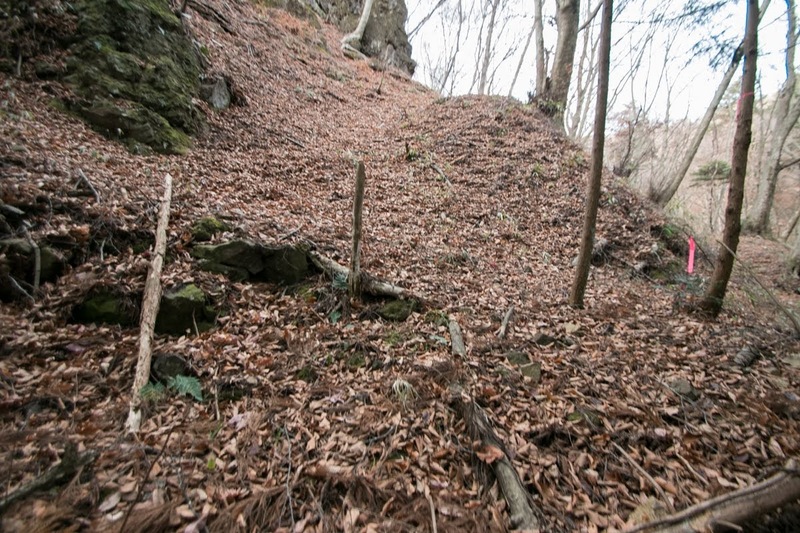 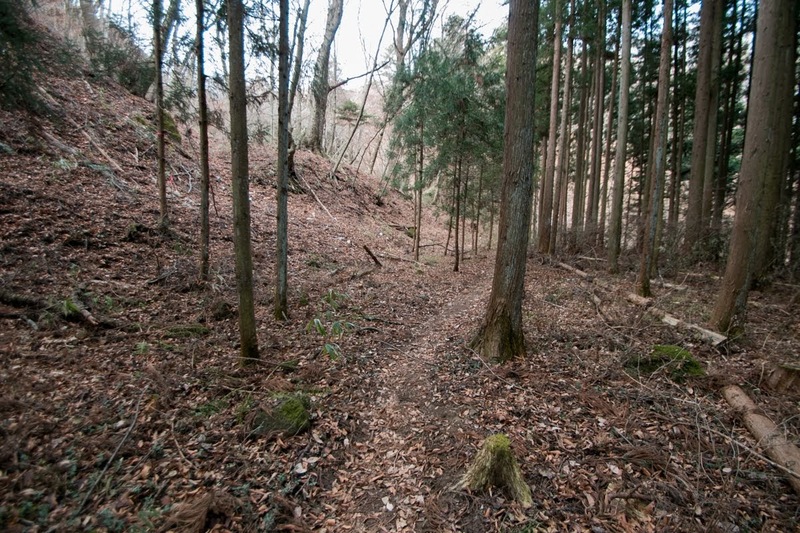 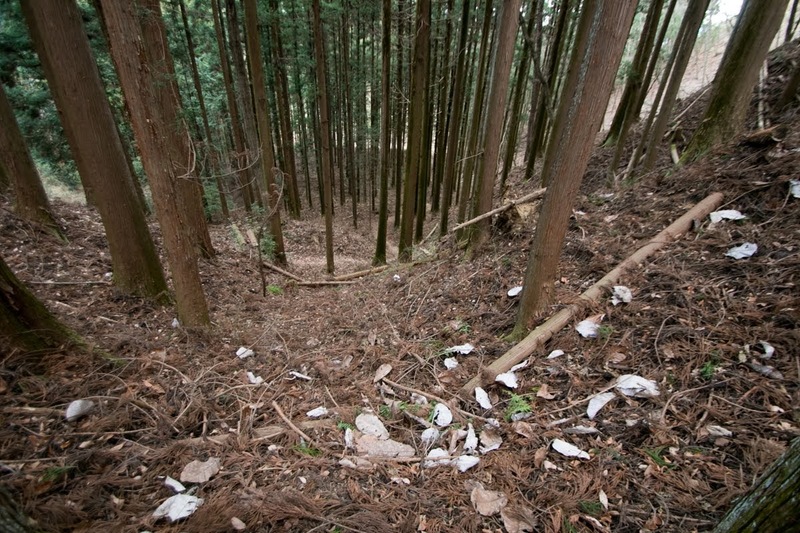 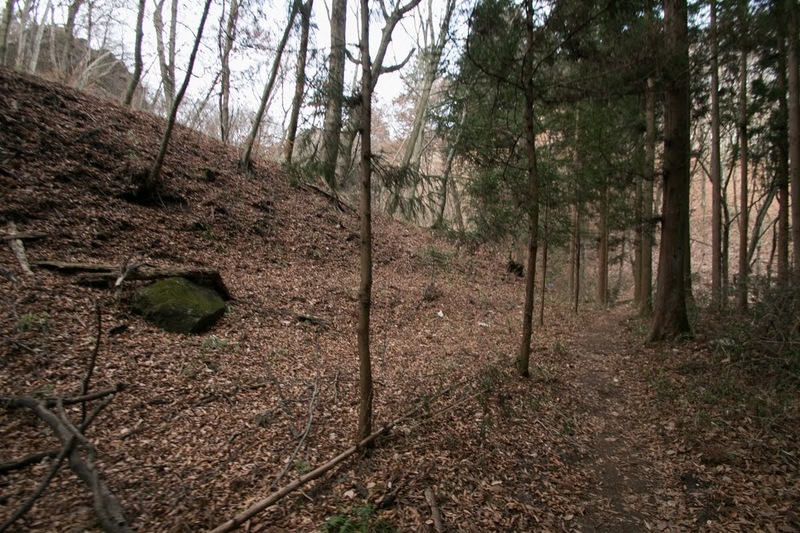 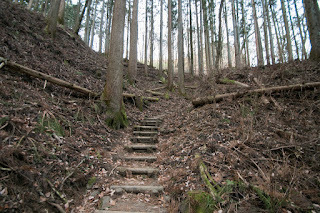 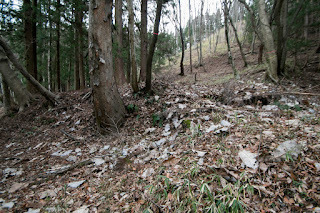 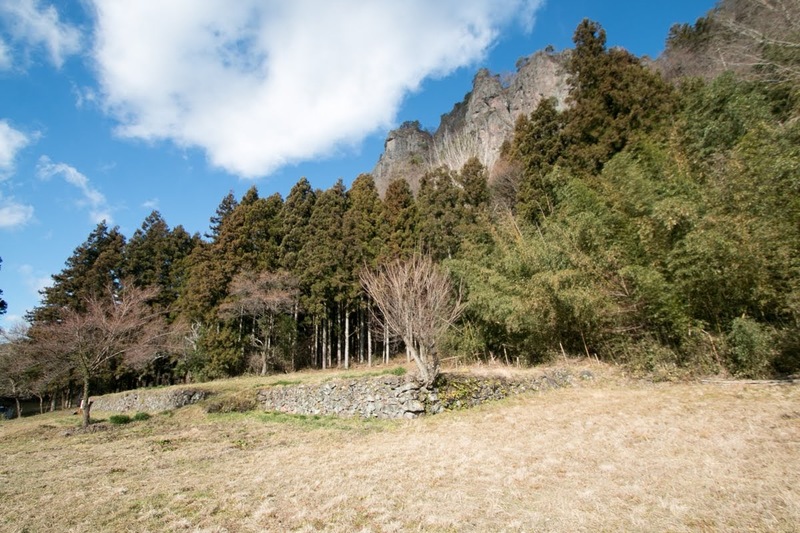 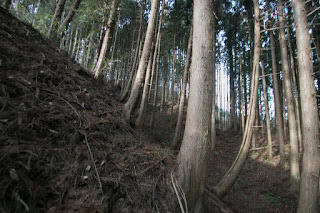 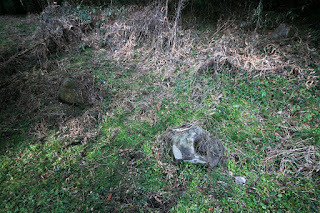 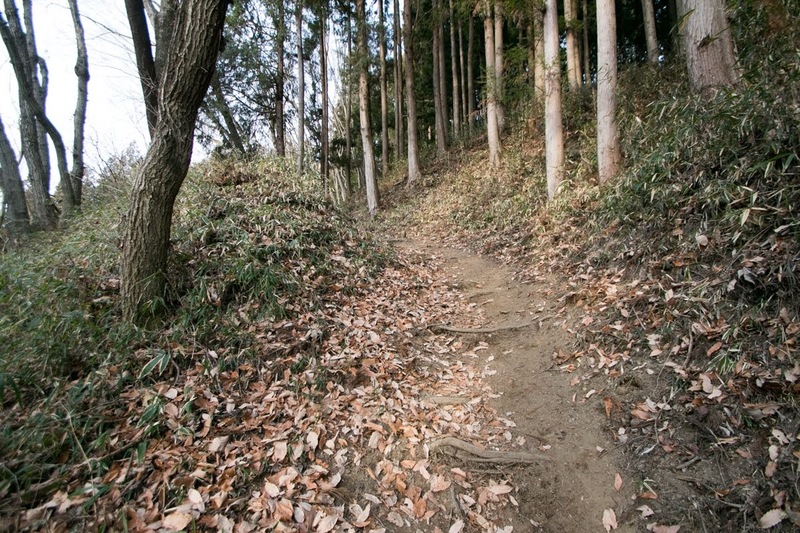 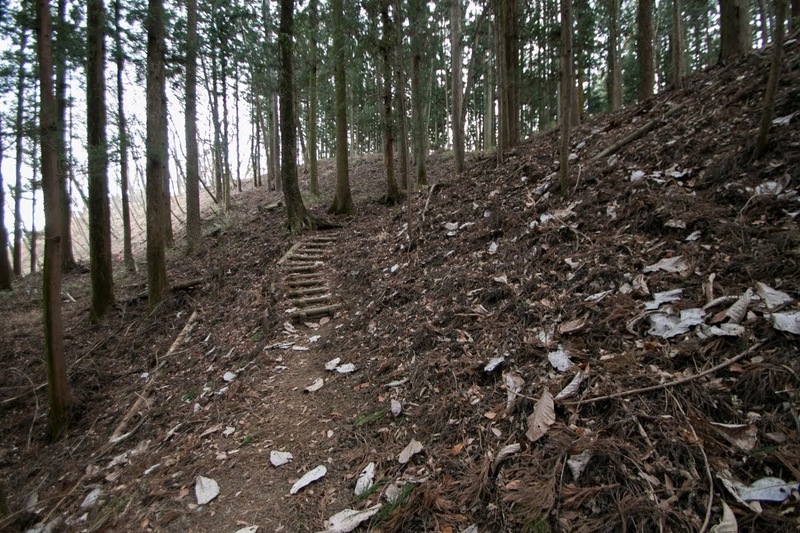 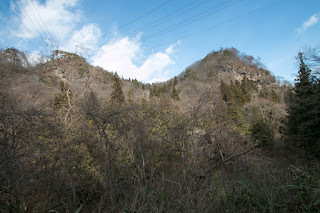 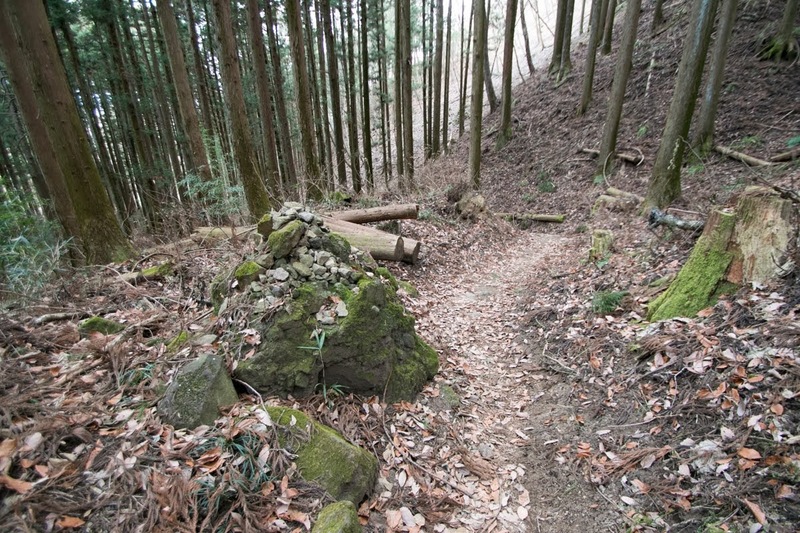 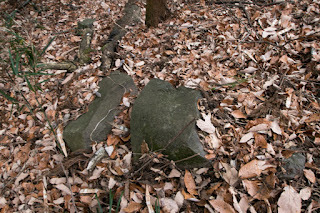 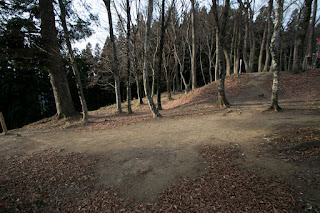 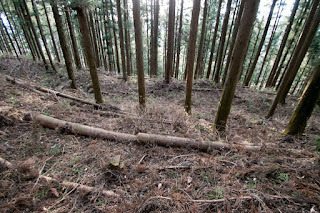 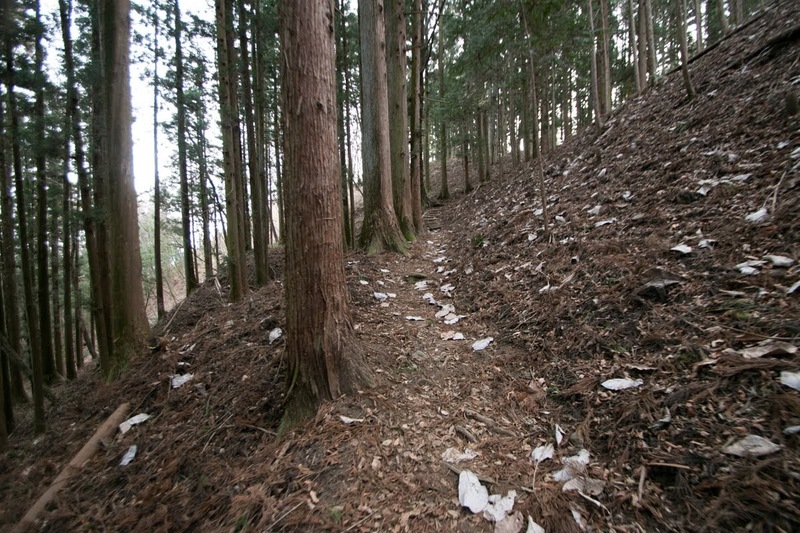 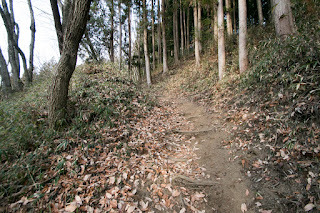 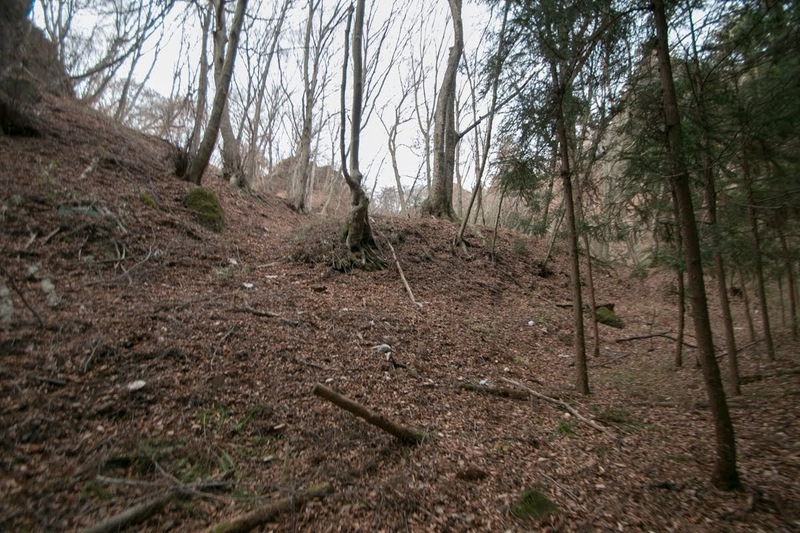 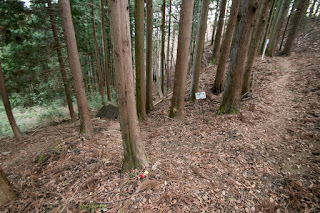 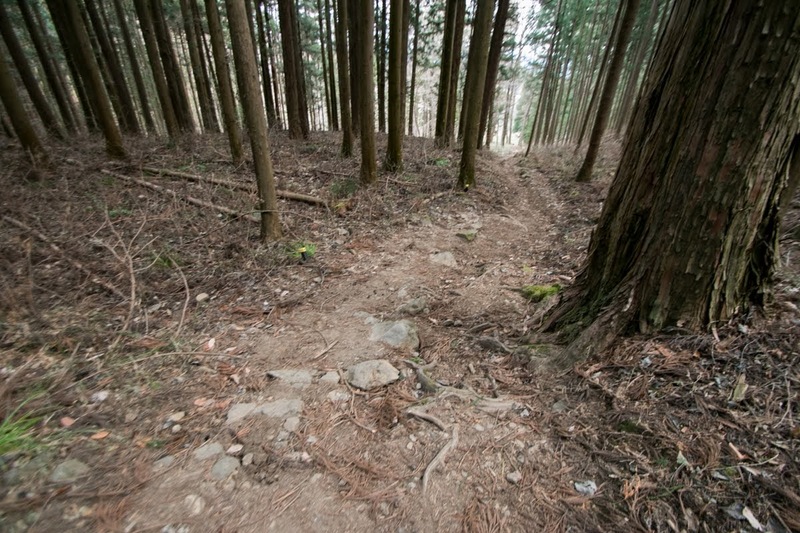 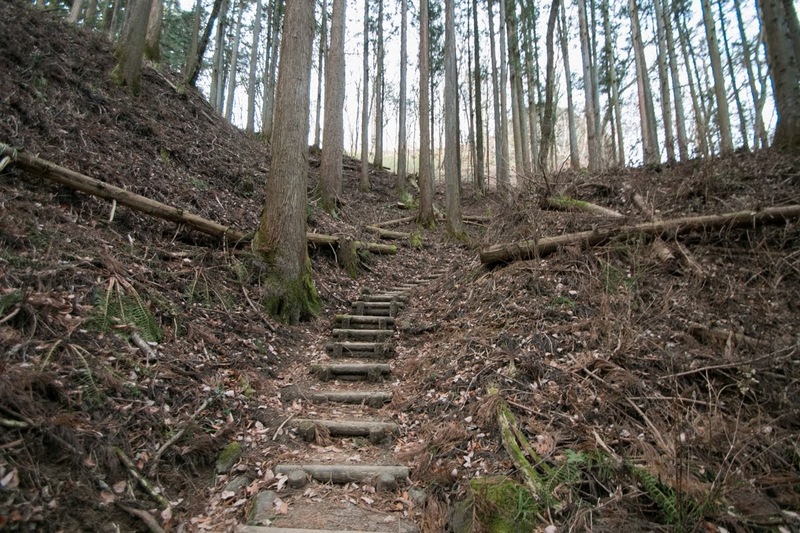 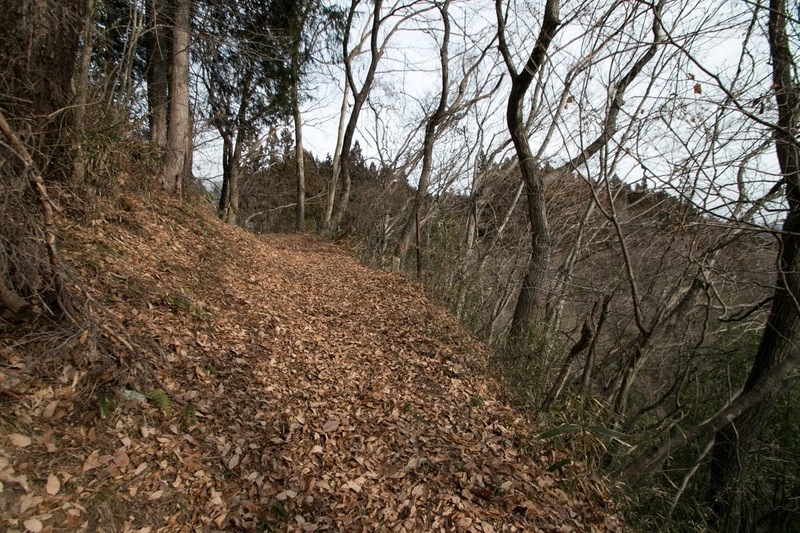 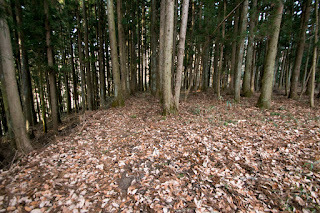 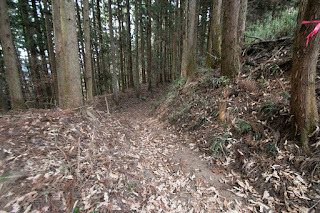 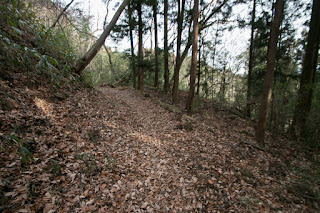 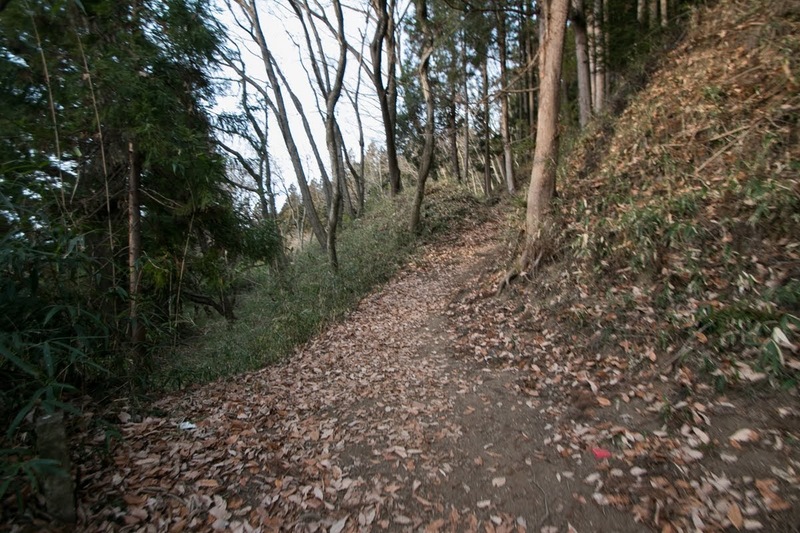 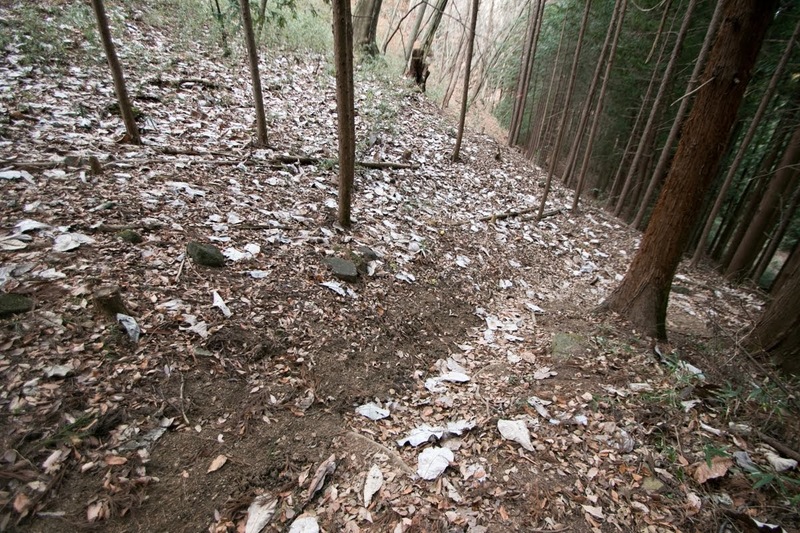 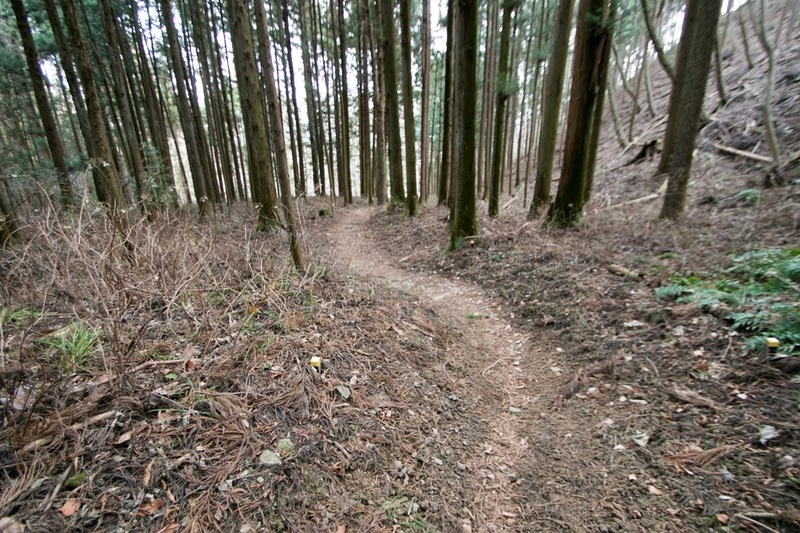 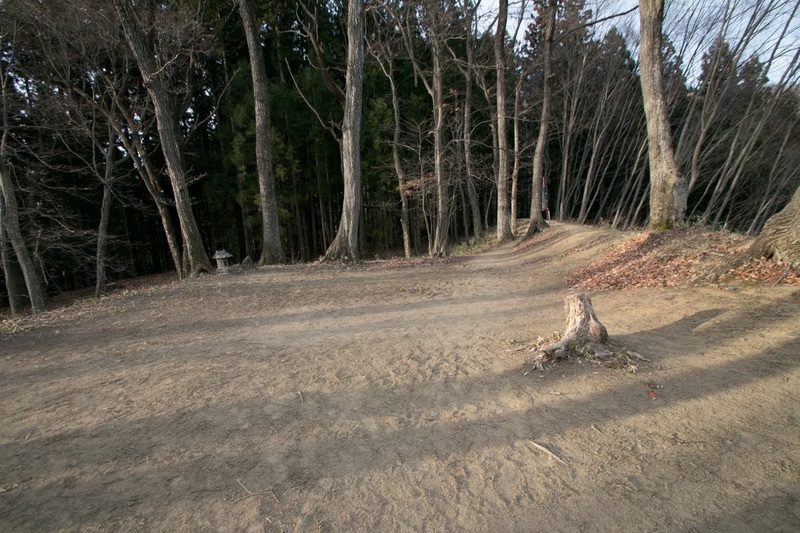 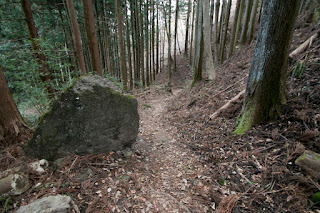 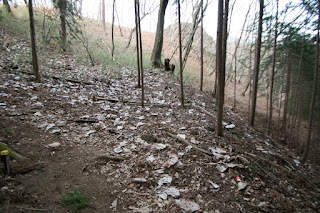 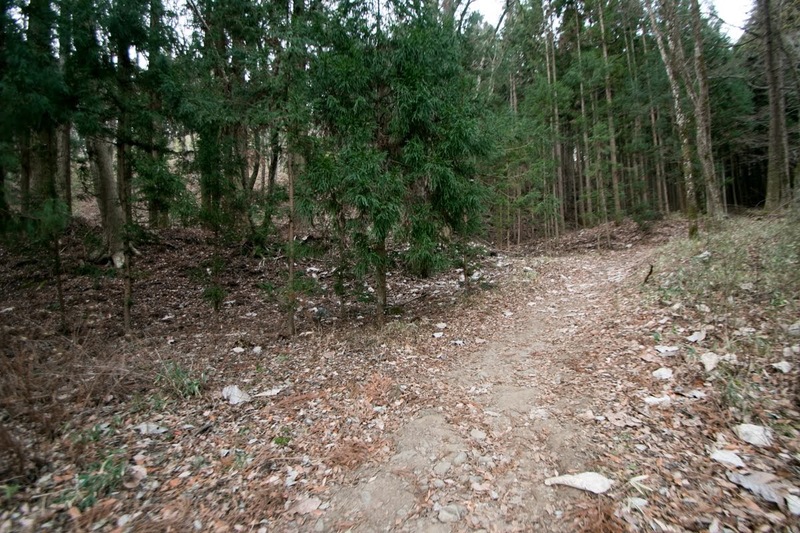 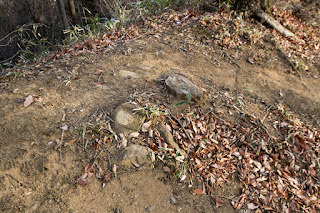 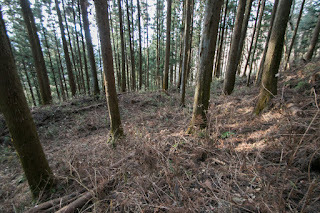 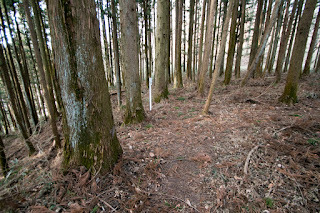 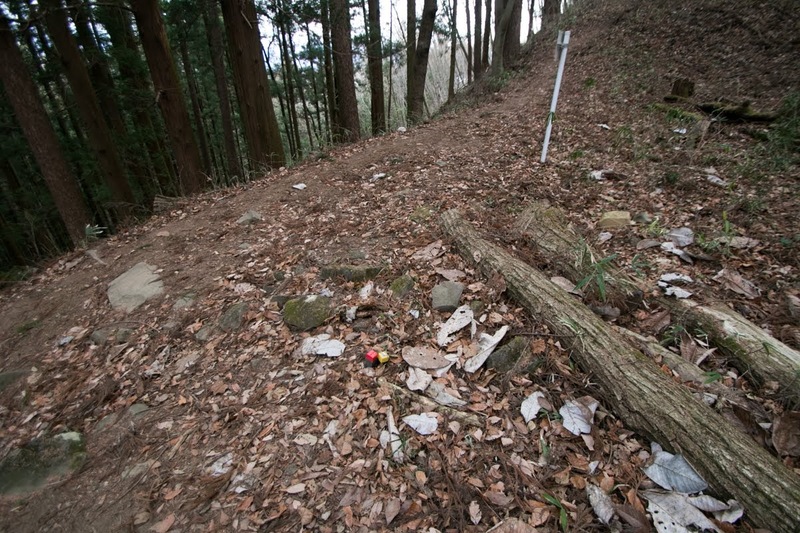 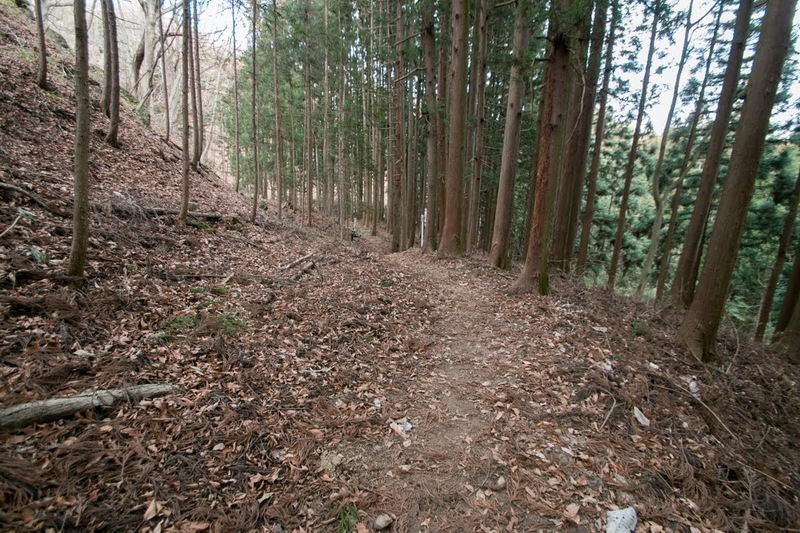 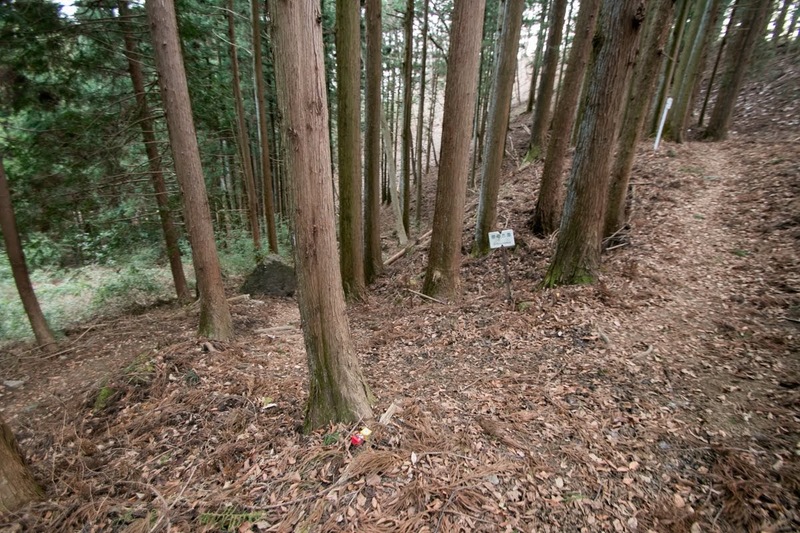 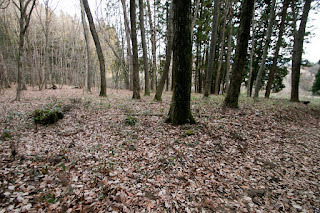 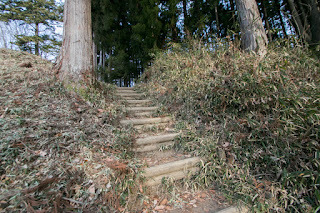 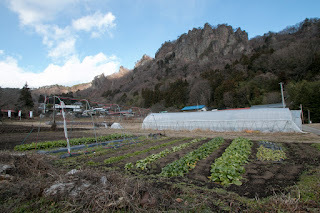 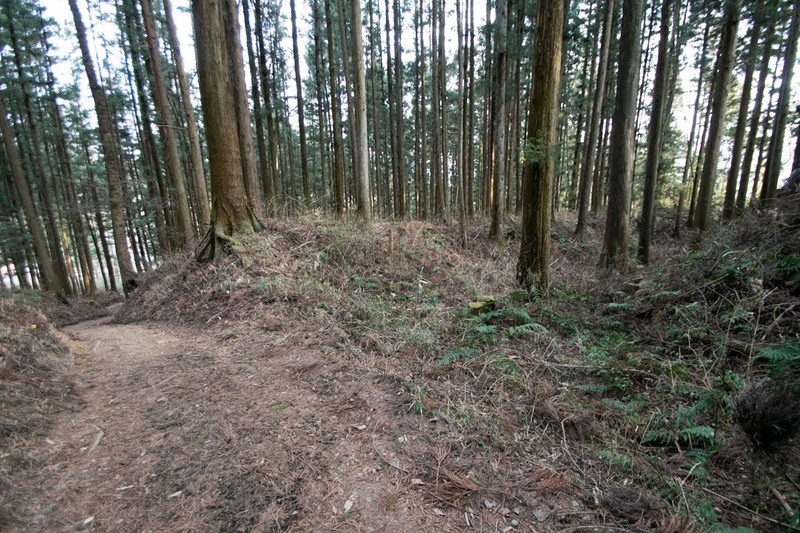 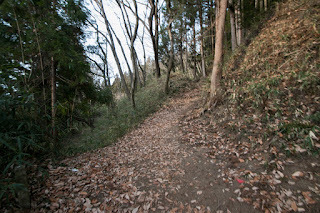 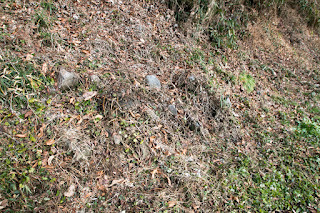 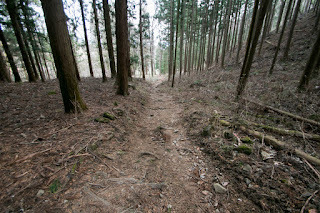 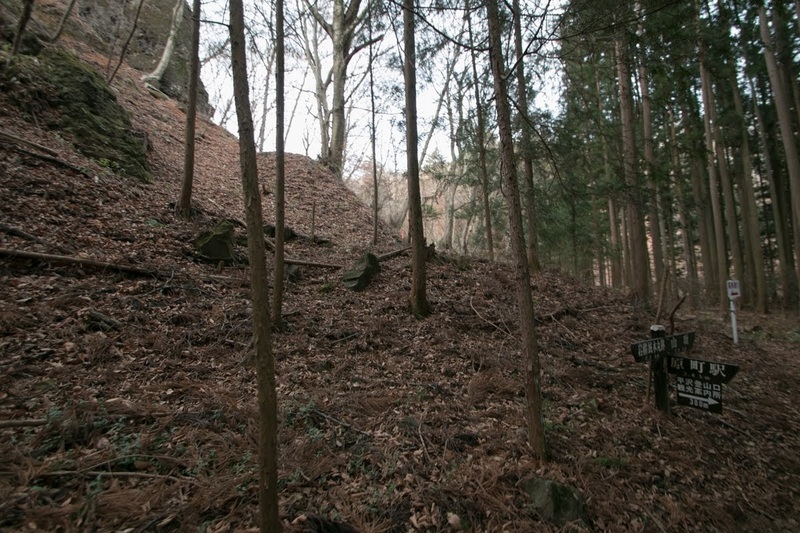 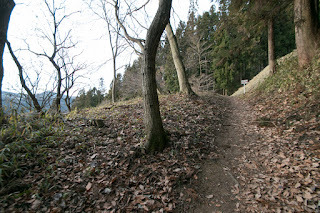 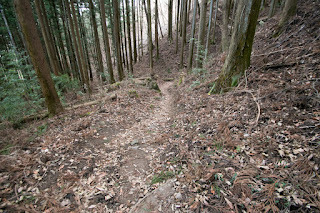 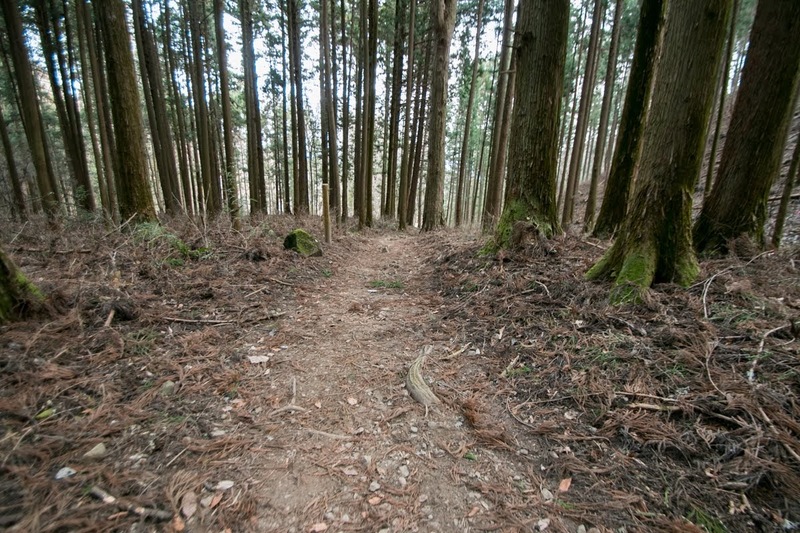 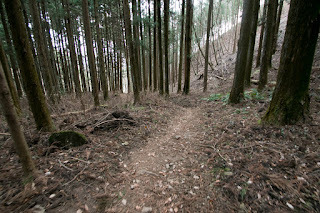 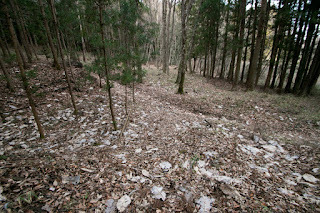 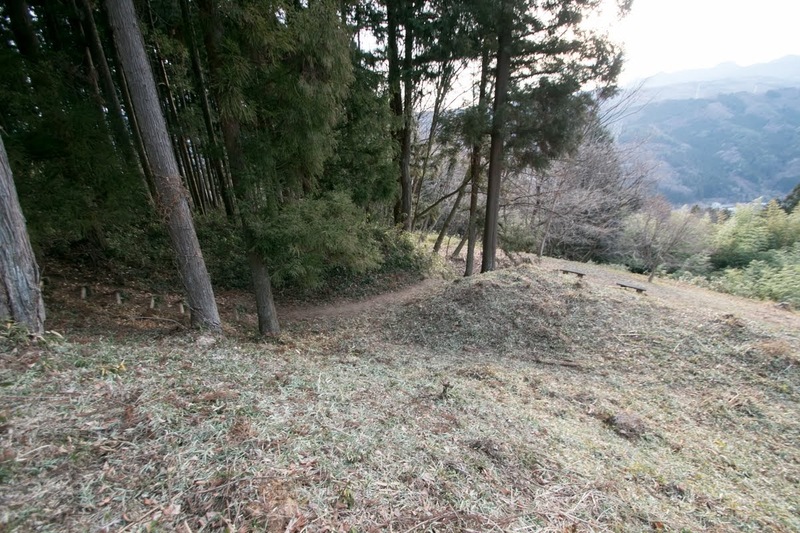 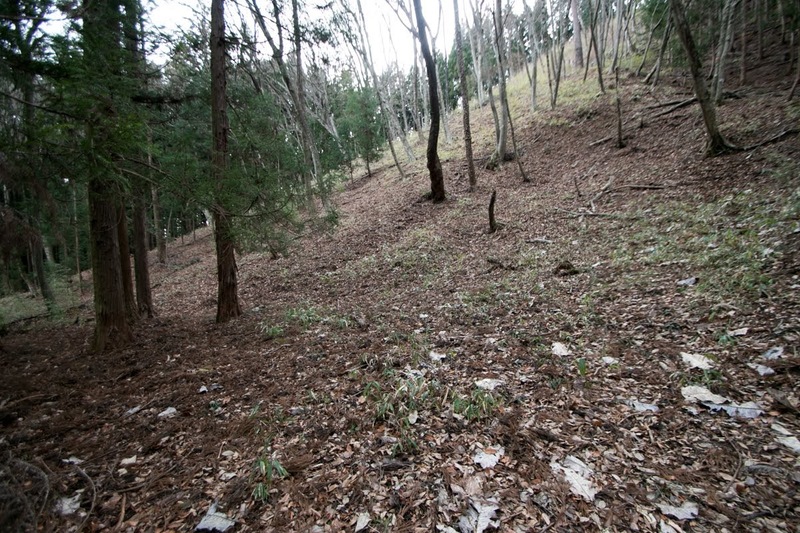 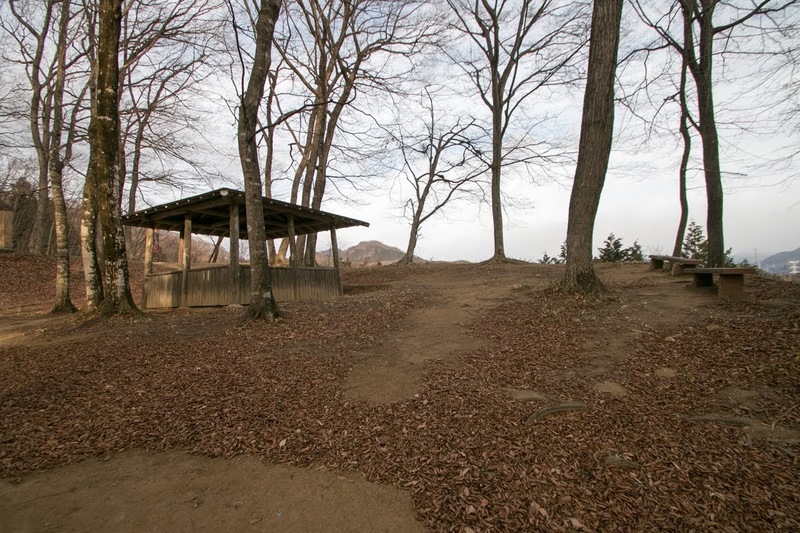 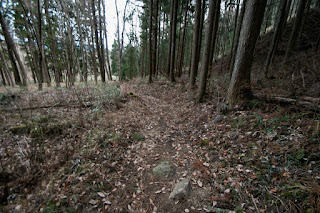 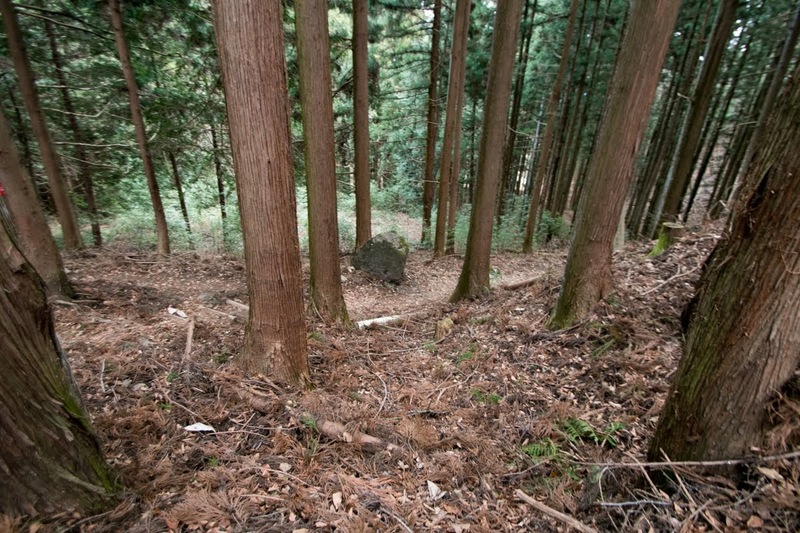 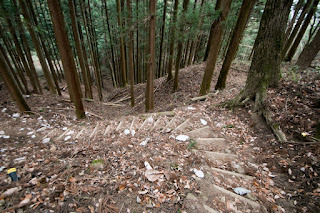 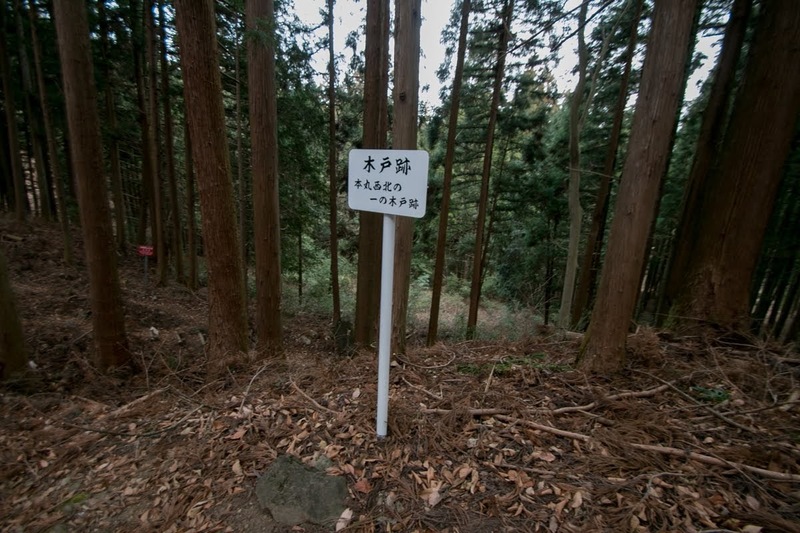 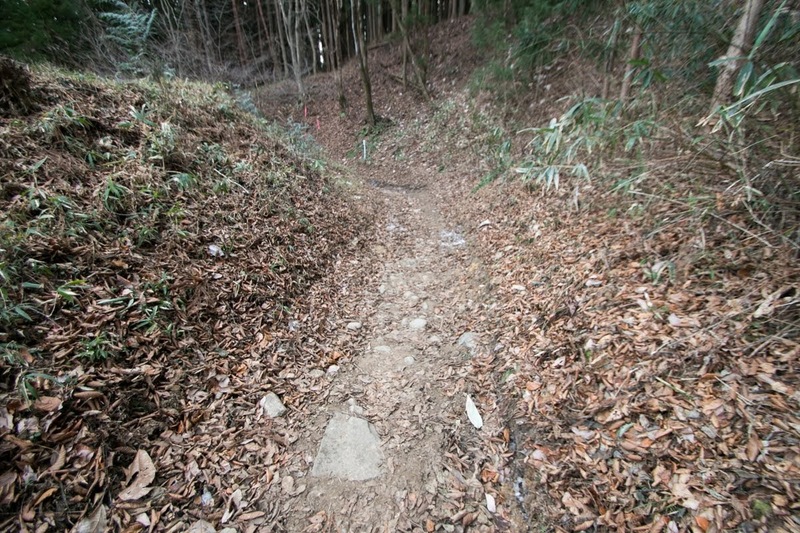 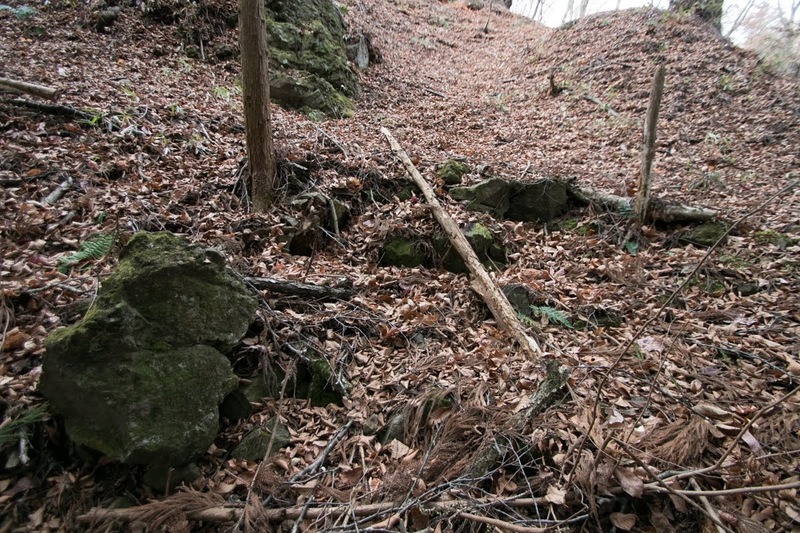 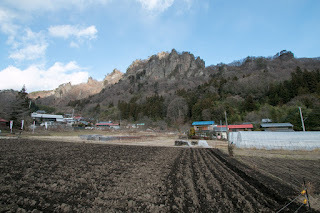 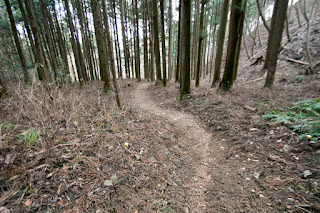 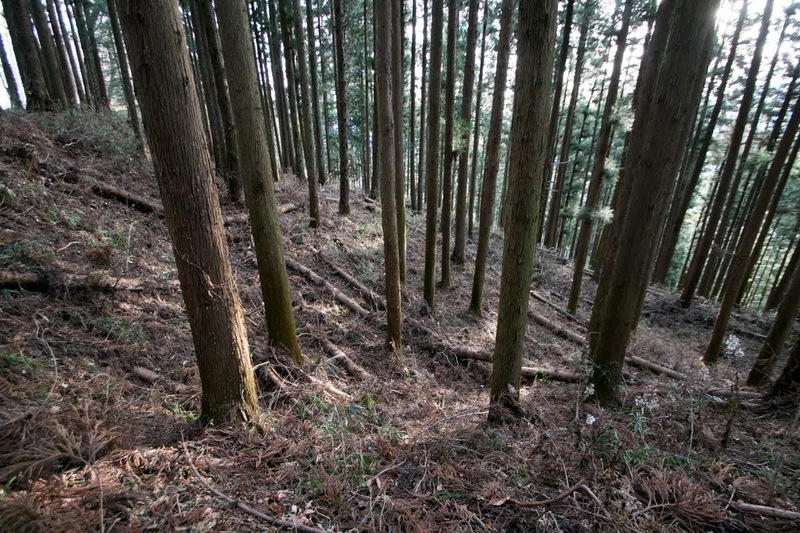 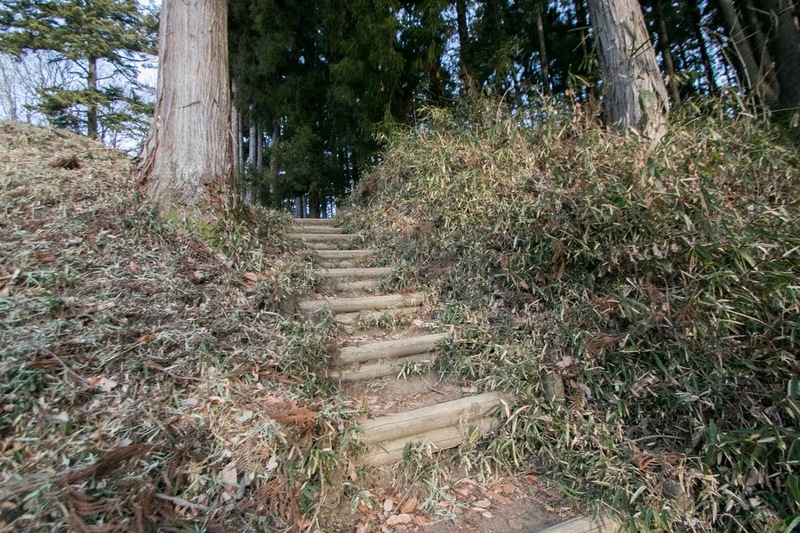 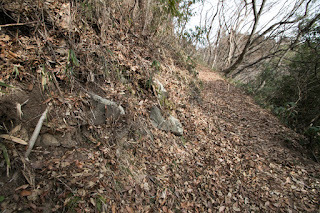 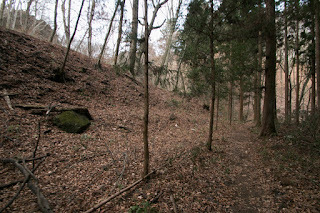 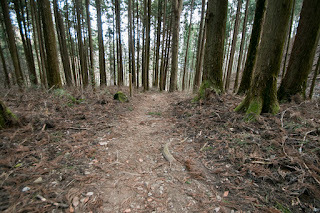 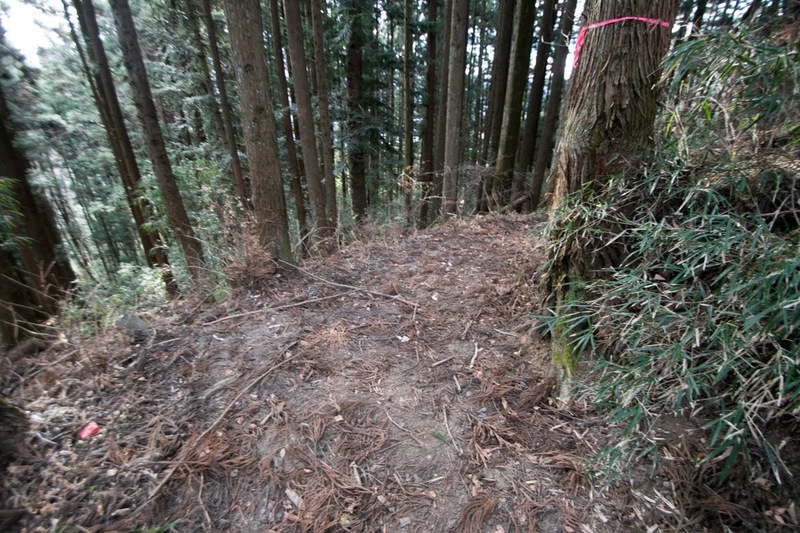 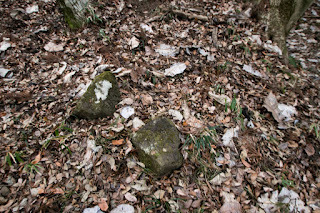 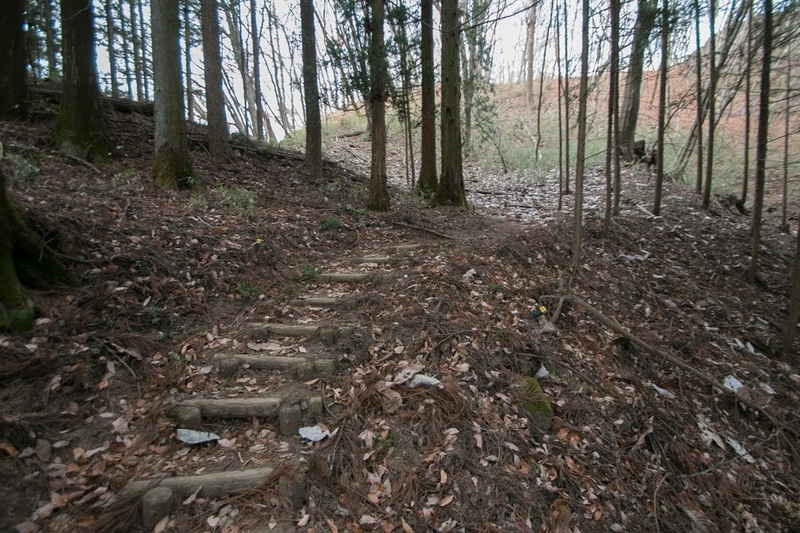 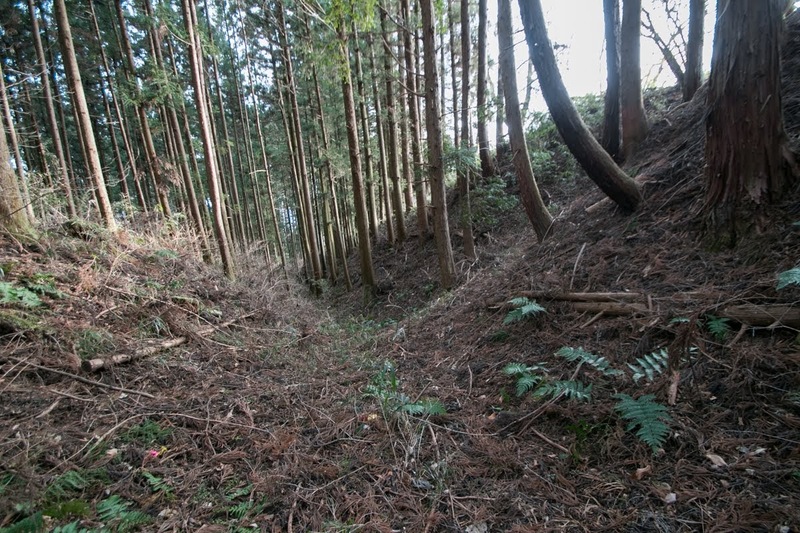 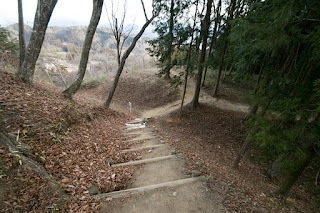 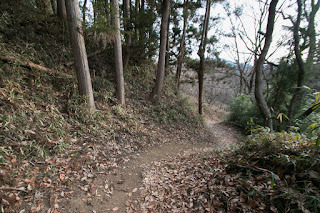 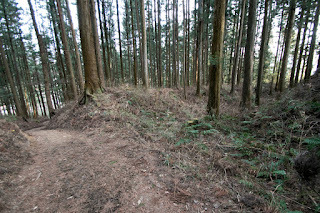 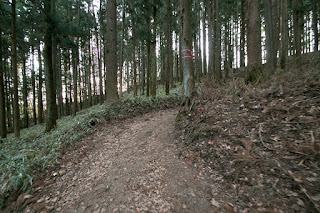 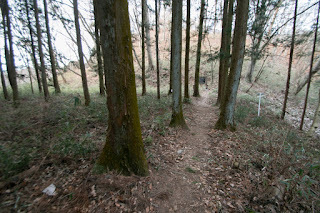 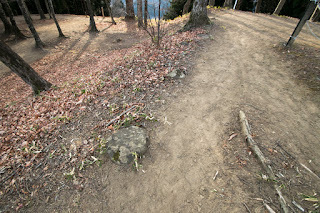 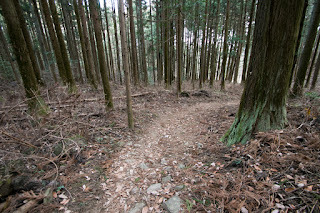 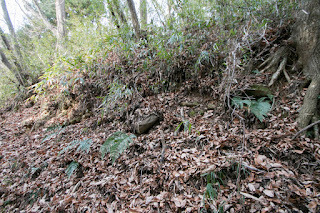 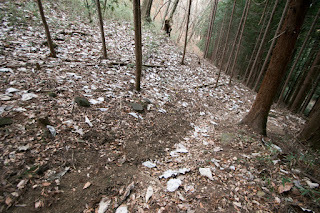 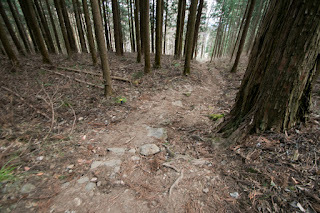 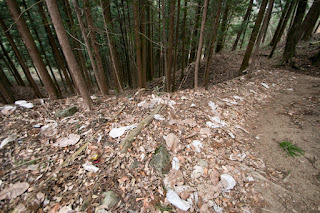 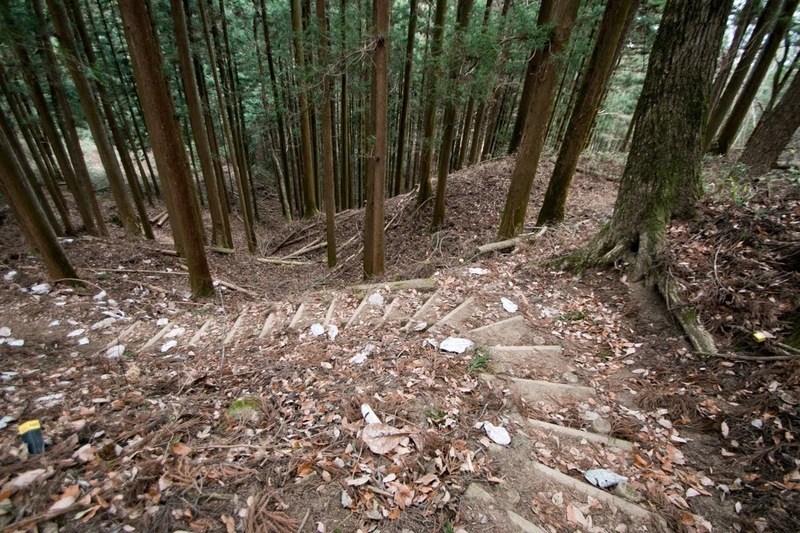 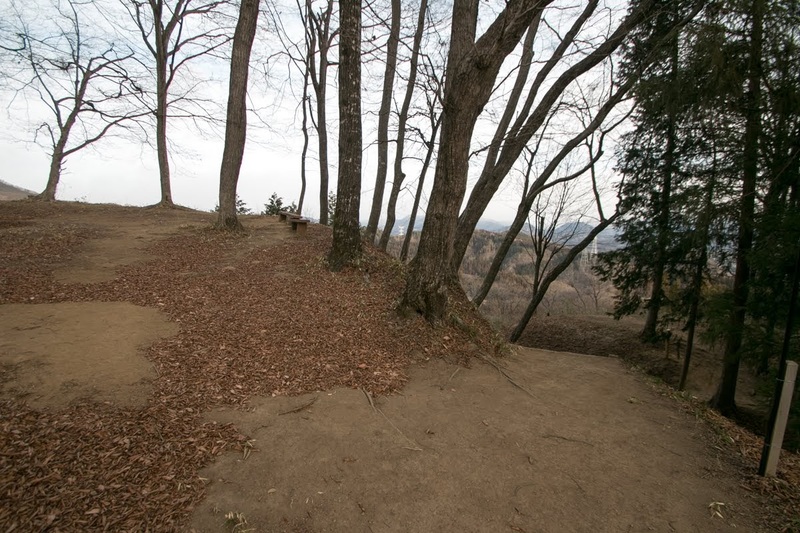 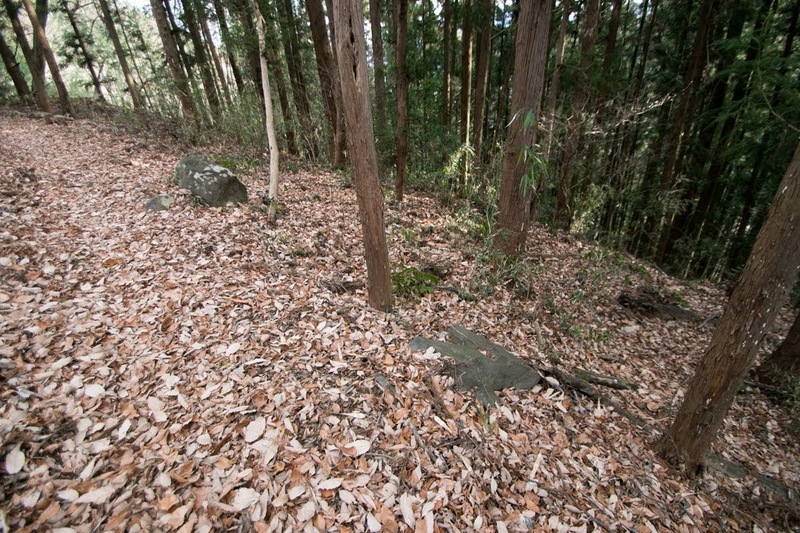 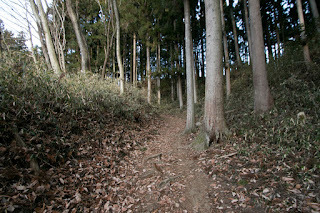 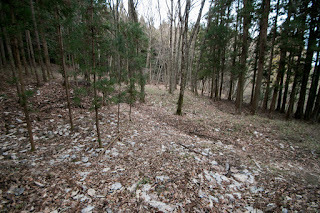 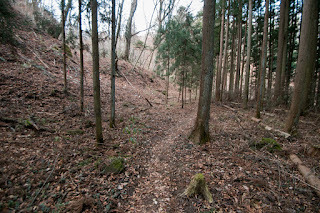 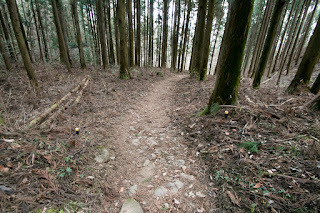 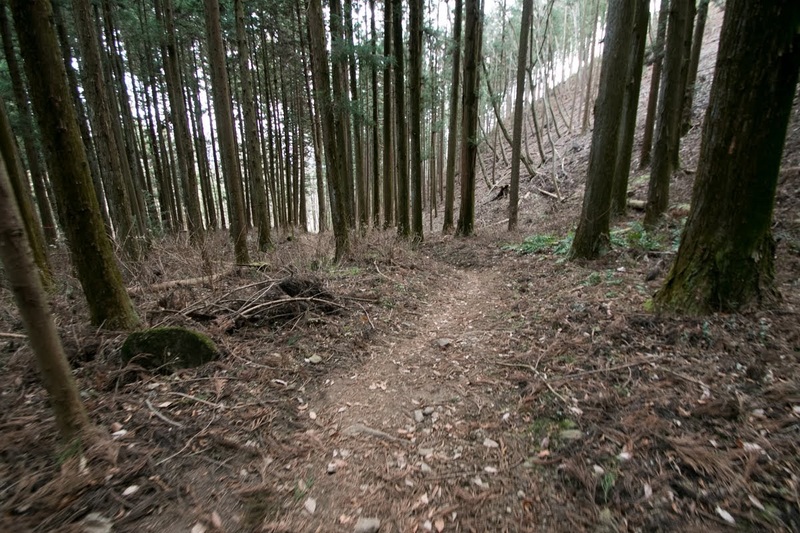 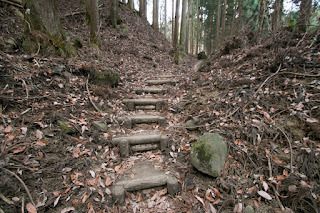 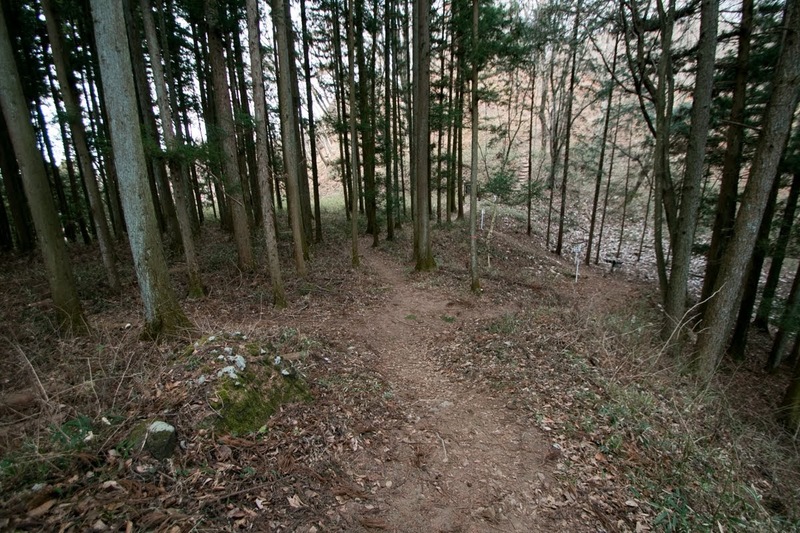 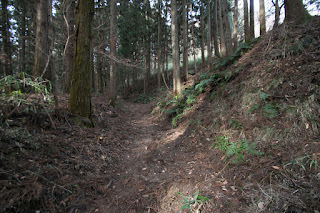 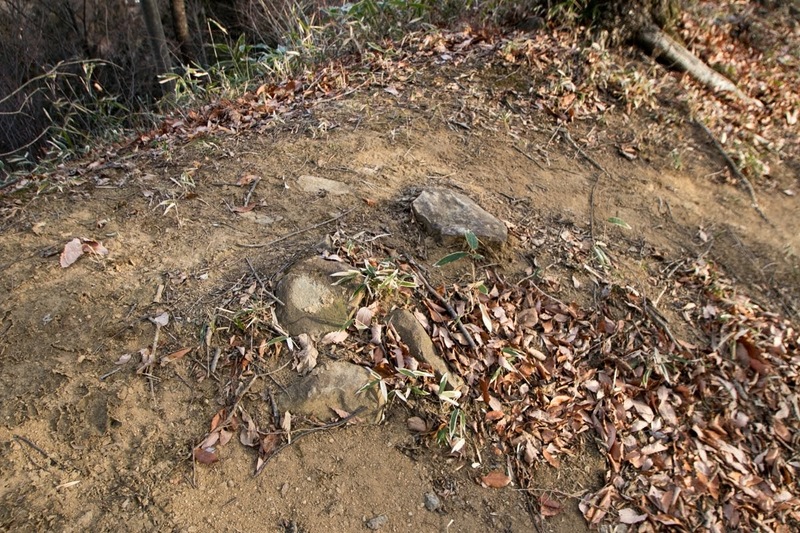 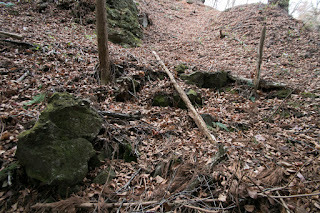 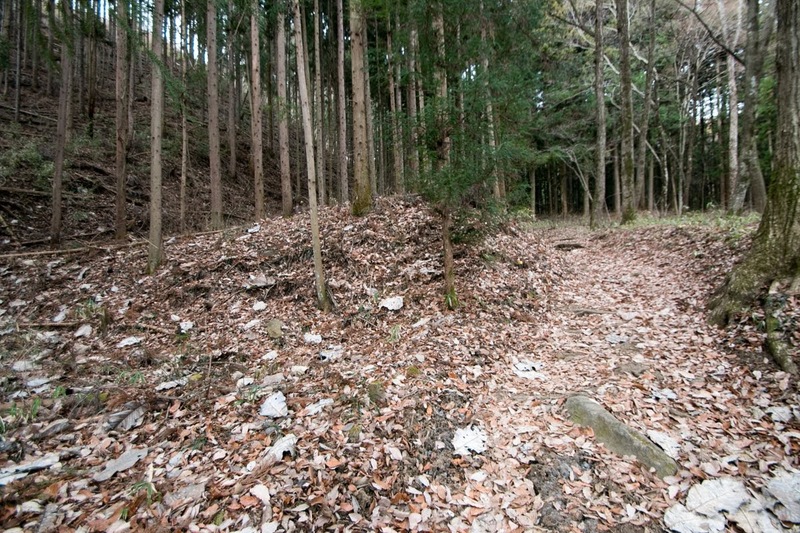 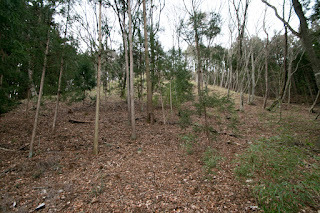 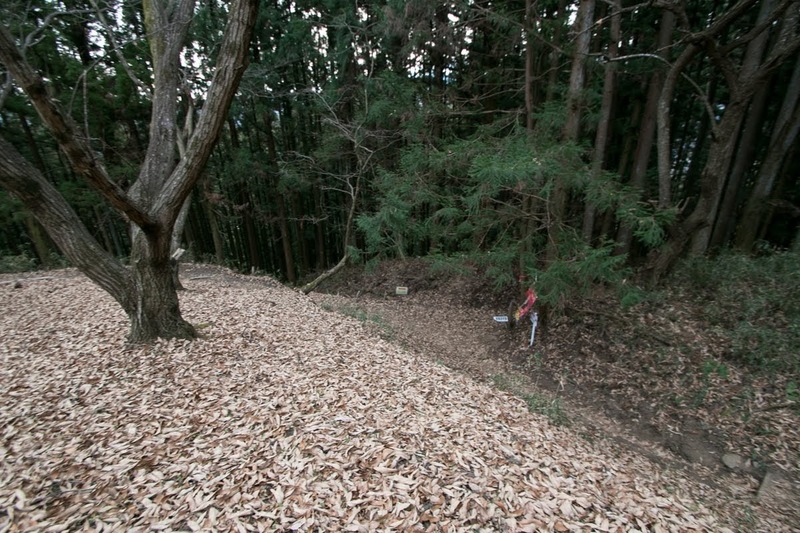 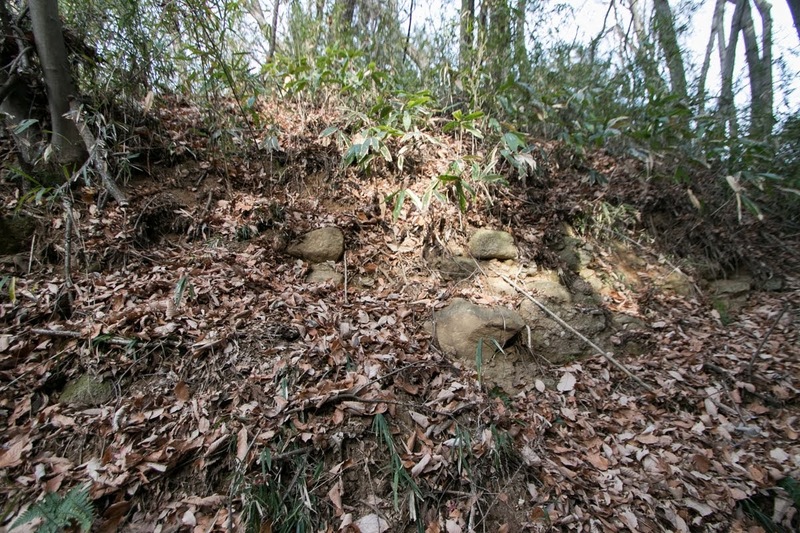 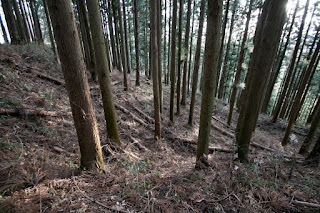 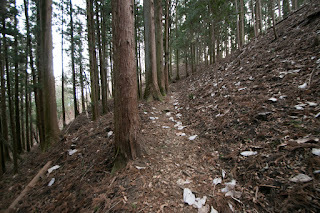 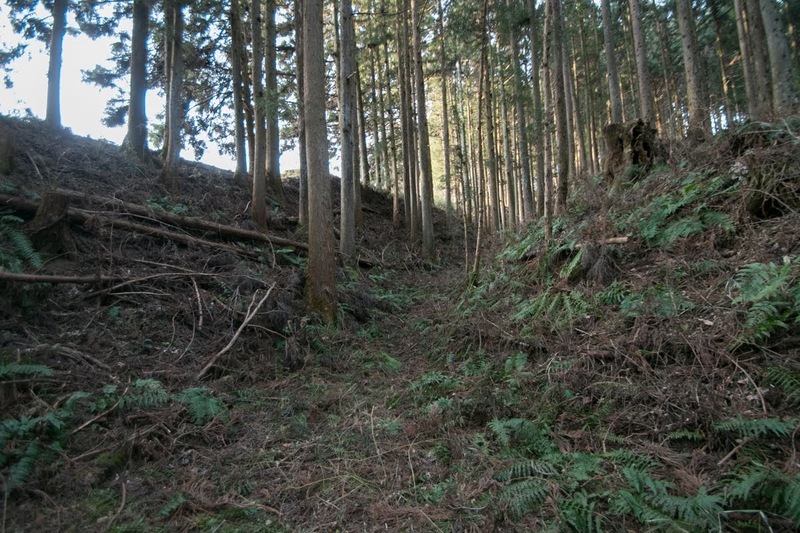 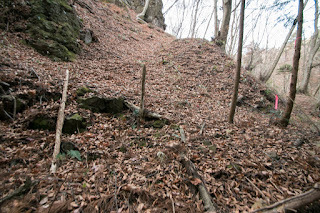 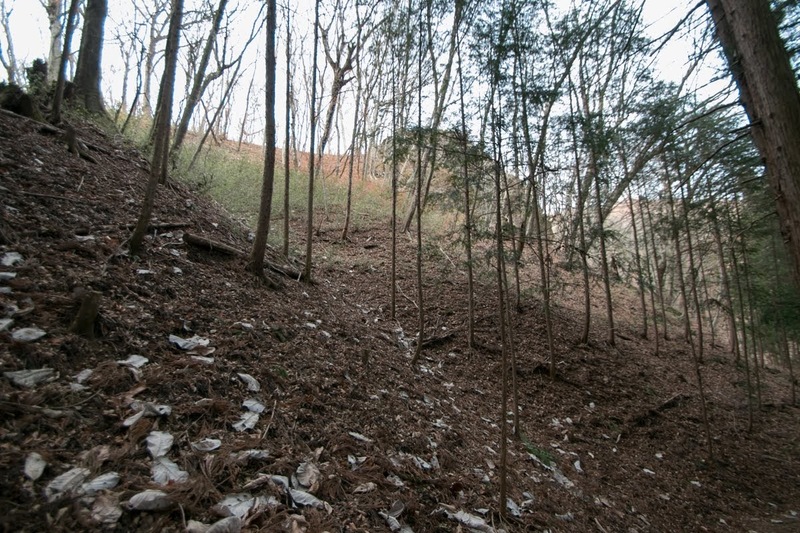 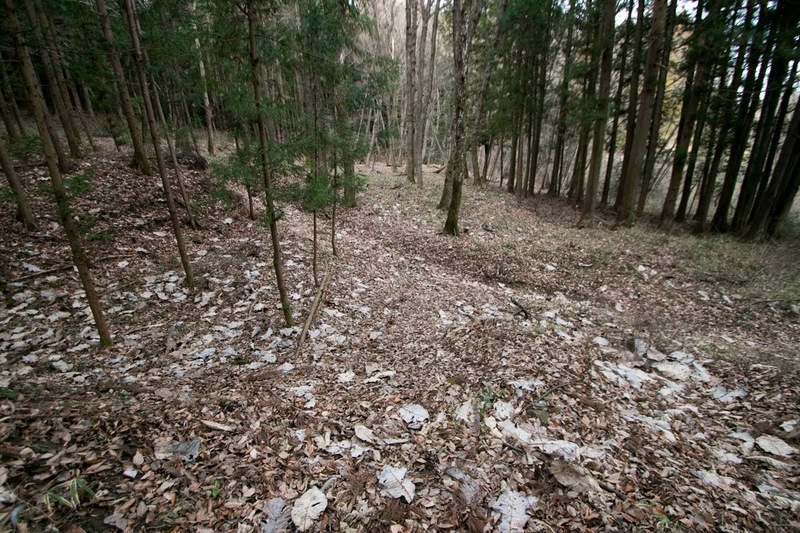 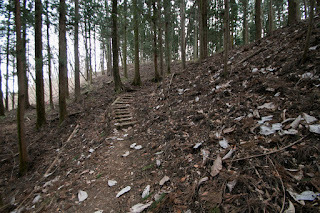 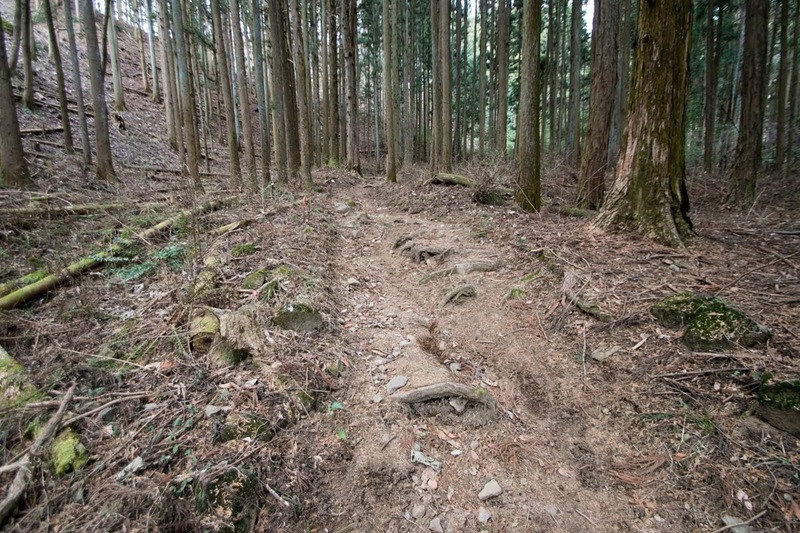 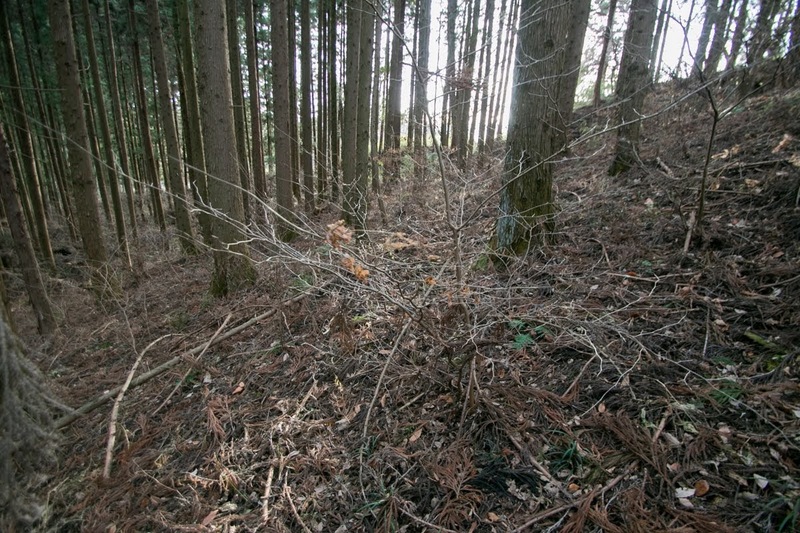 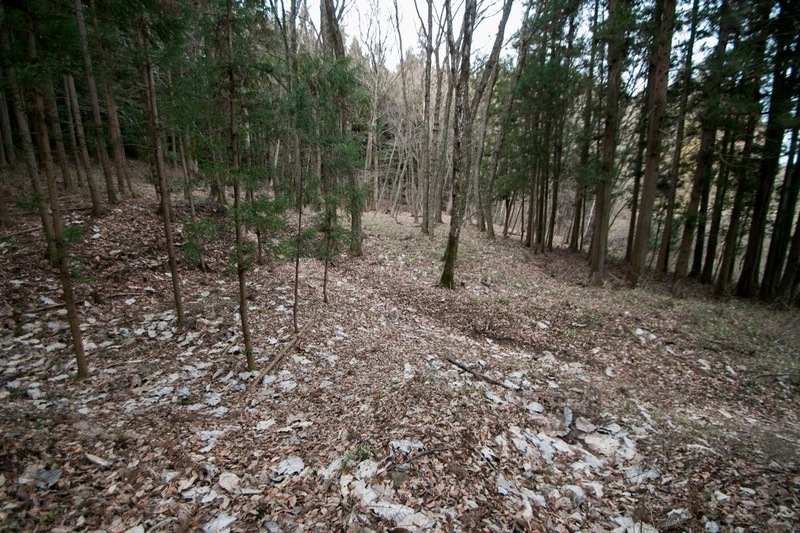 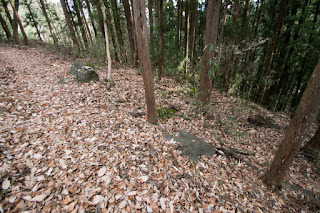 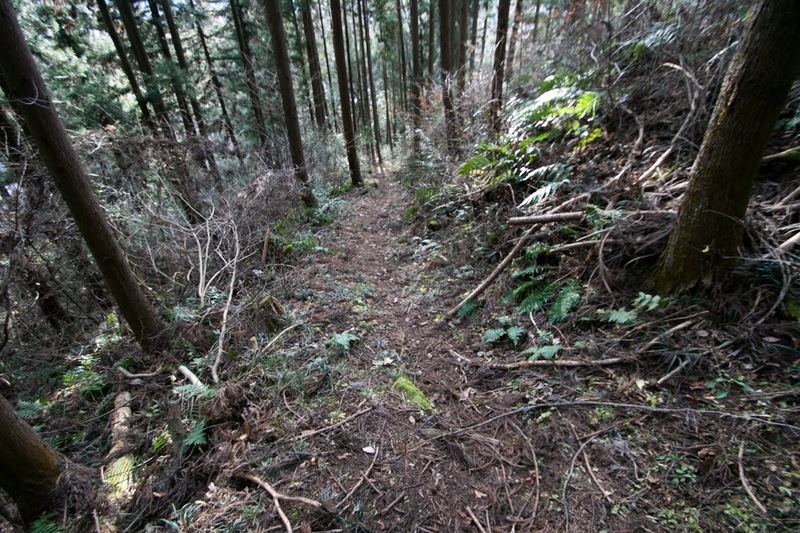 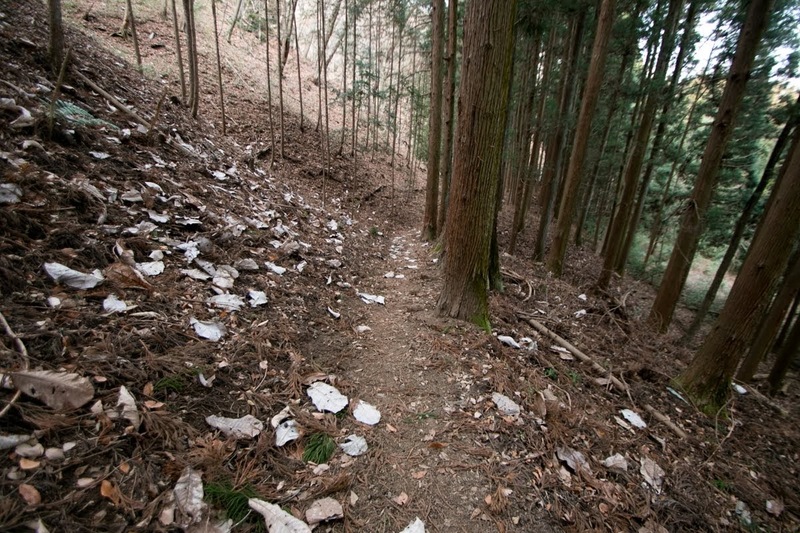 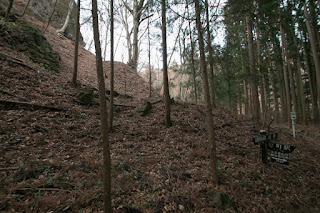 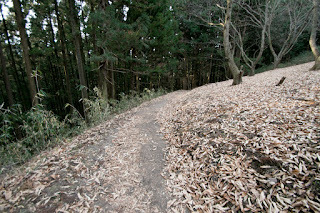 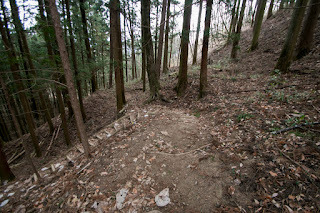 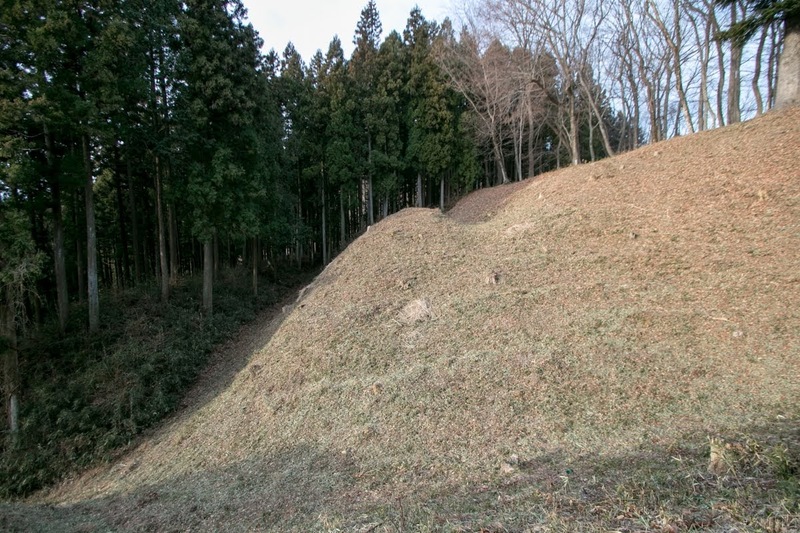 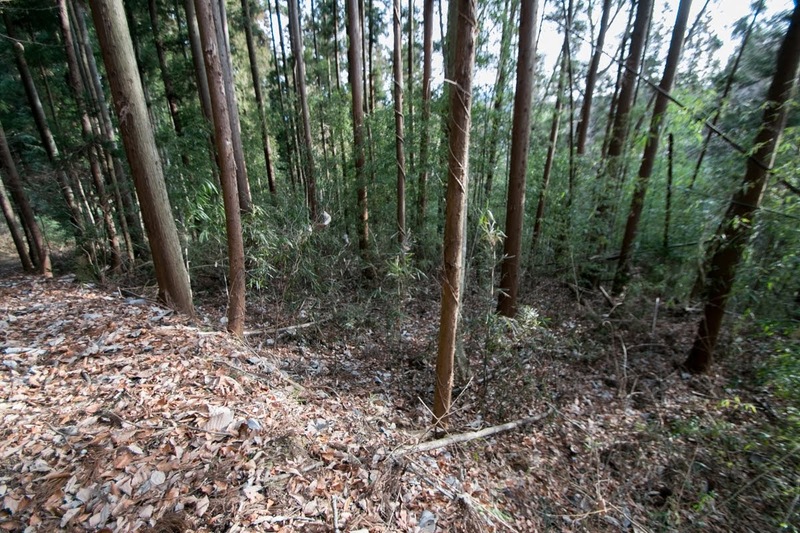 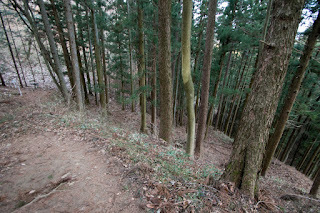 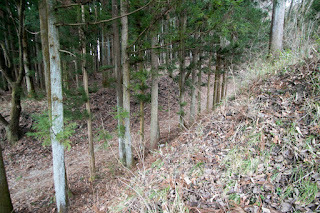 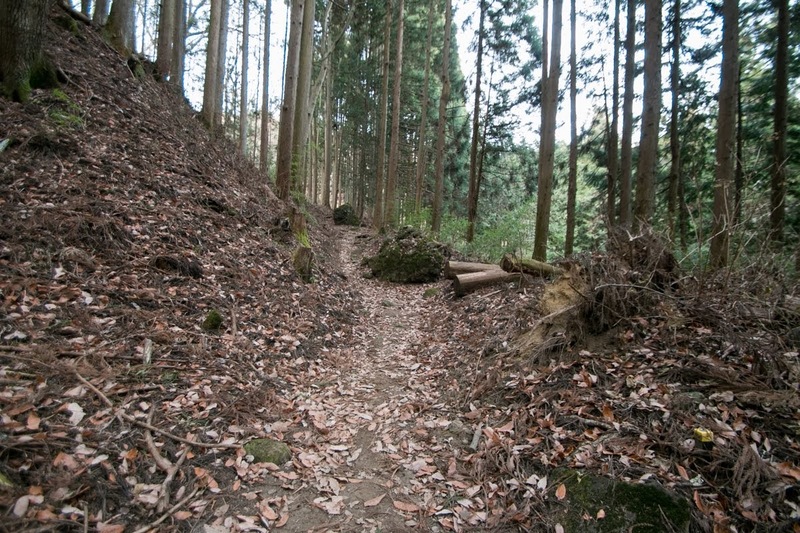 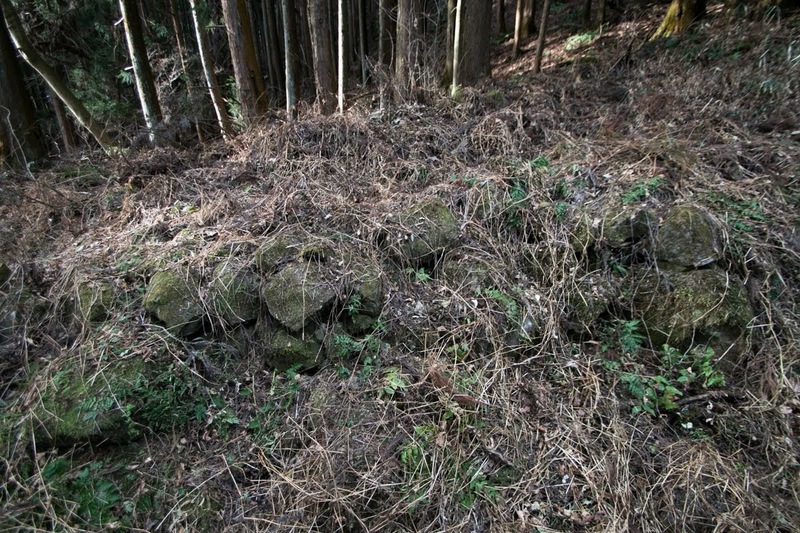 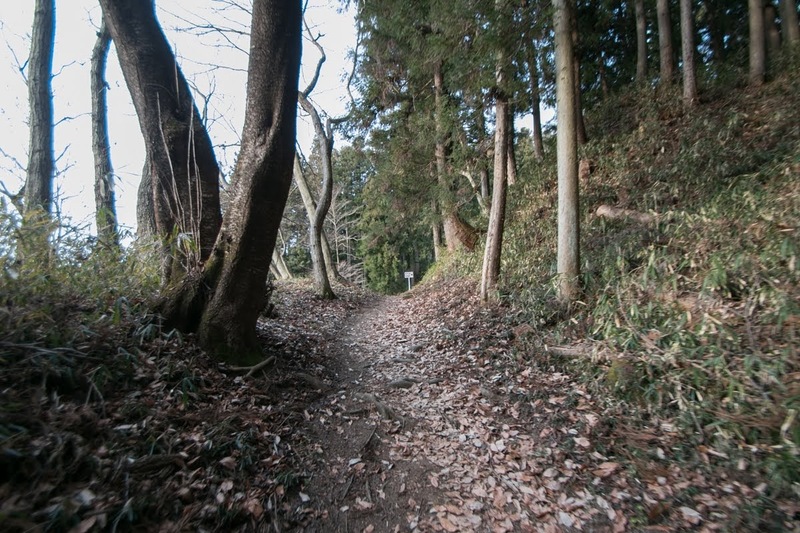 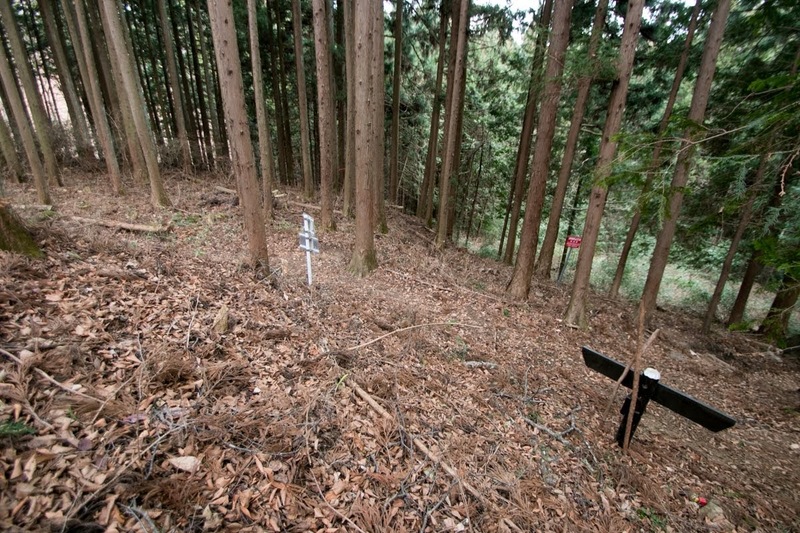 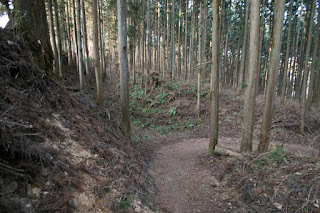 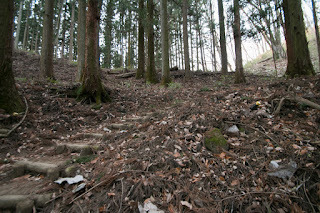 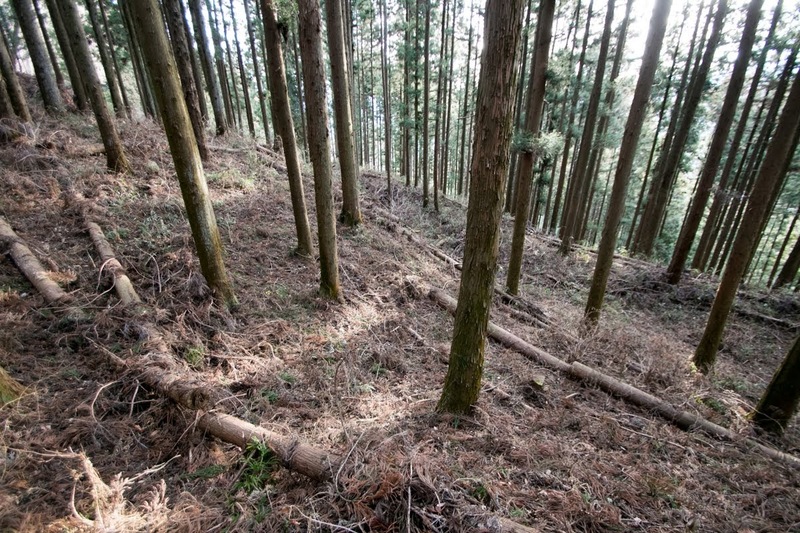 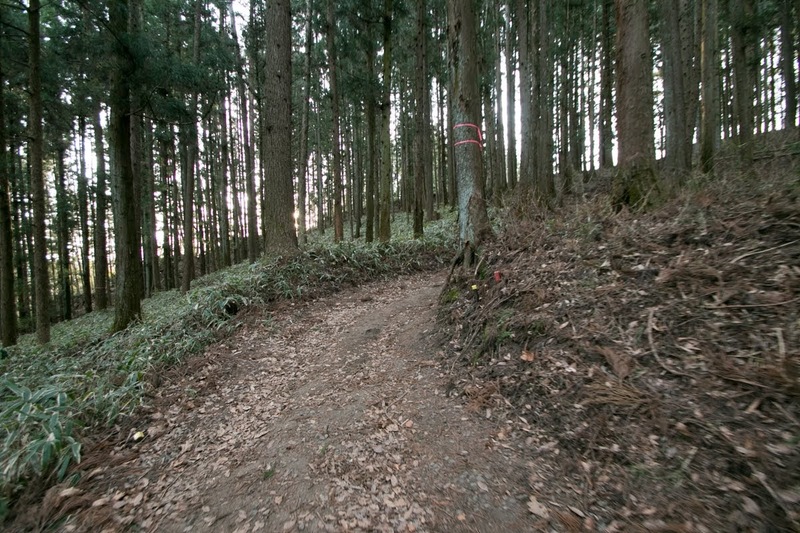 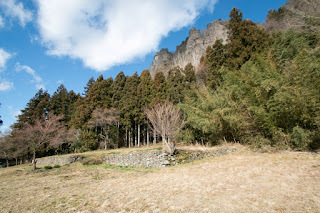 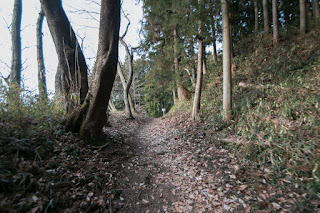 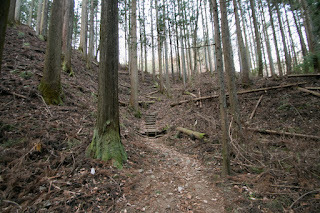 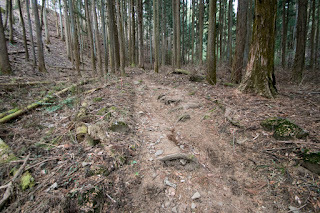 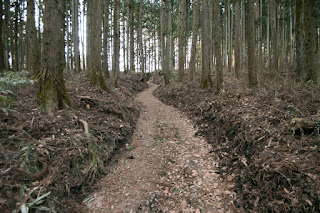 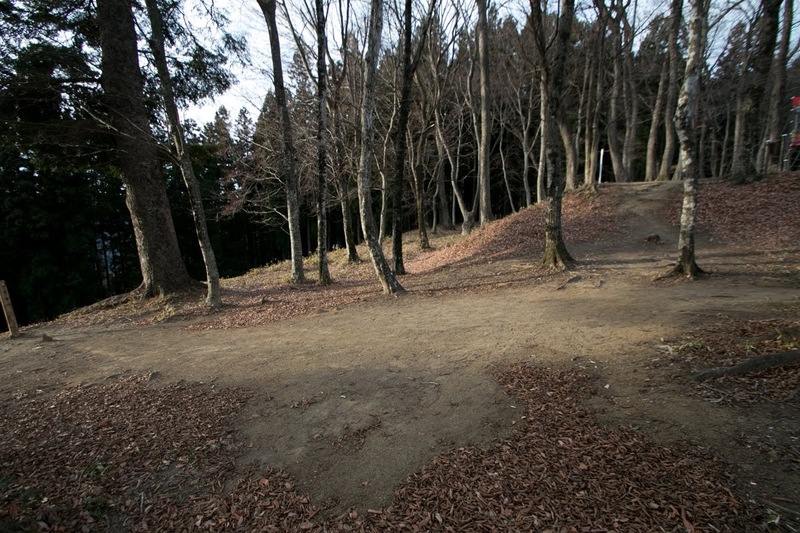 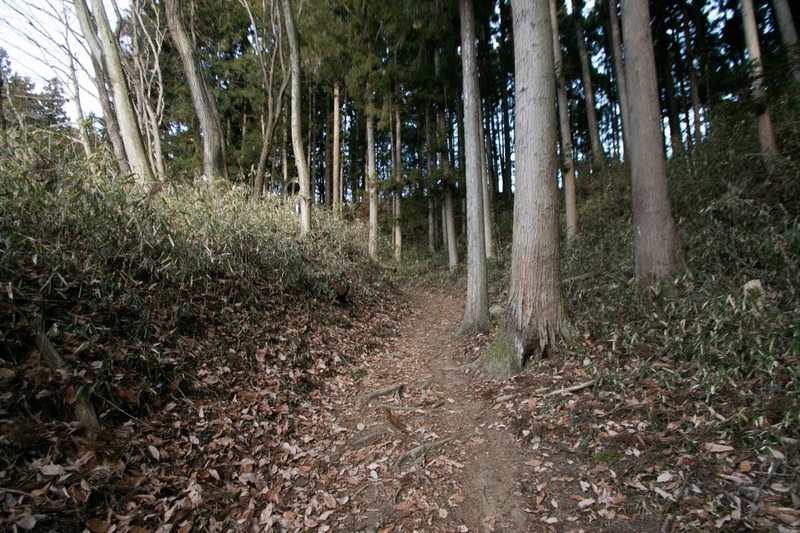 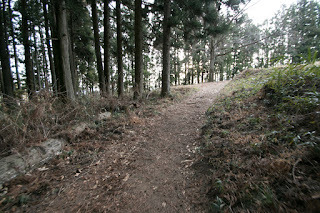 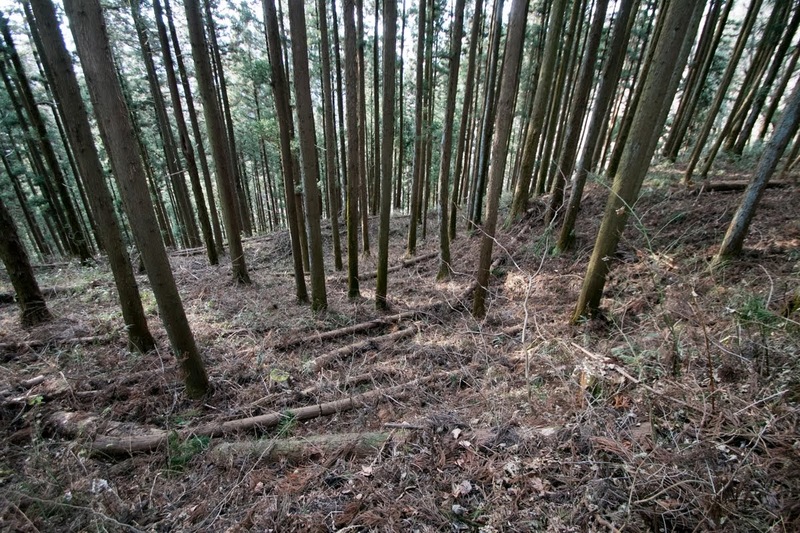 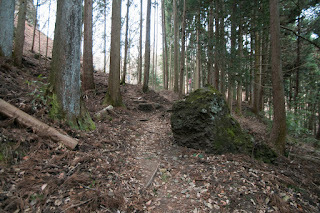 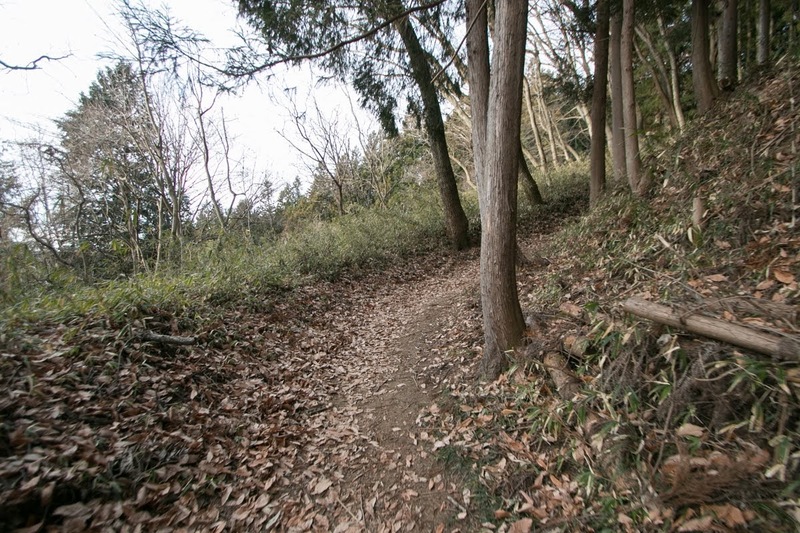 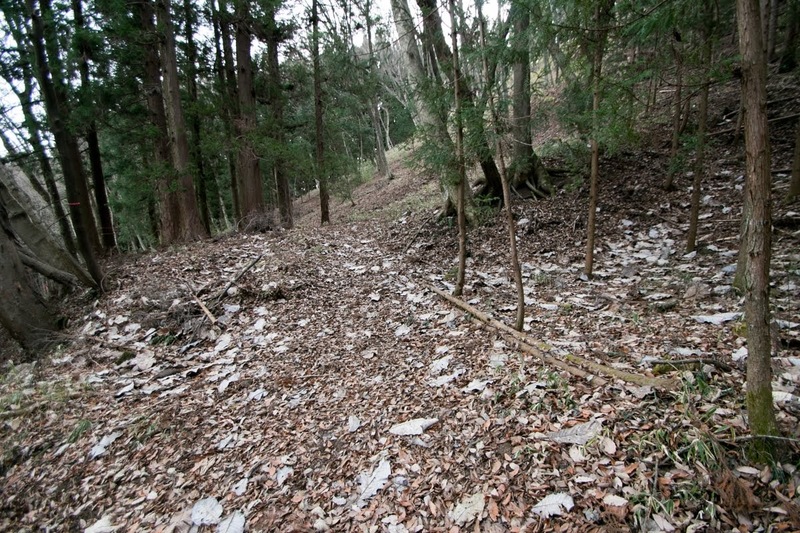 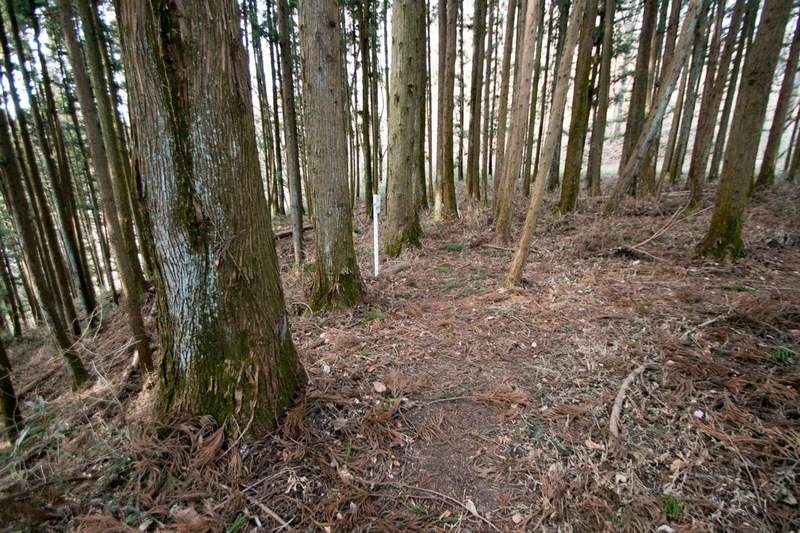 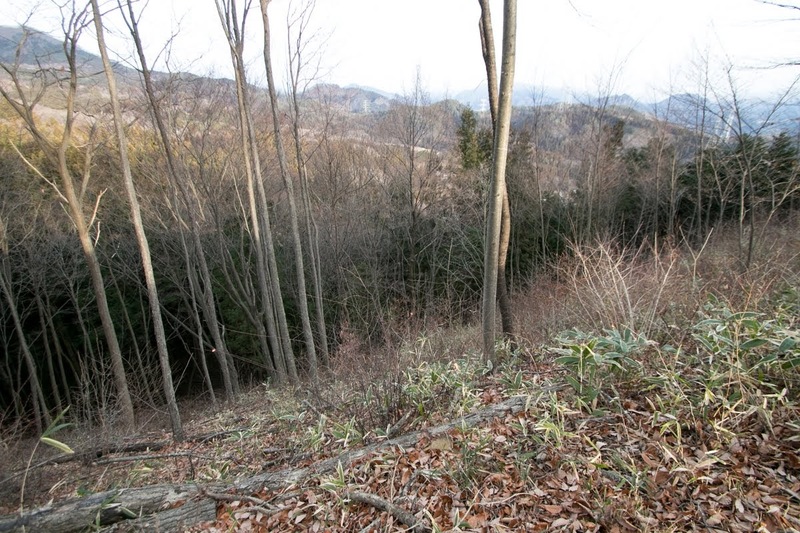 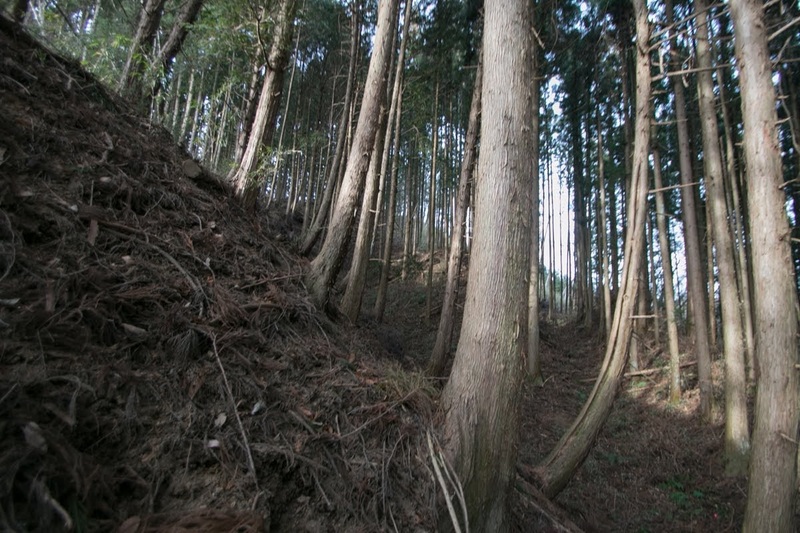 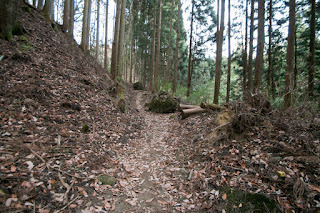 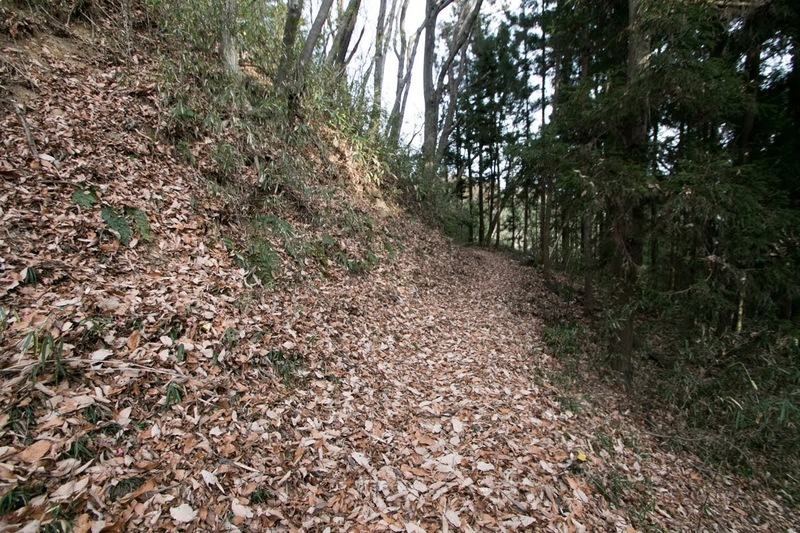 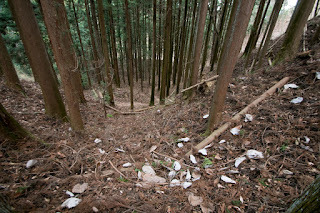 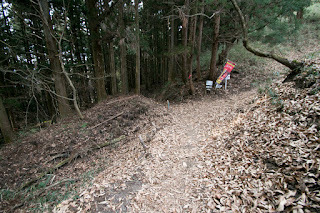 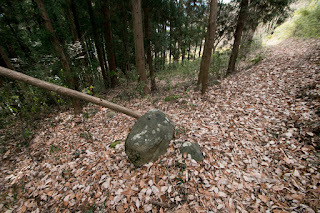 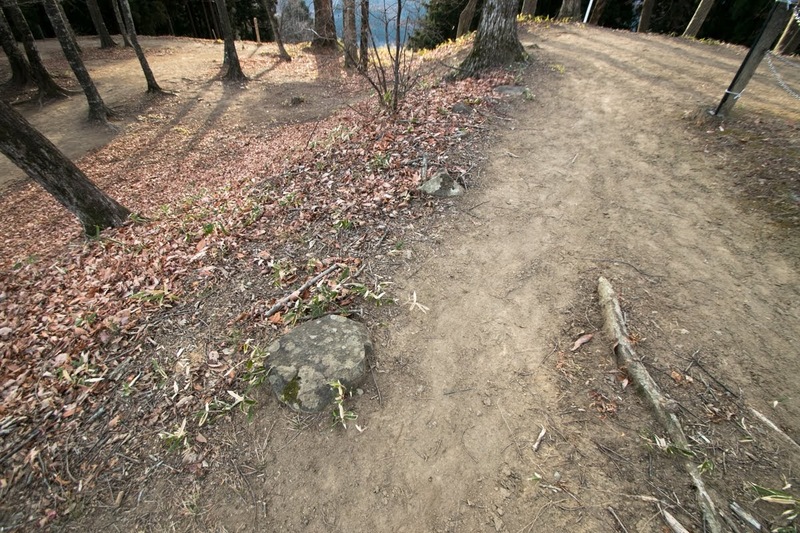 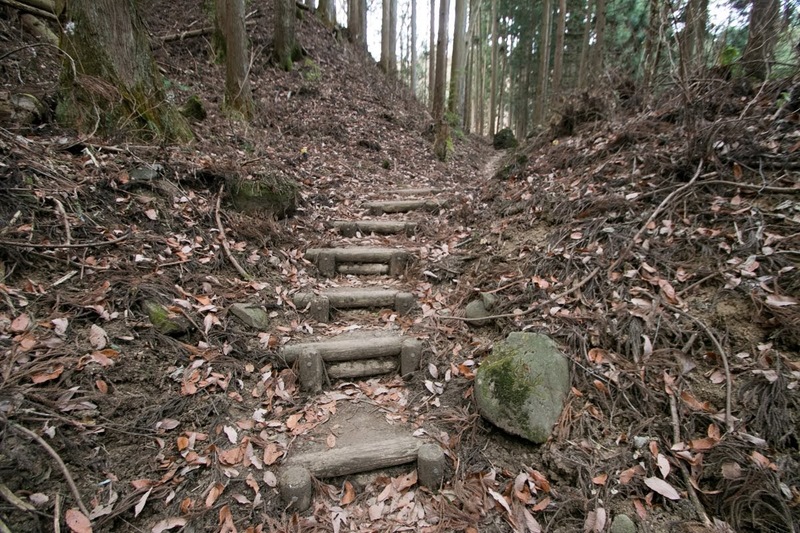 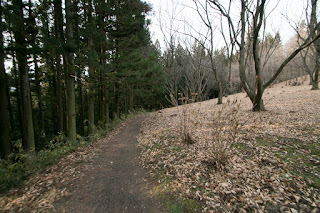 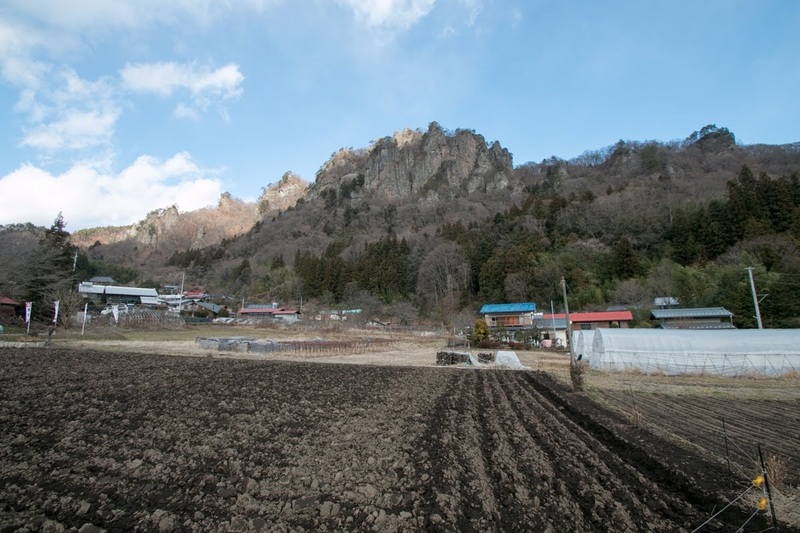 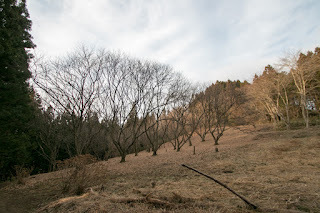 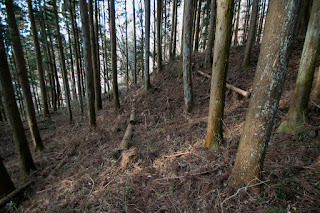 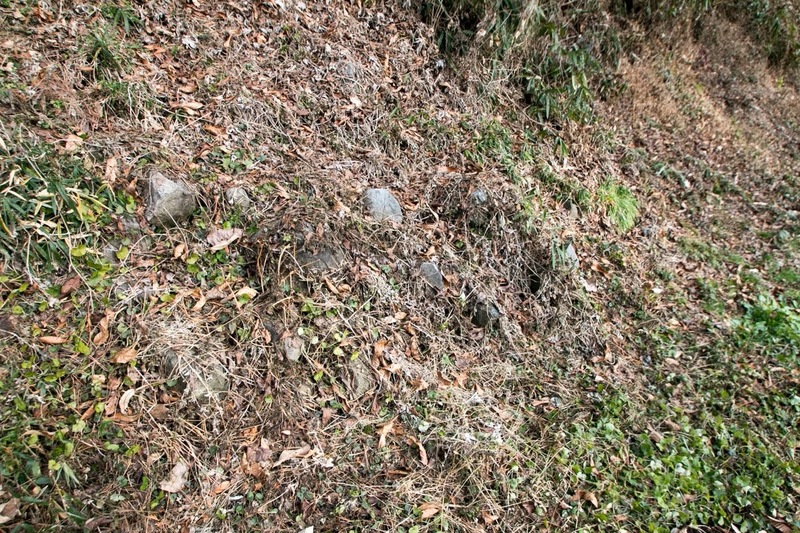 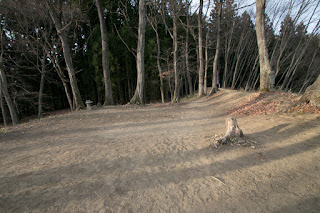 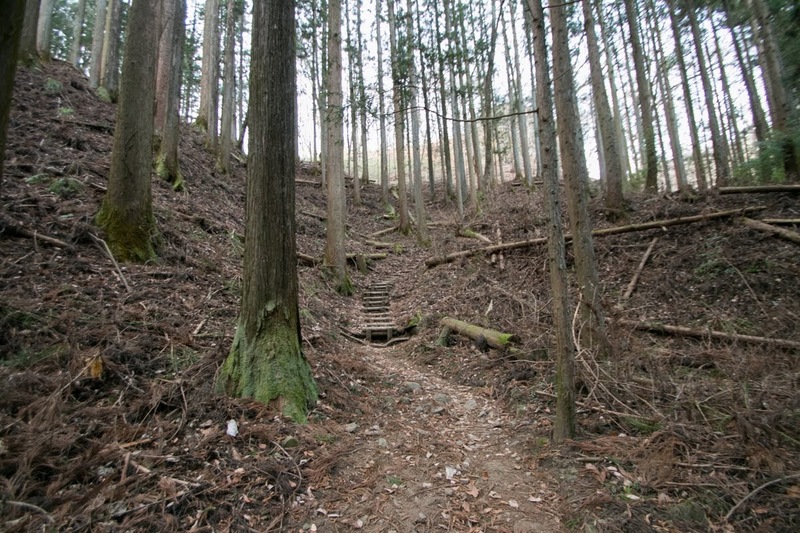 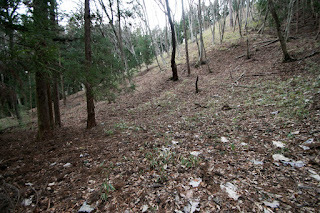 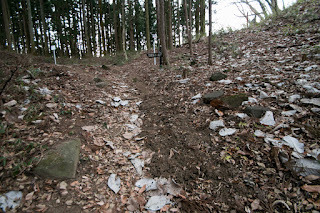 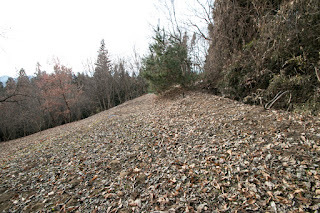 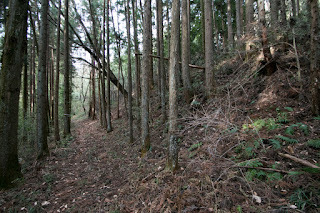 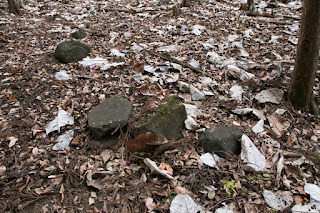 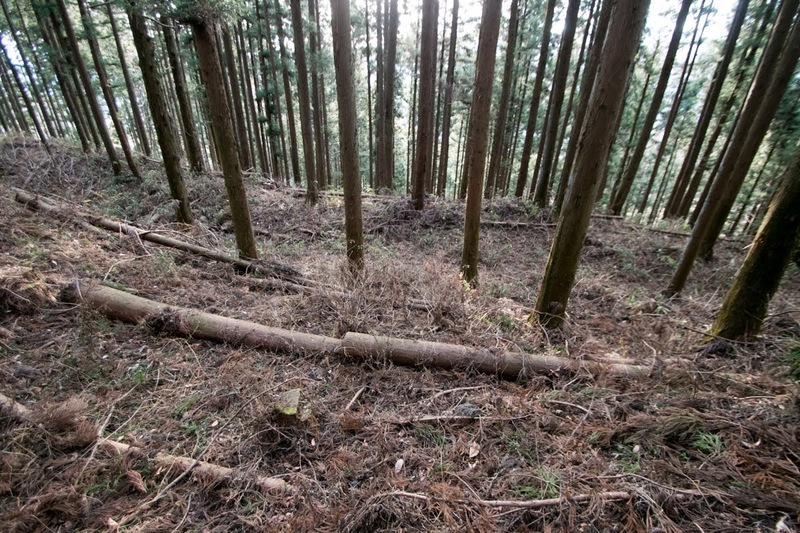 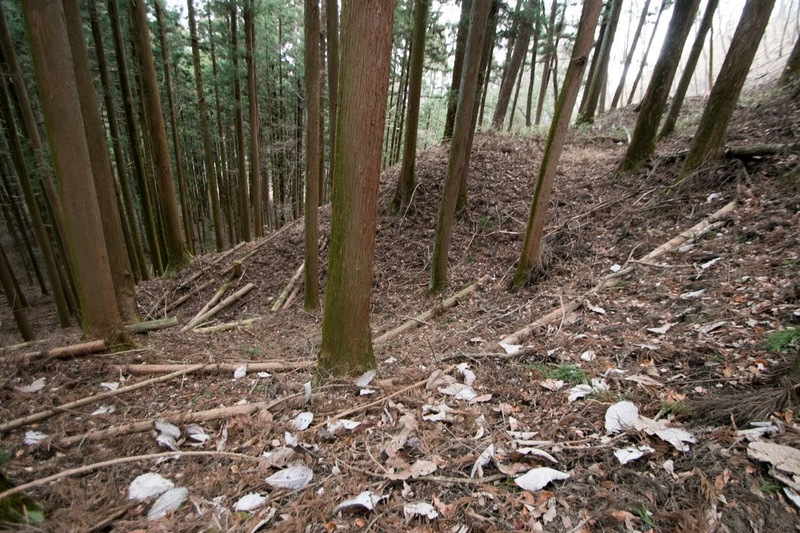 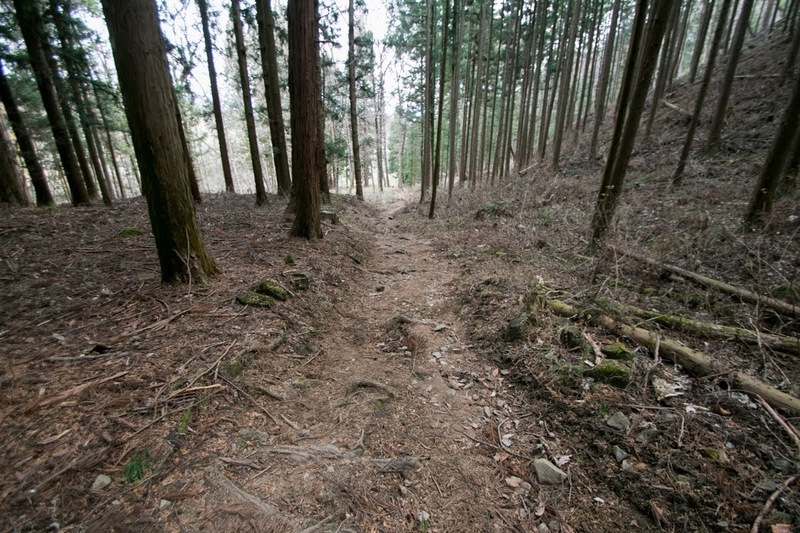 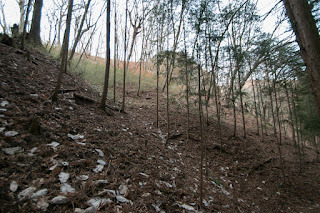 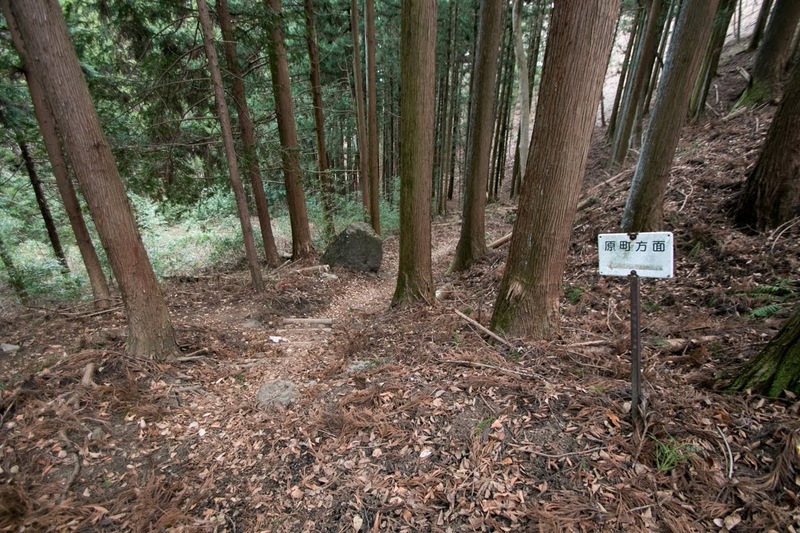 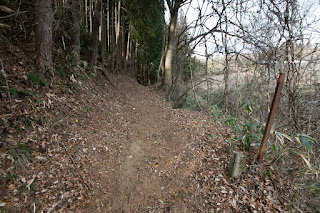 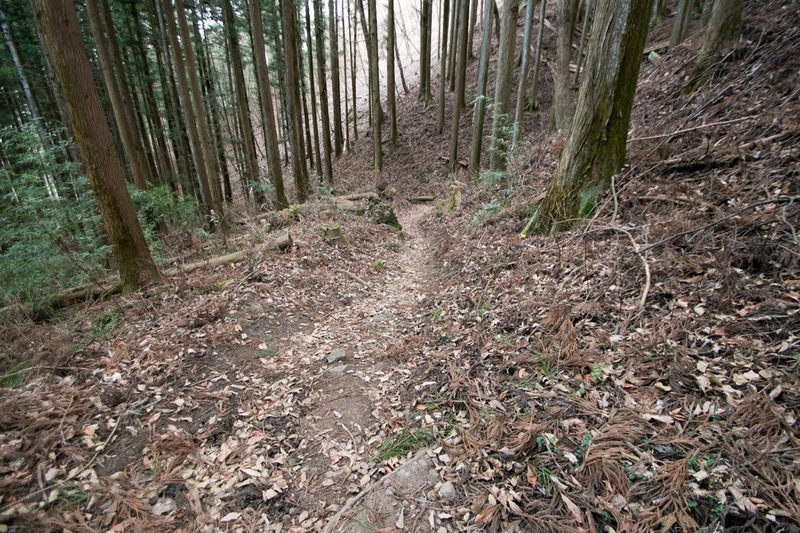 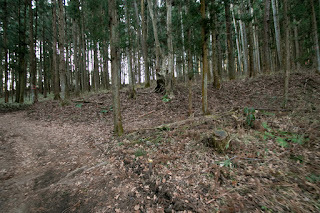 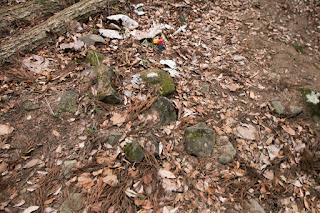 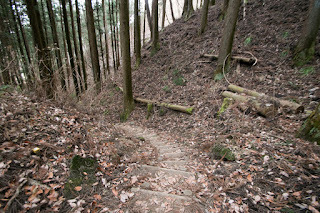 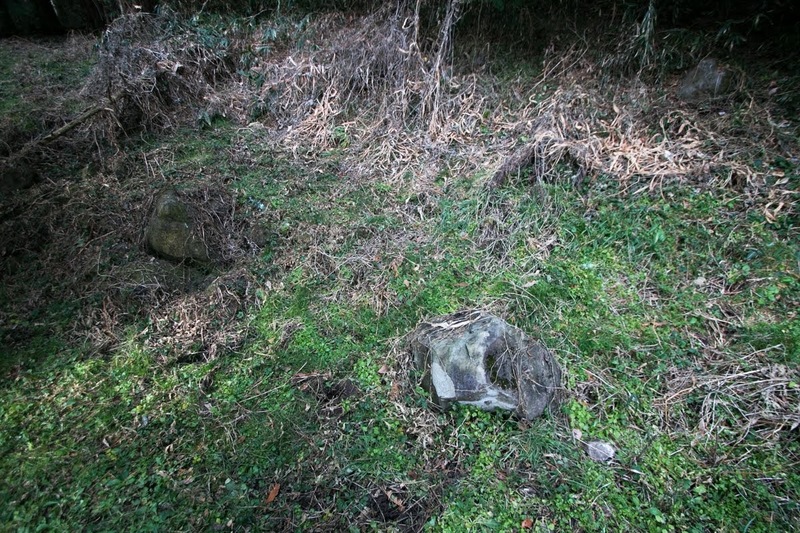 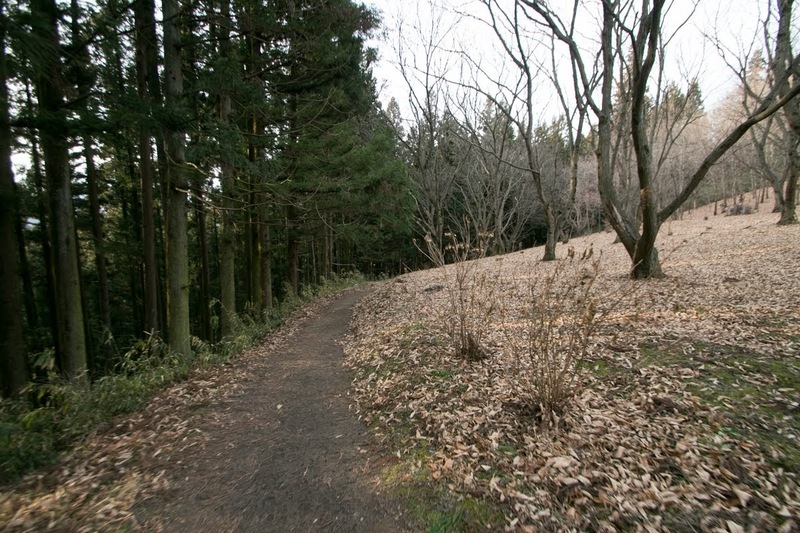 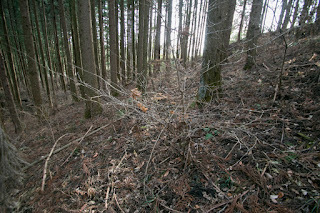 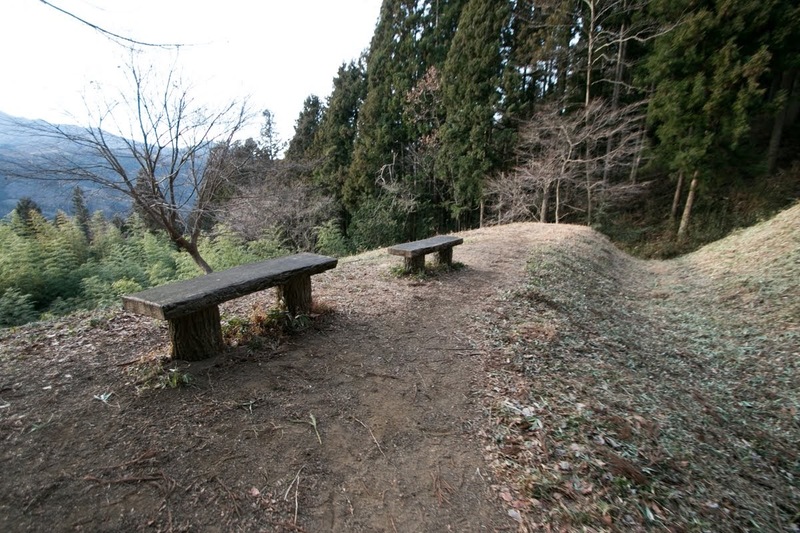 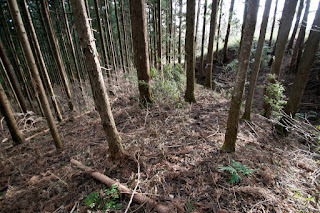 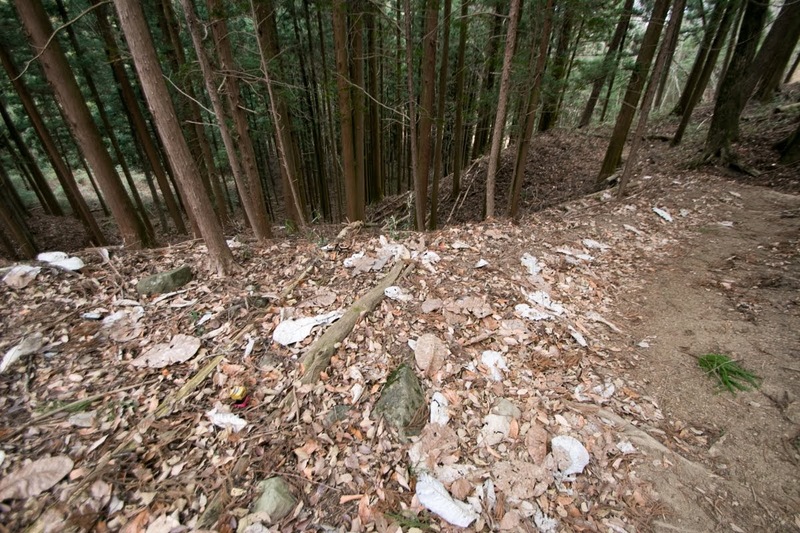 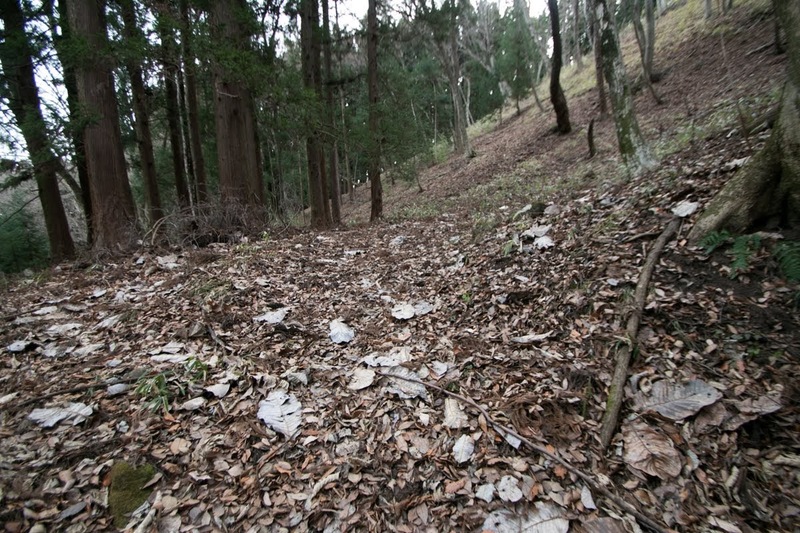 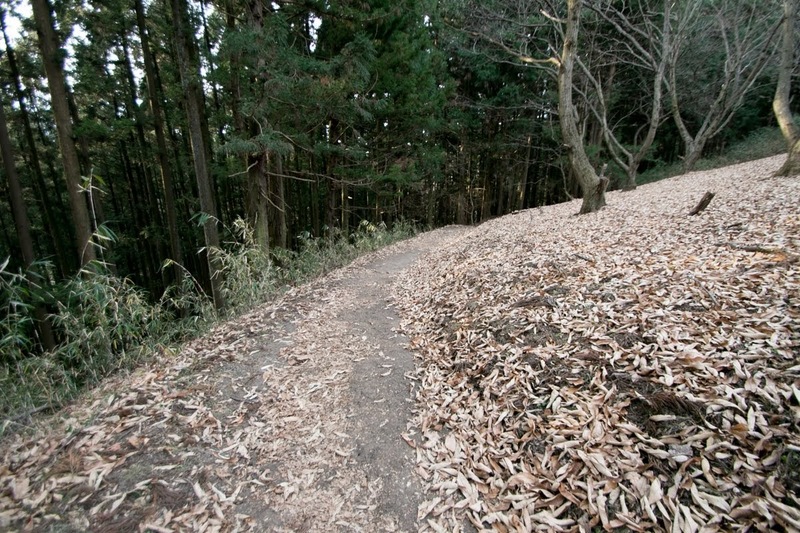 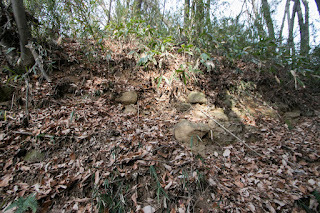 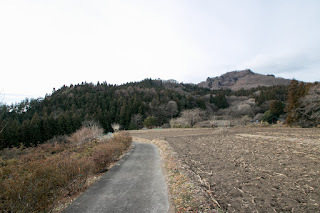 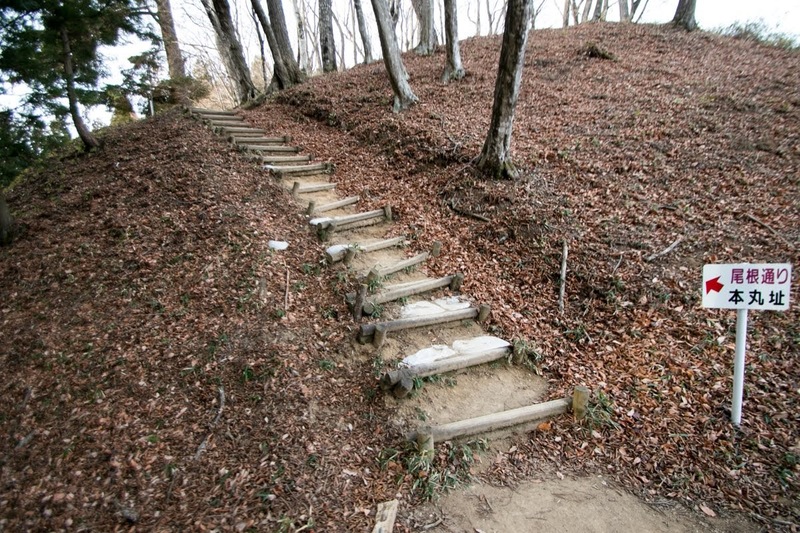 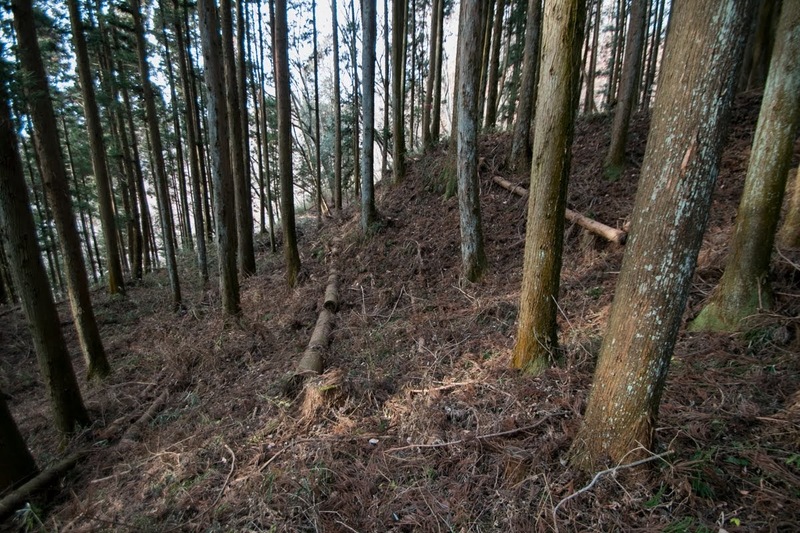 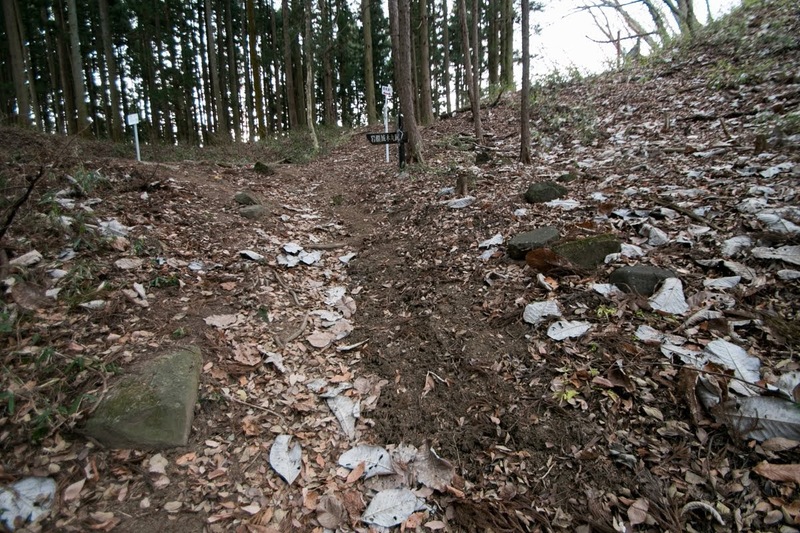 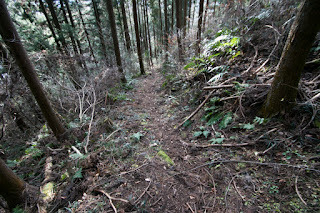 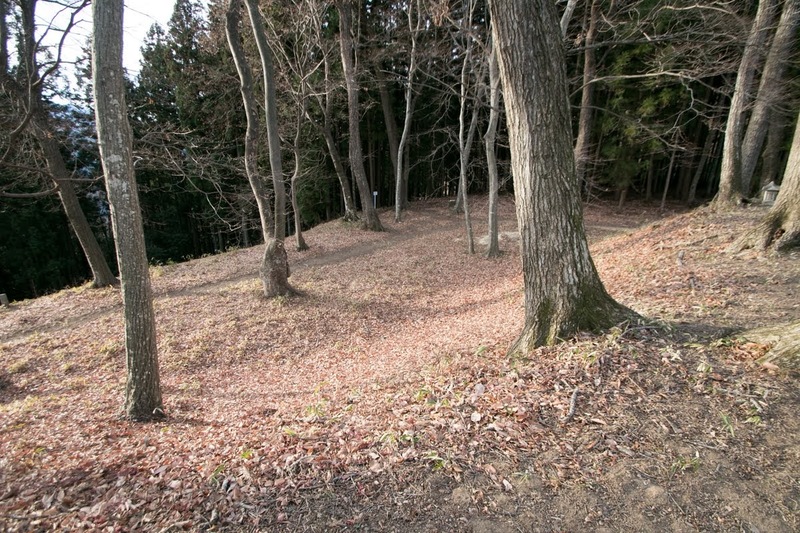 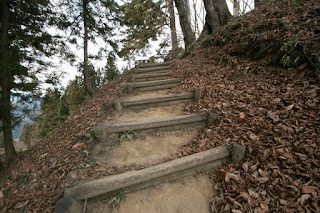 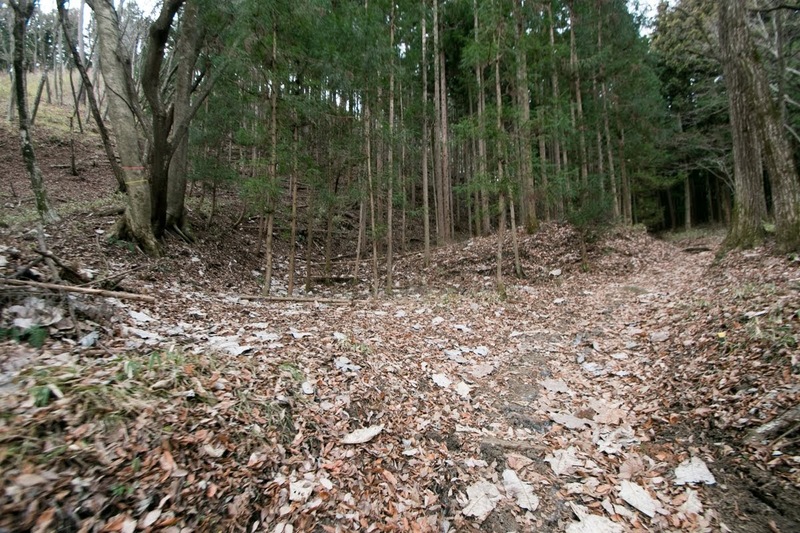 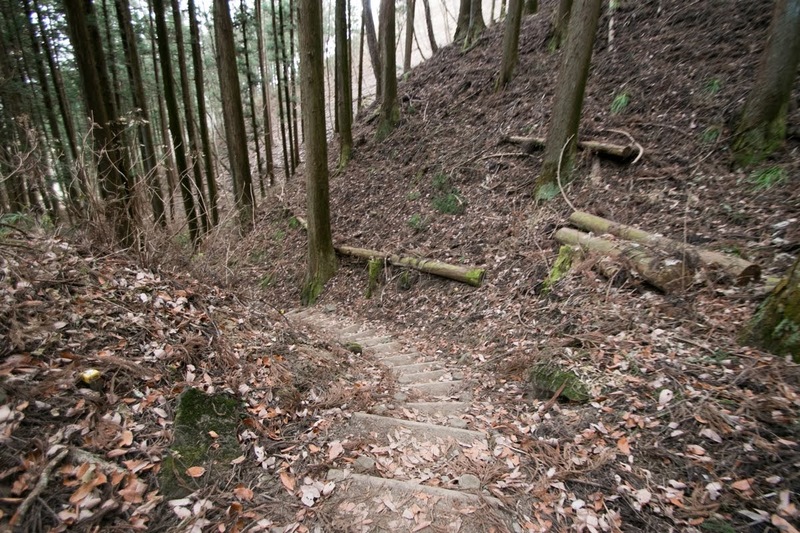 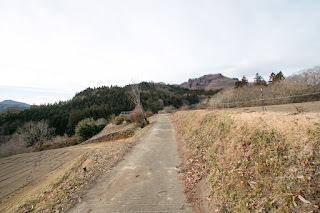 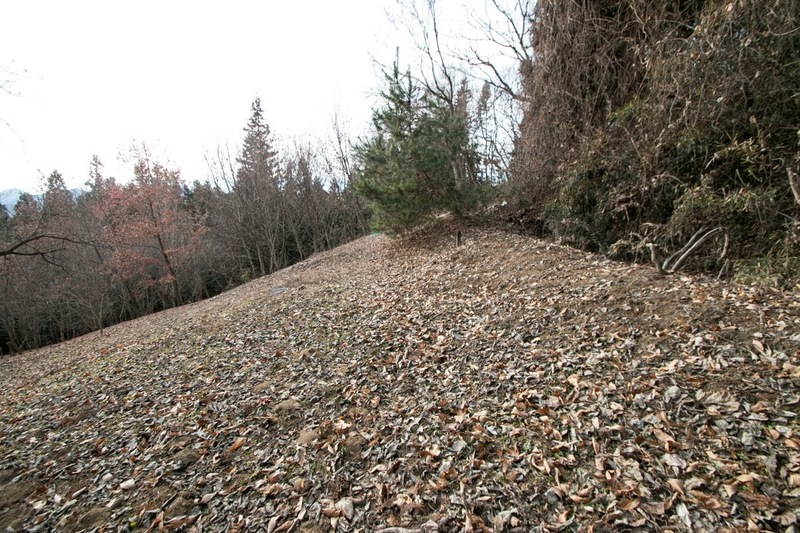 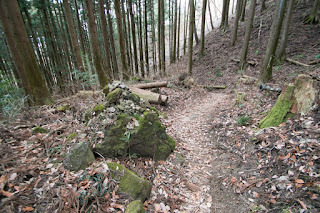 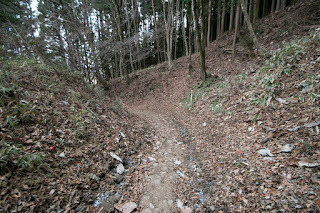 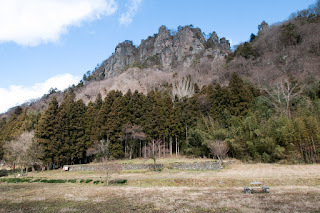 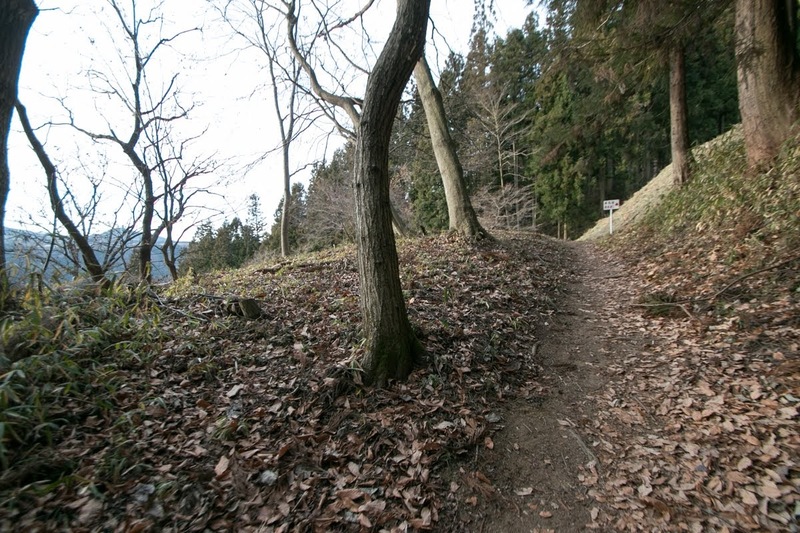 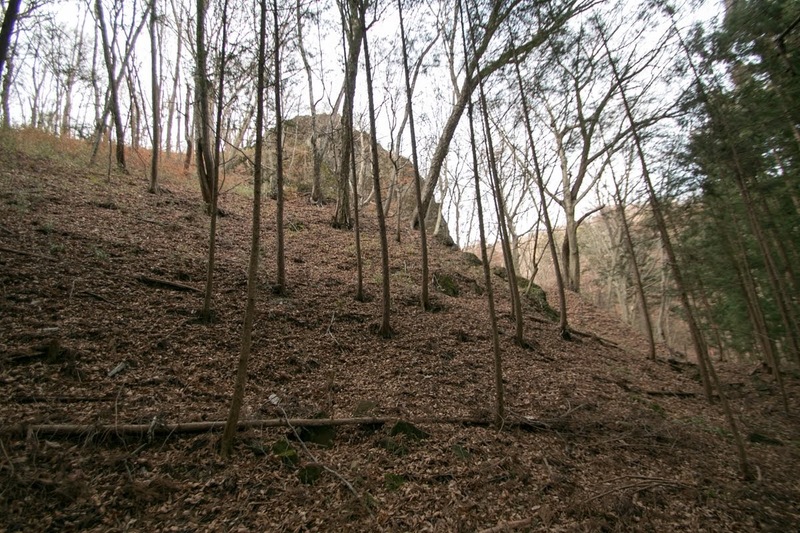 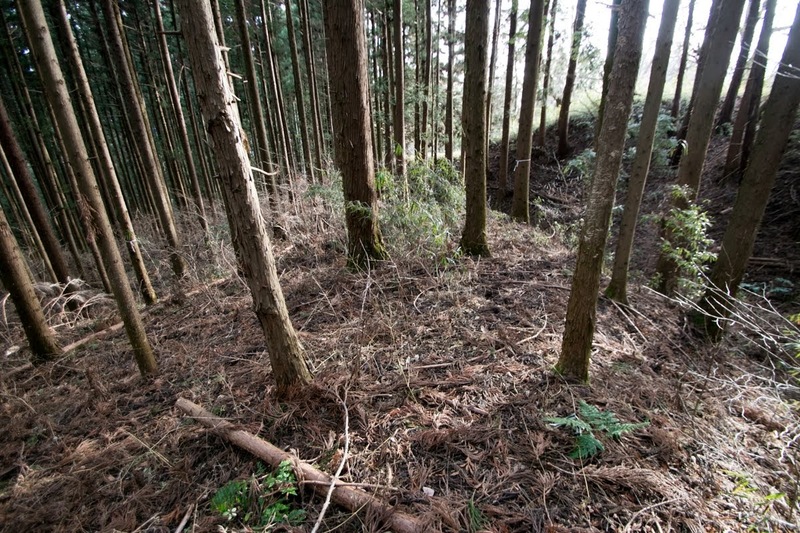 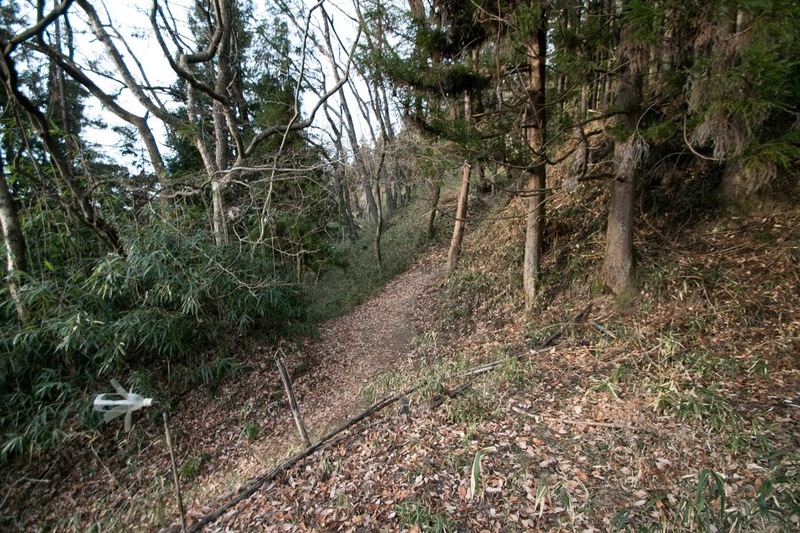 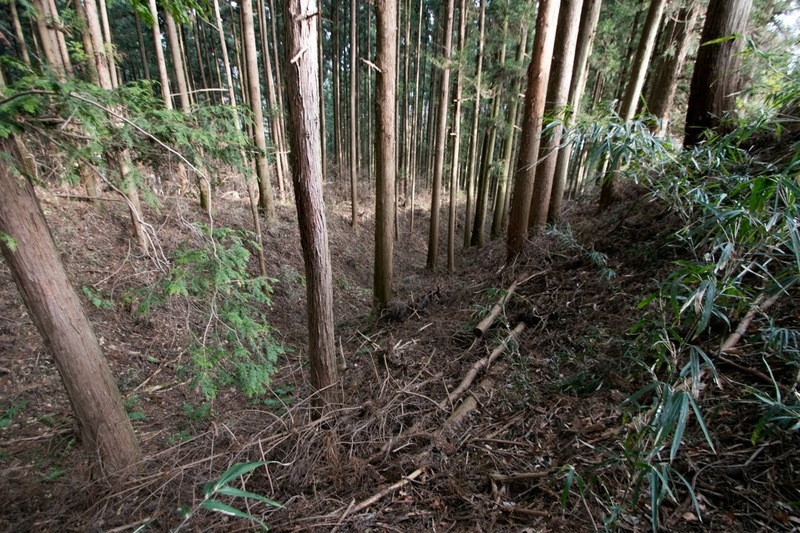 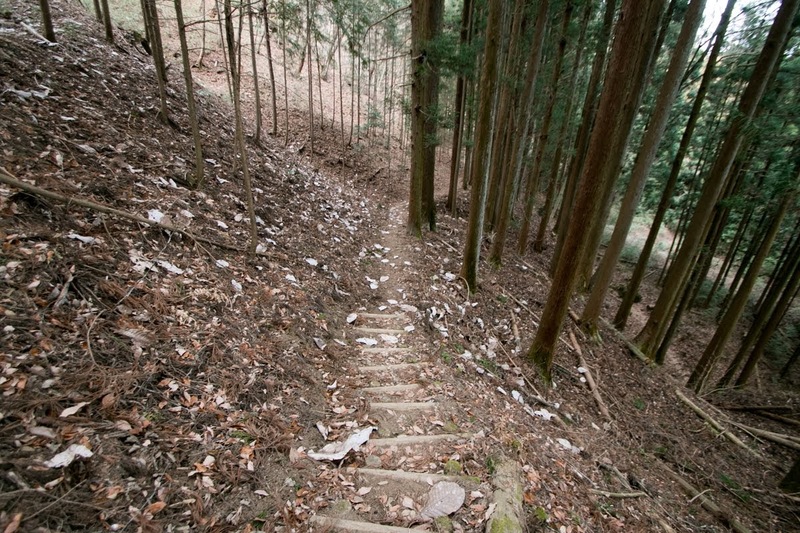 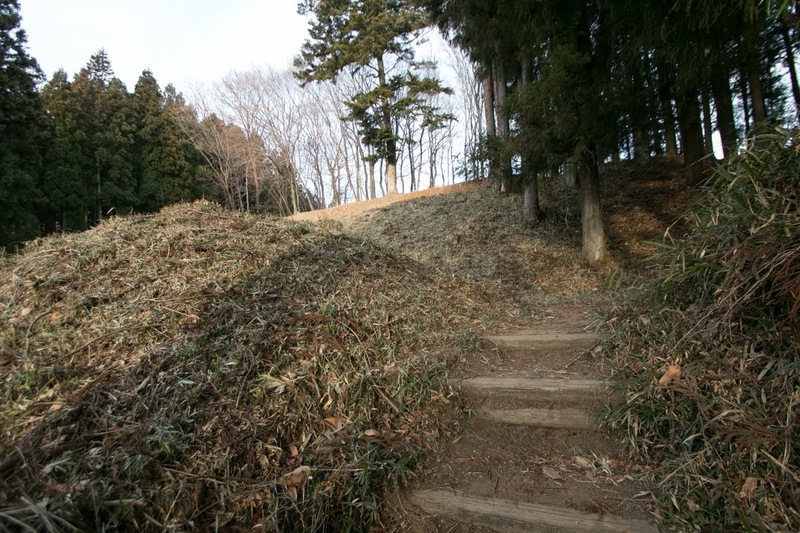 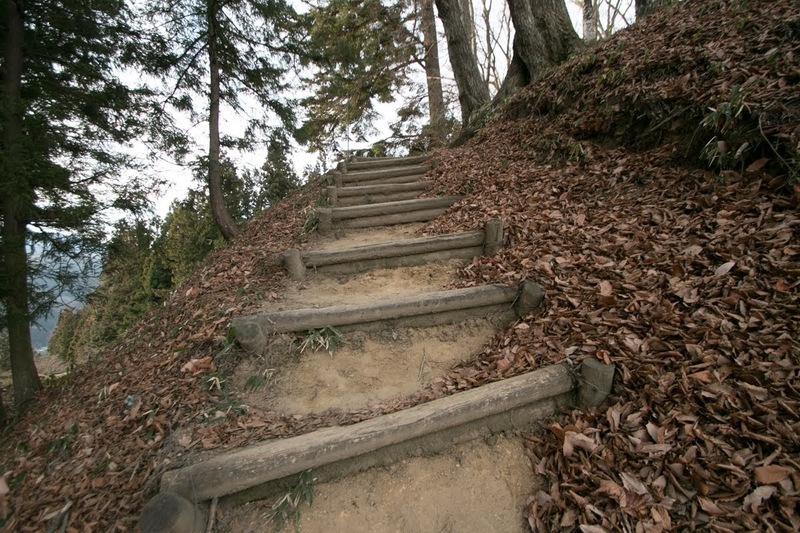 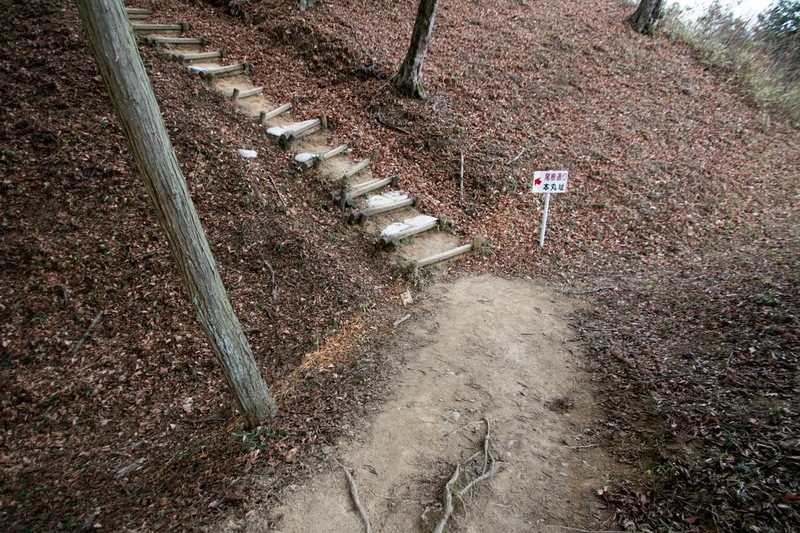 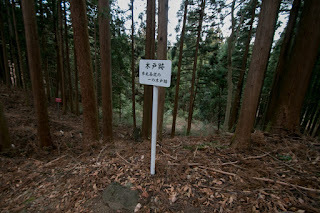 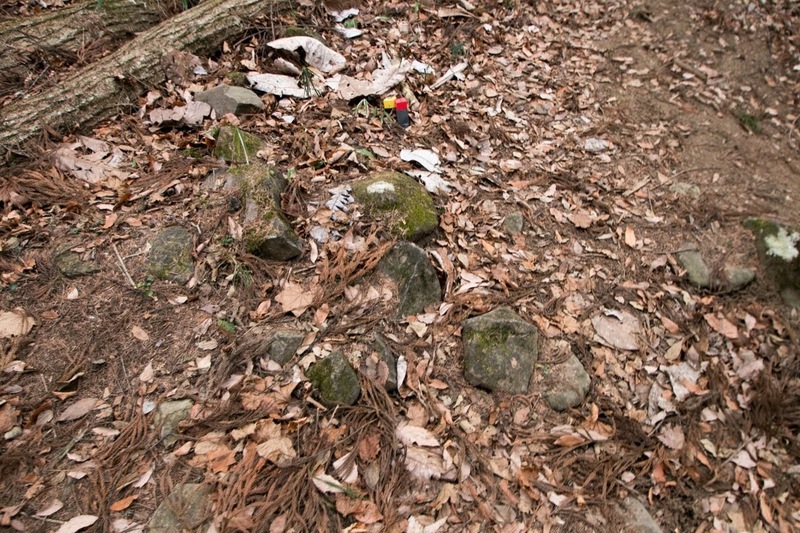 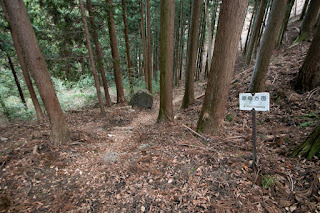 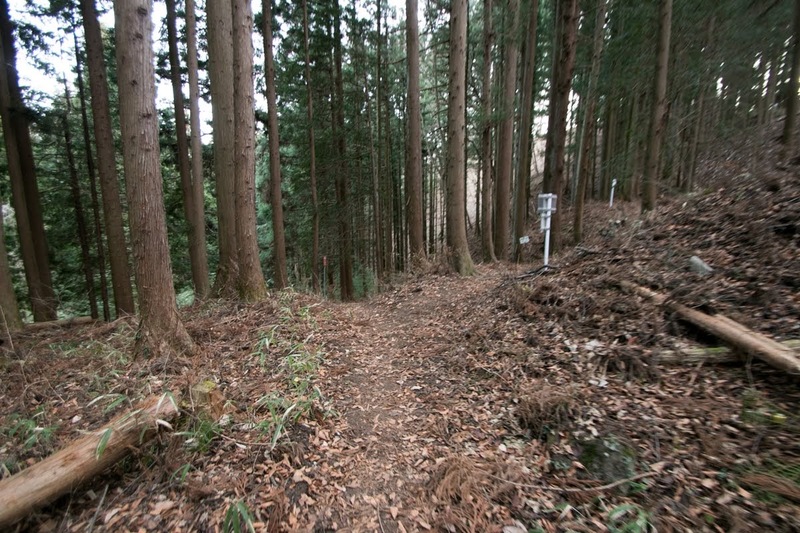 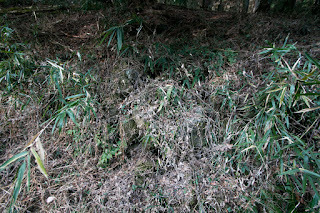 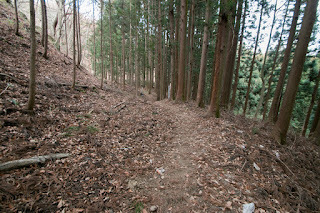 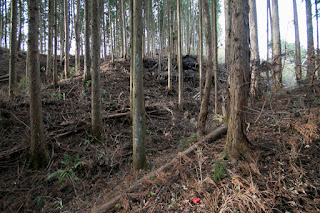 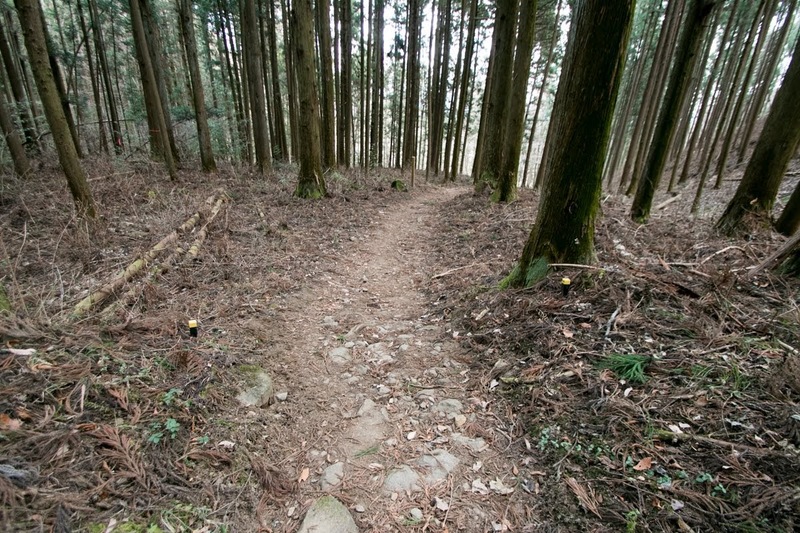 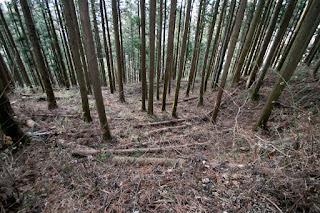 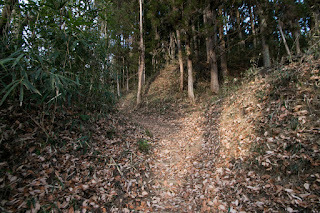 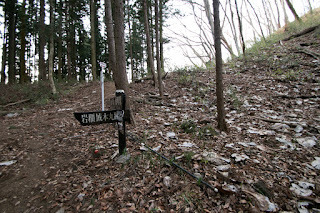 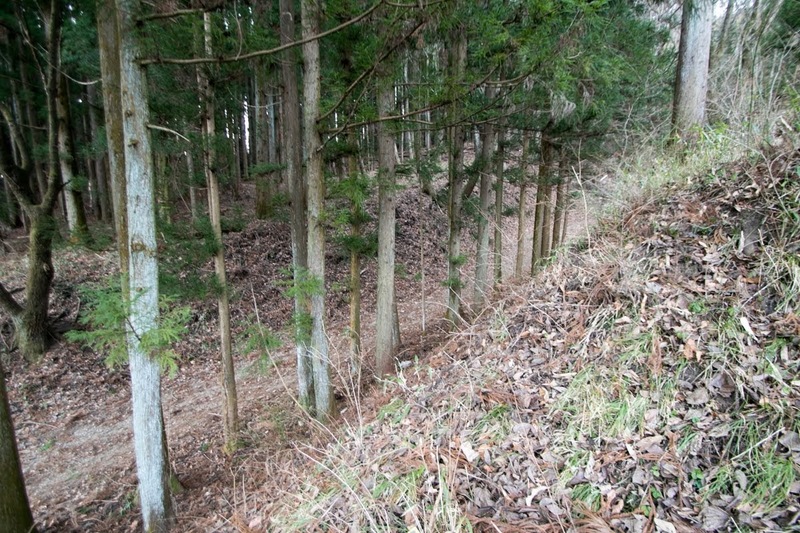 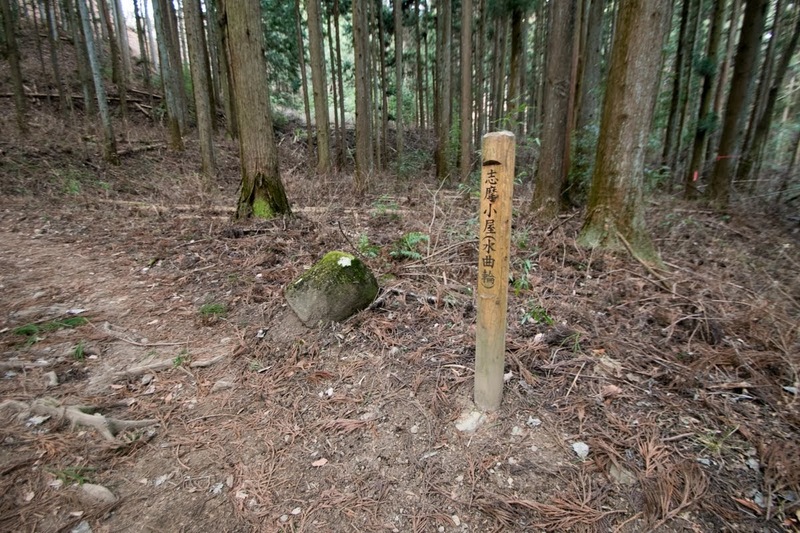 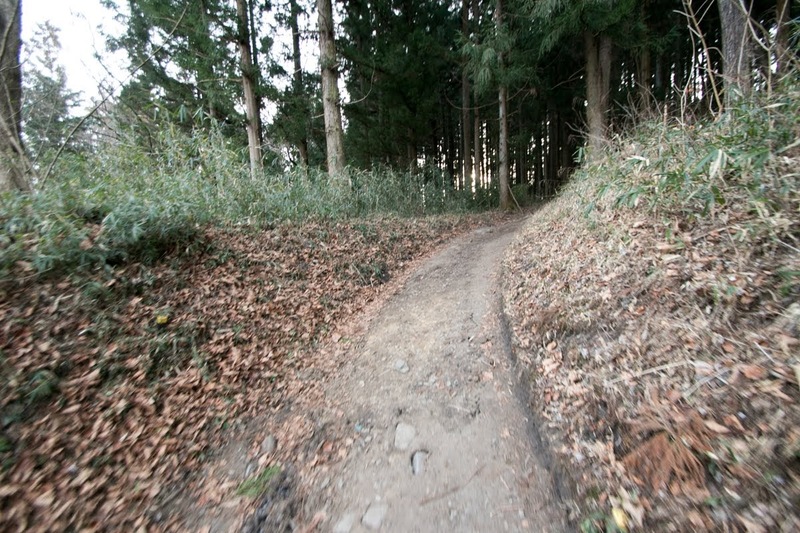 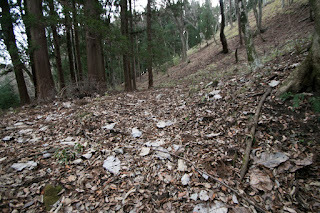 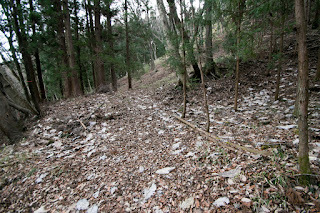 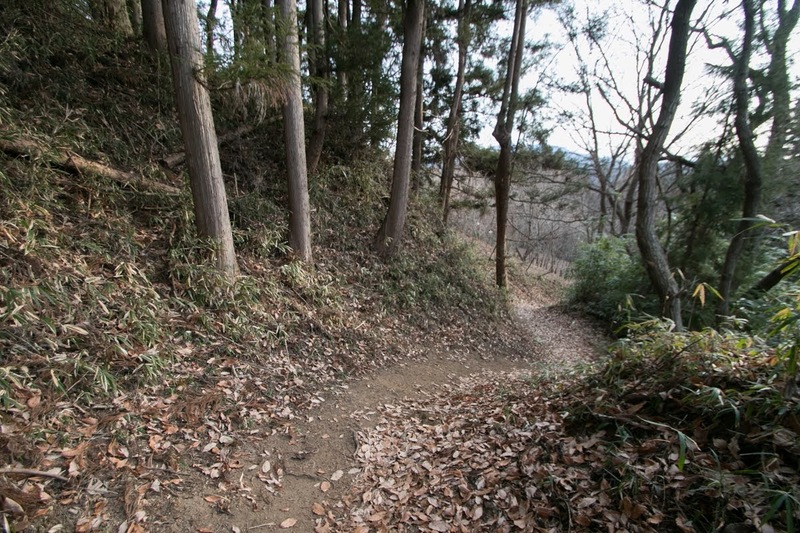 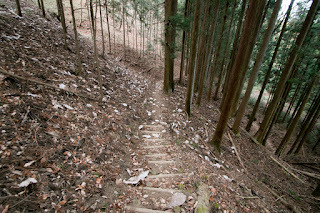 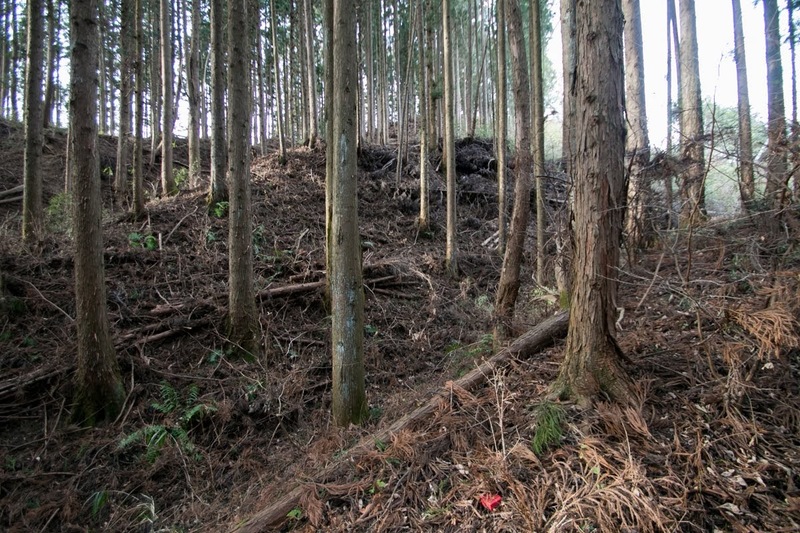 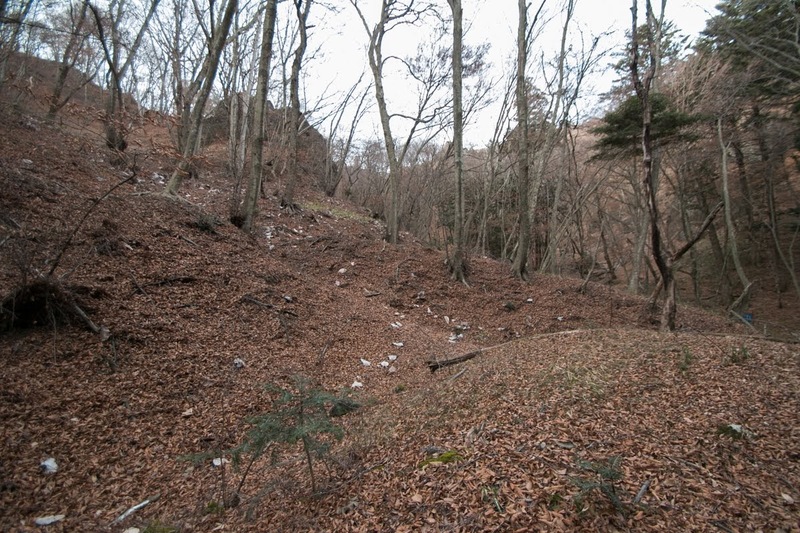 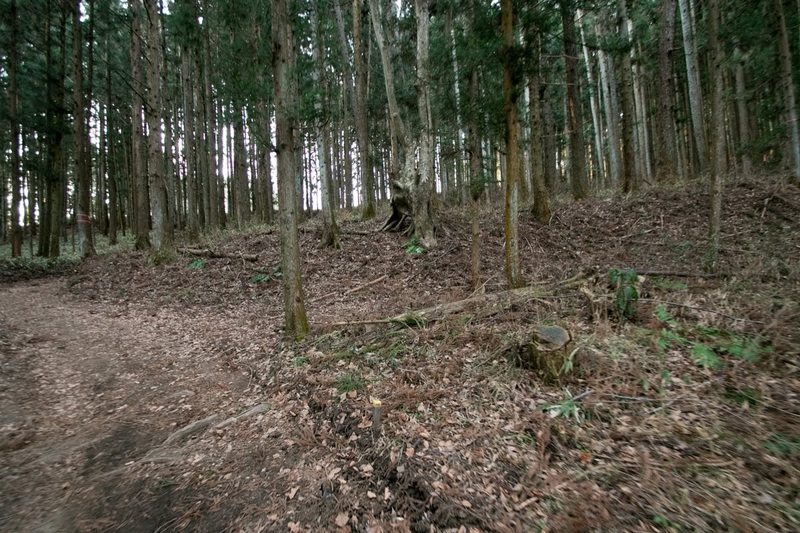 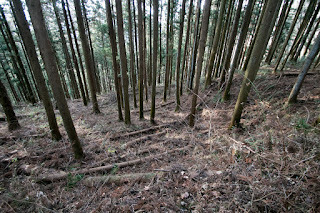 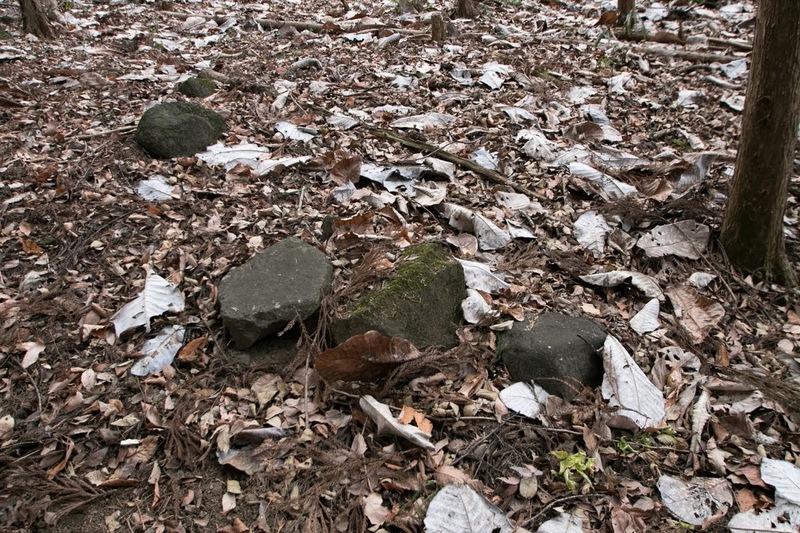 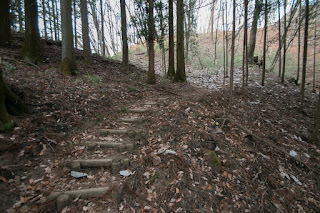 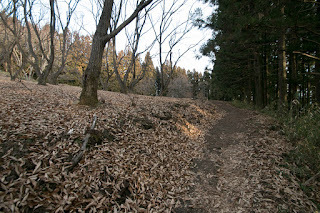 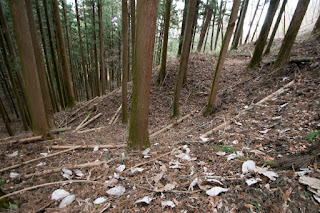 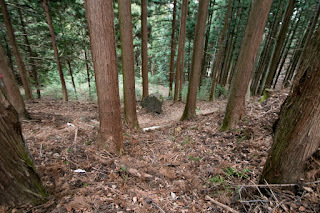 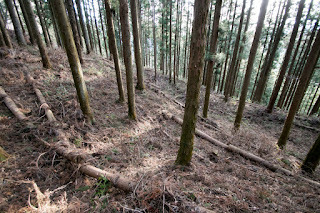 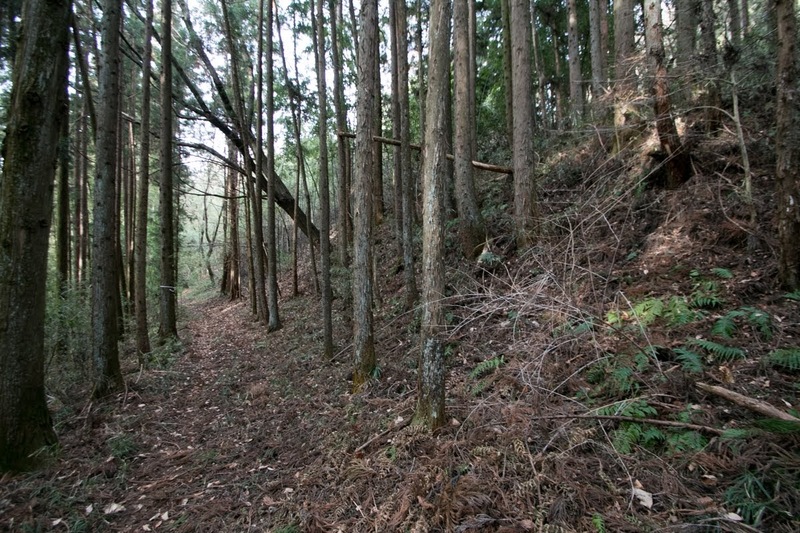 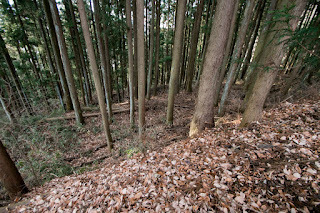 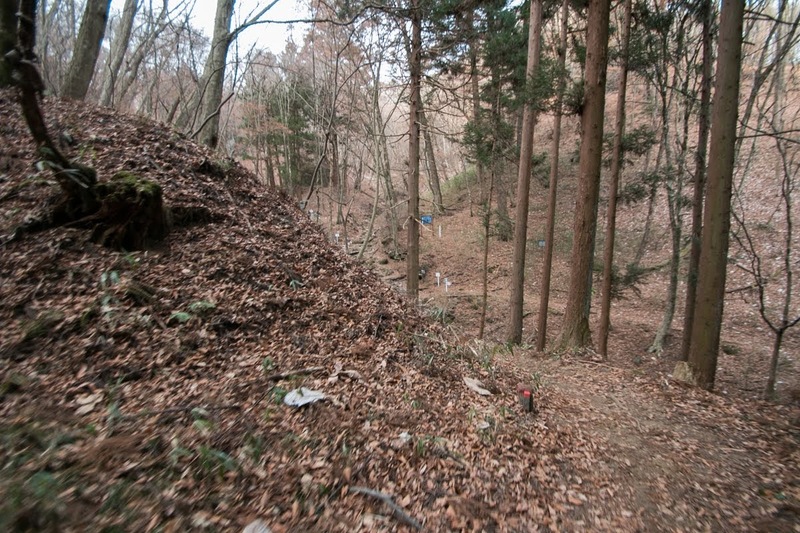 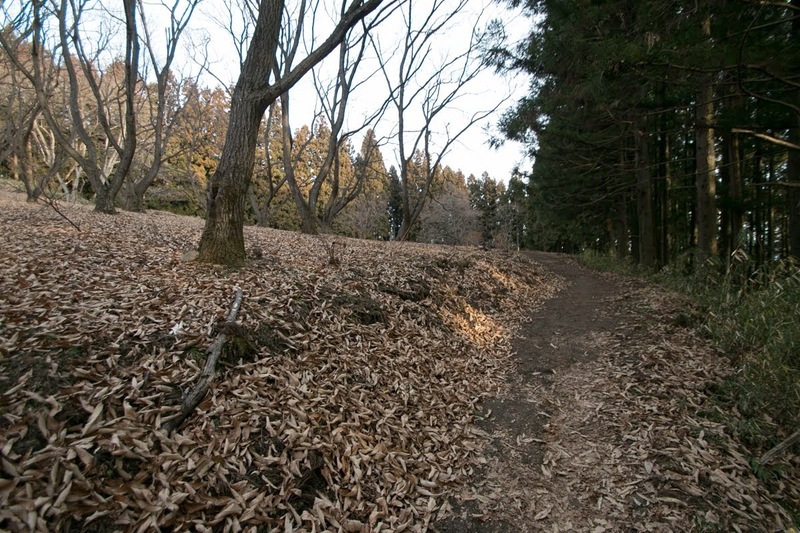 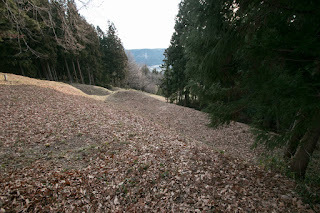 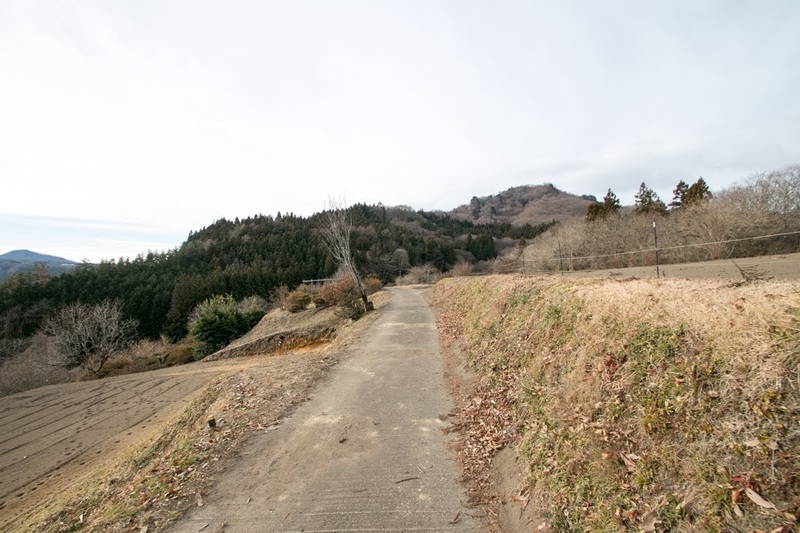 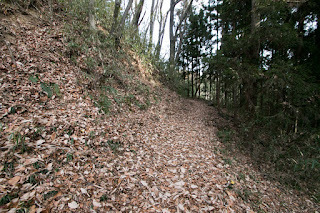 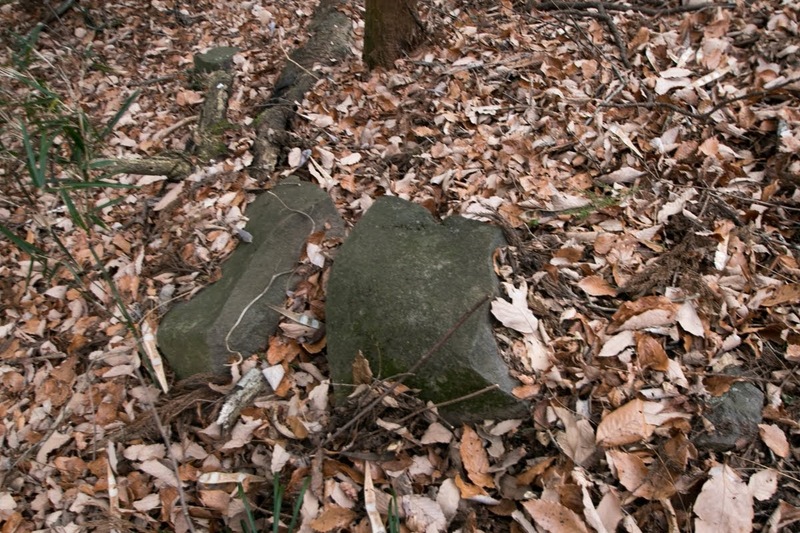 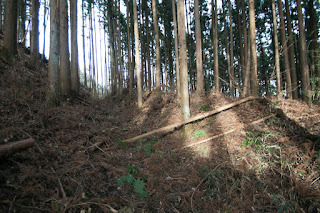 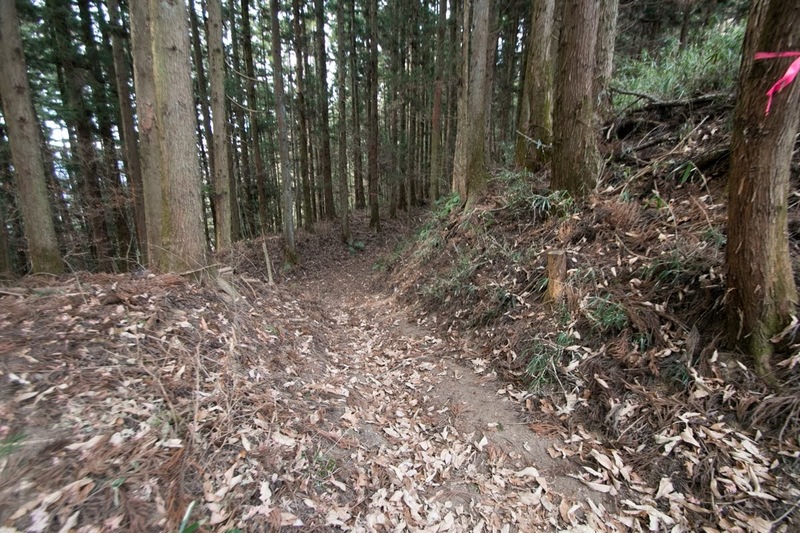 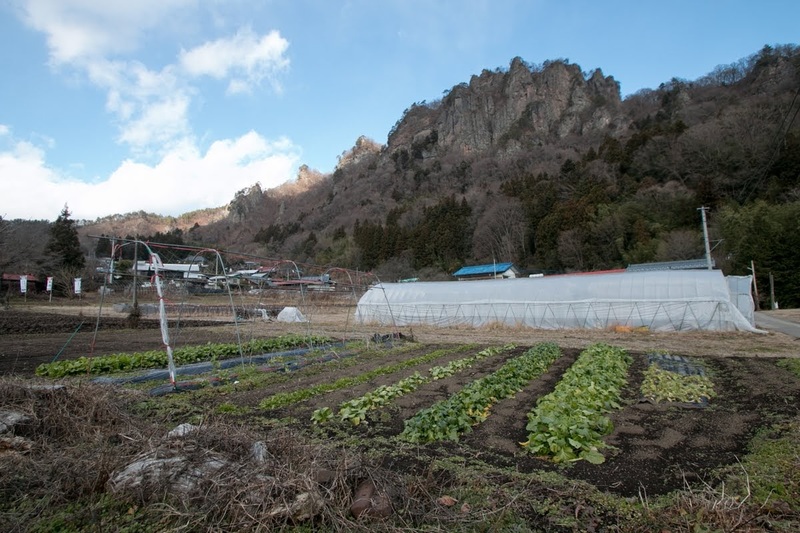 Iwabitsu mountain was a rocky mountain with strong shape, and had been worshiped historically. 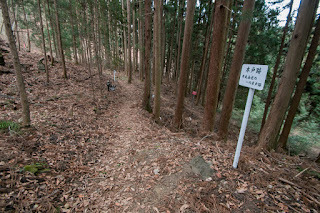 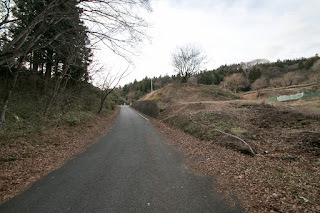 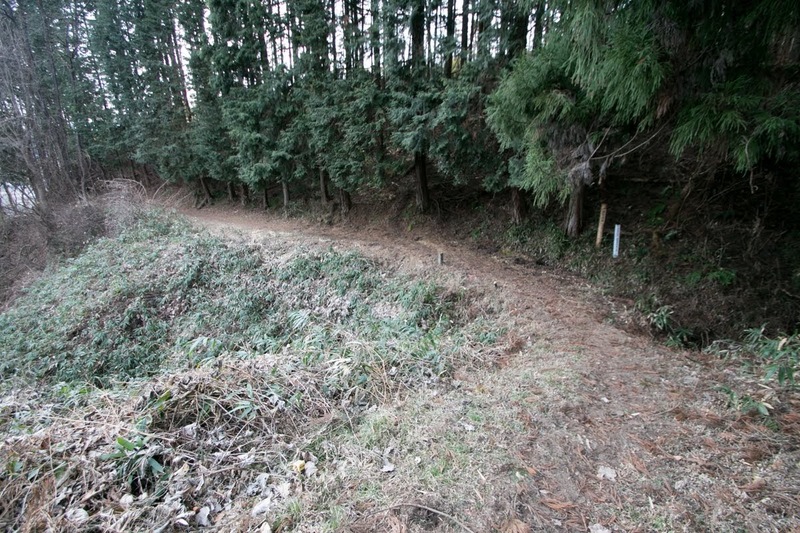 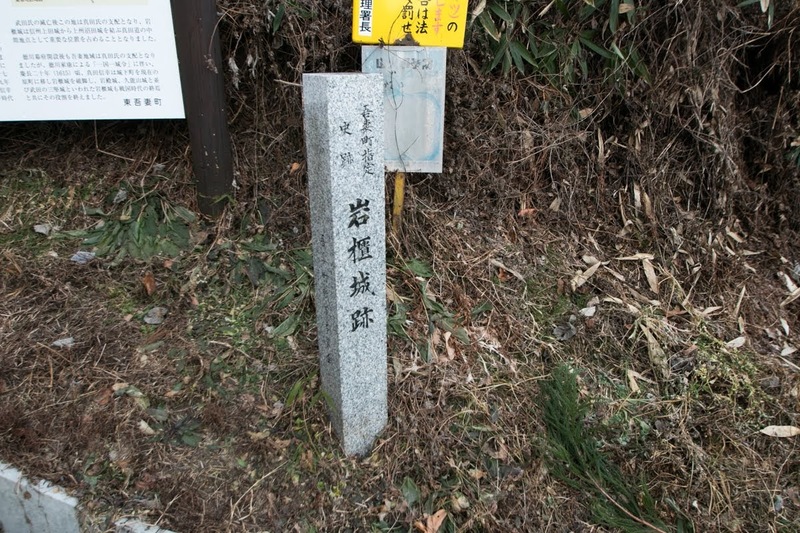 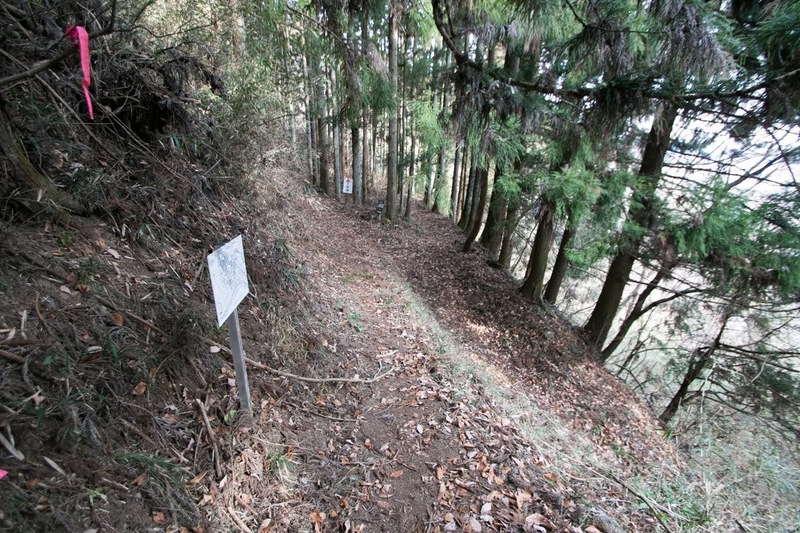 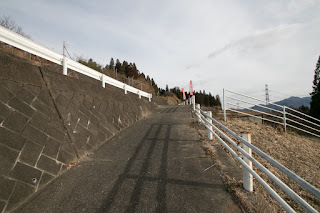 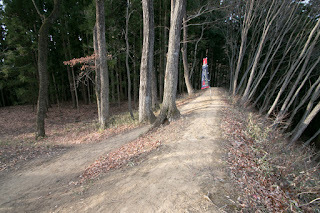 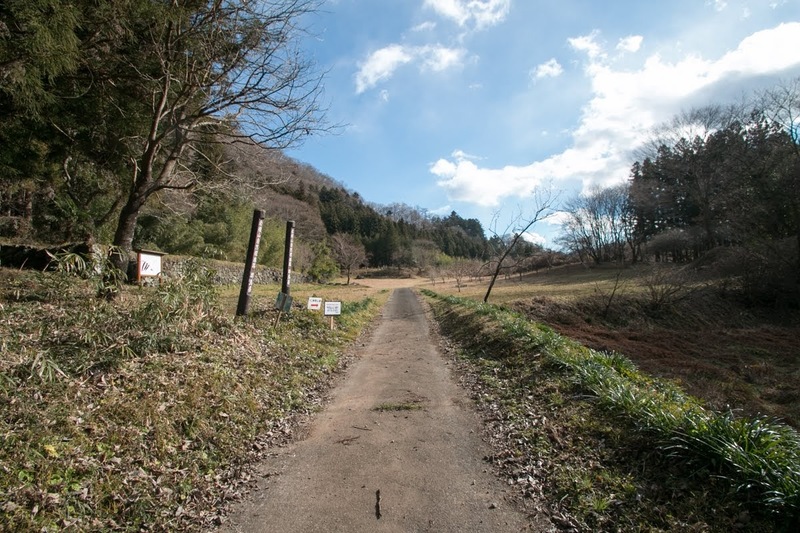 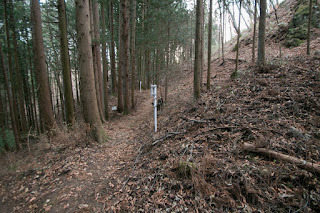 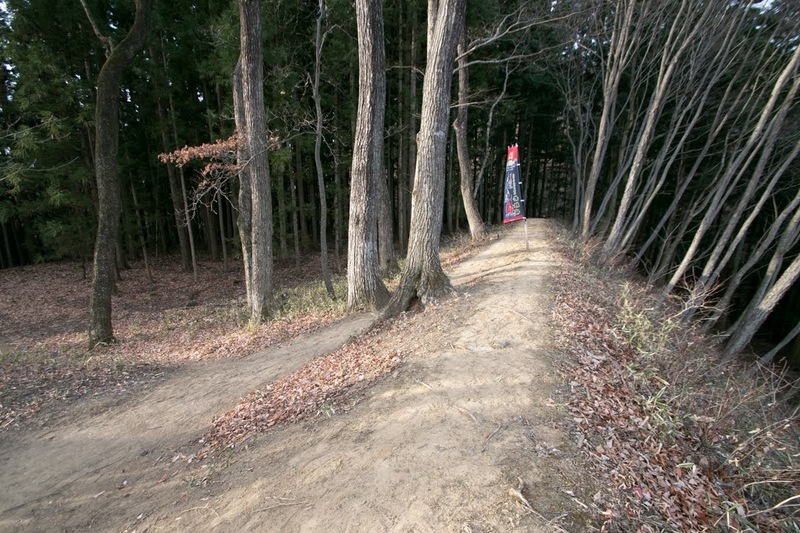 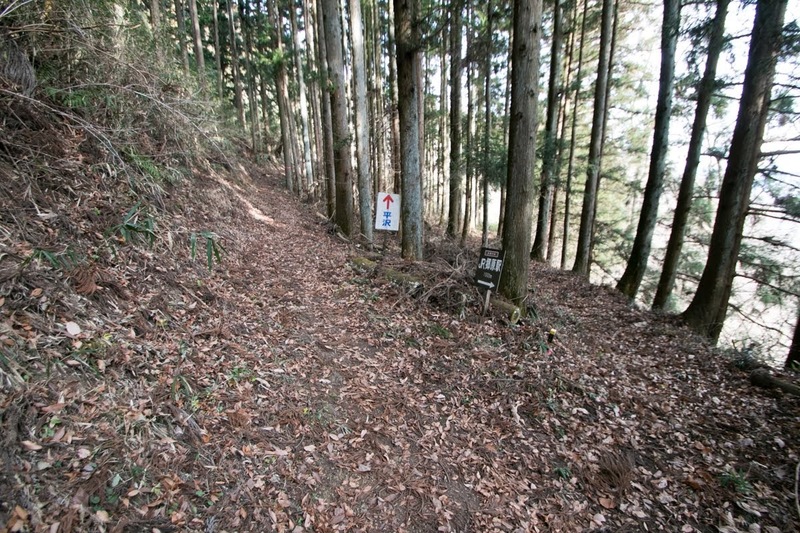 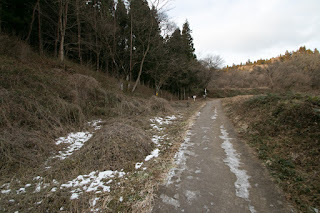 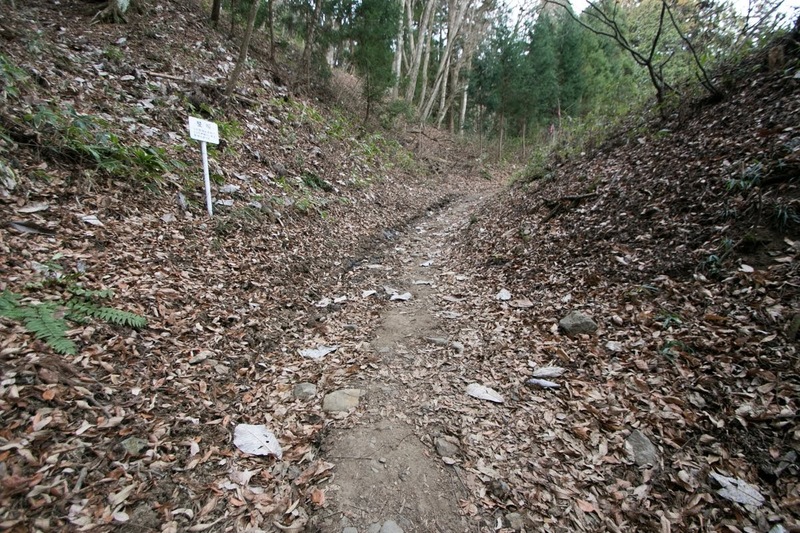 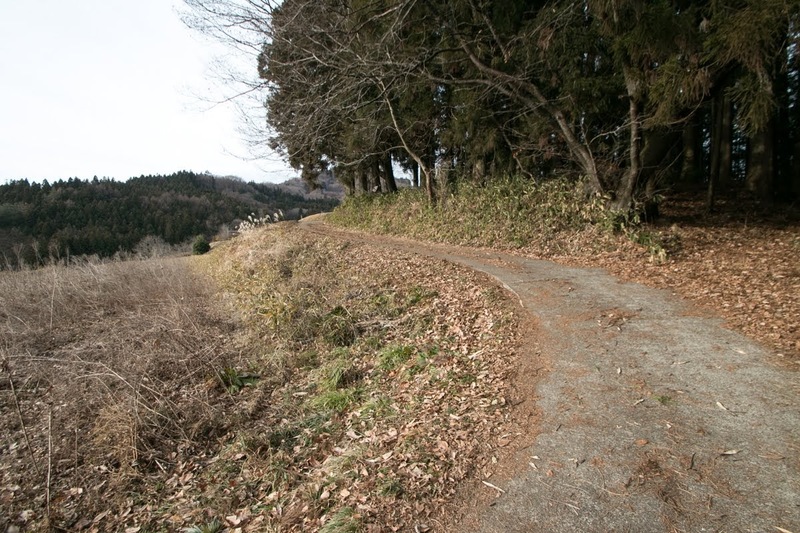 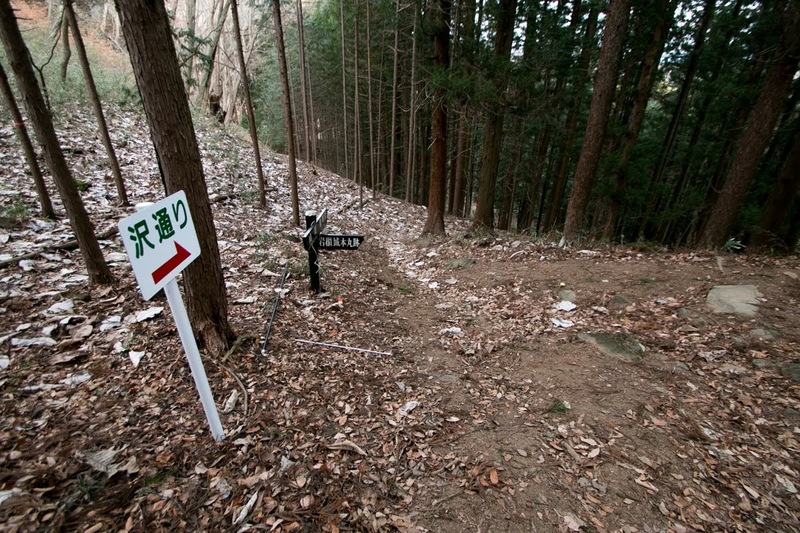 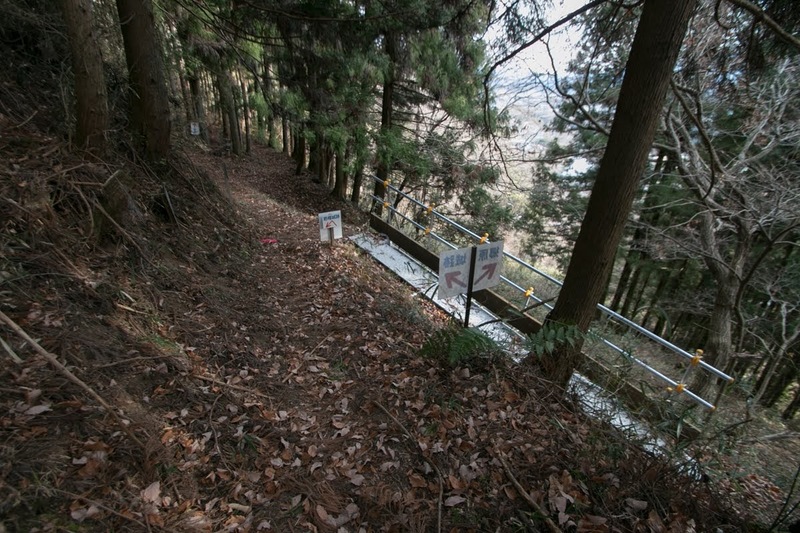 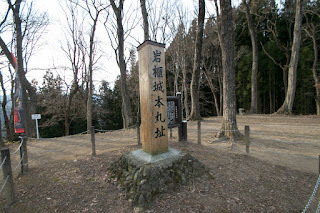 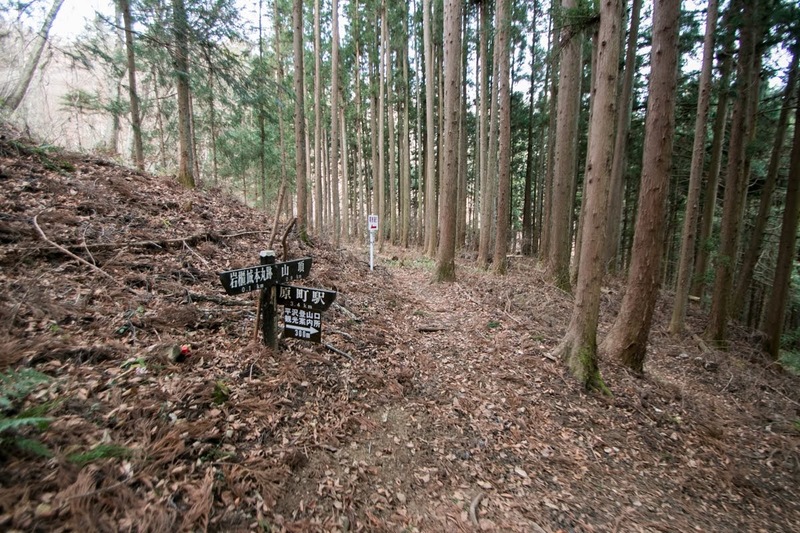 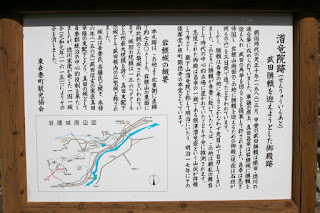 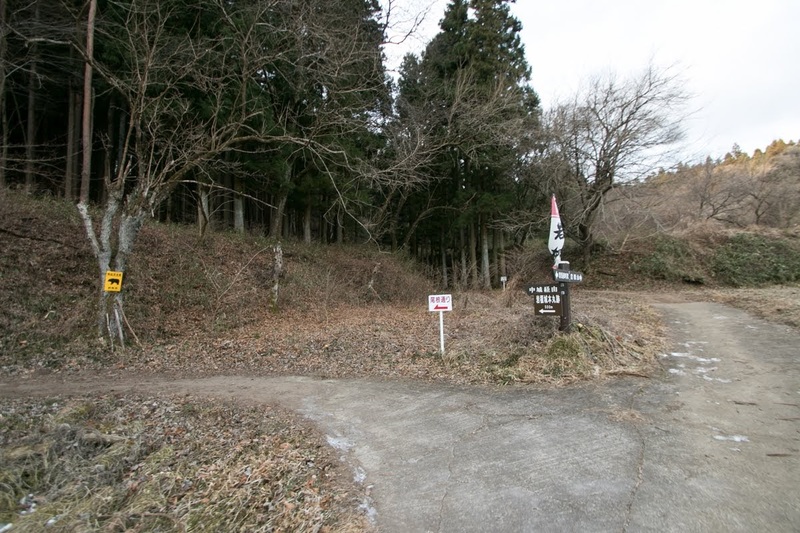 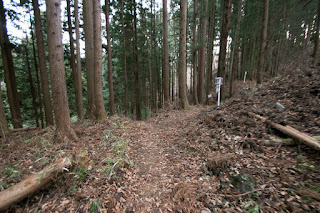 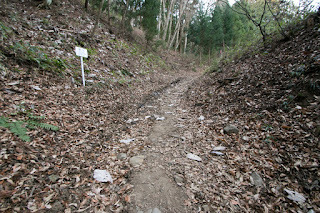 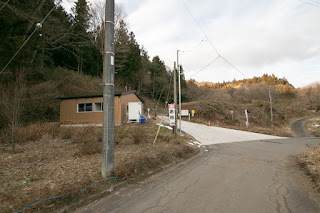 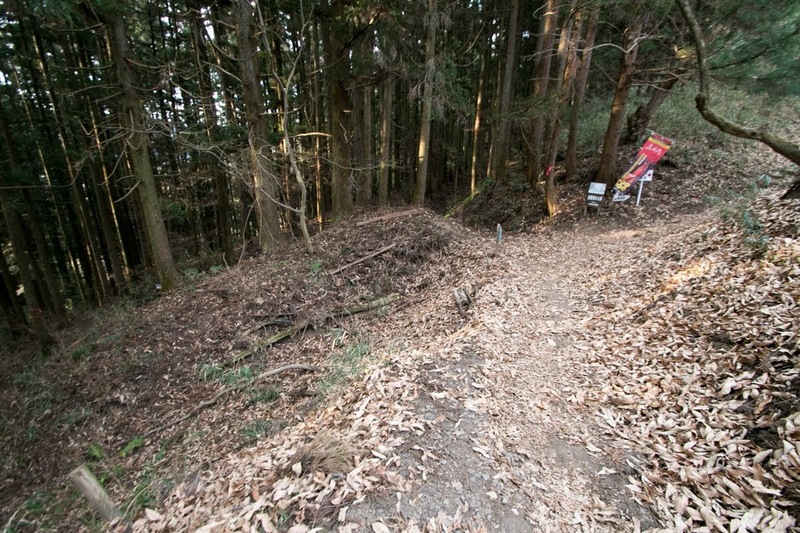 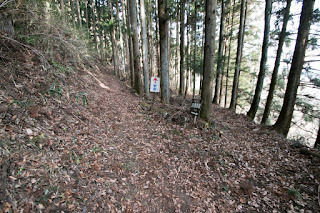 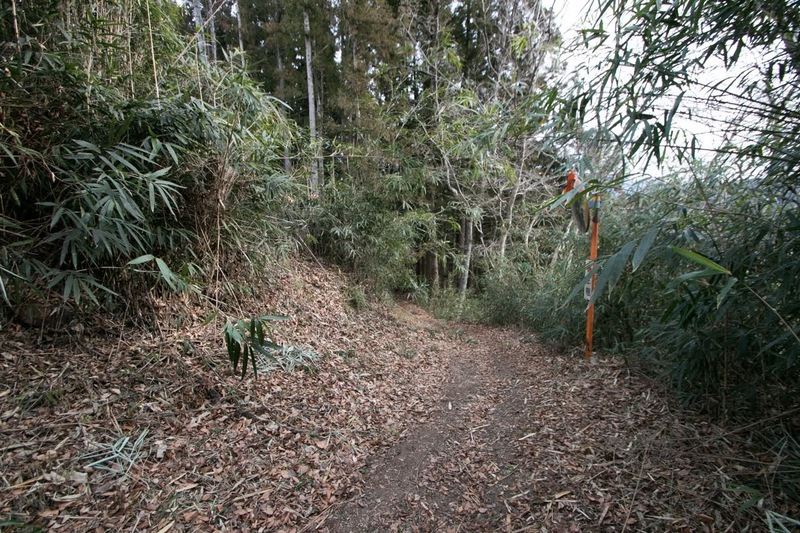 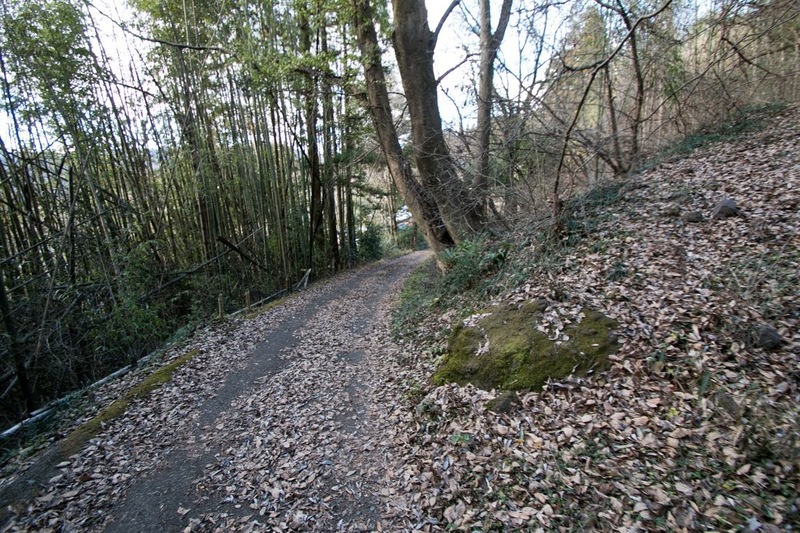 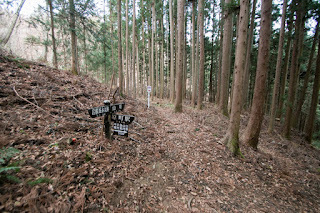 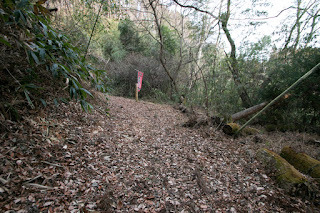 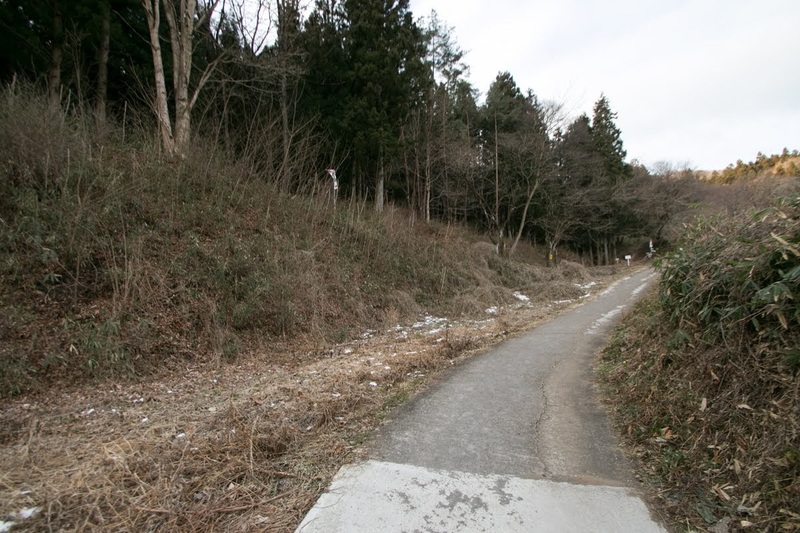 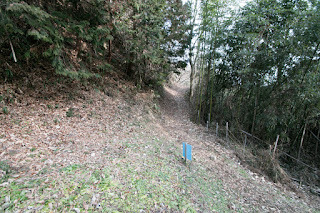 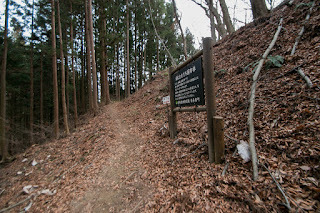 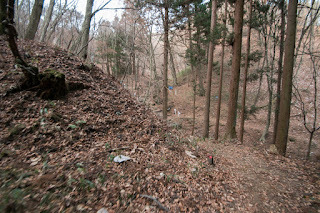 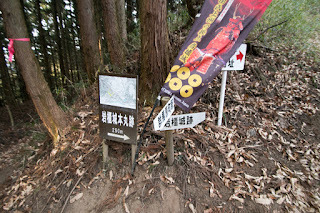 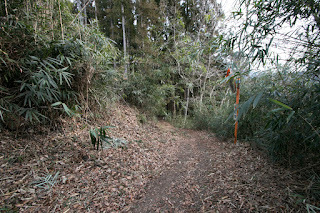 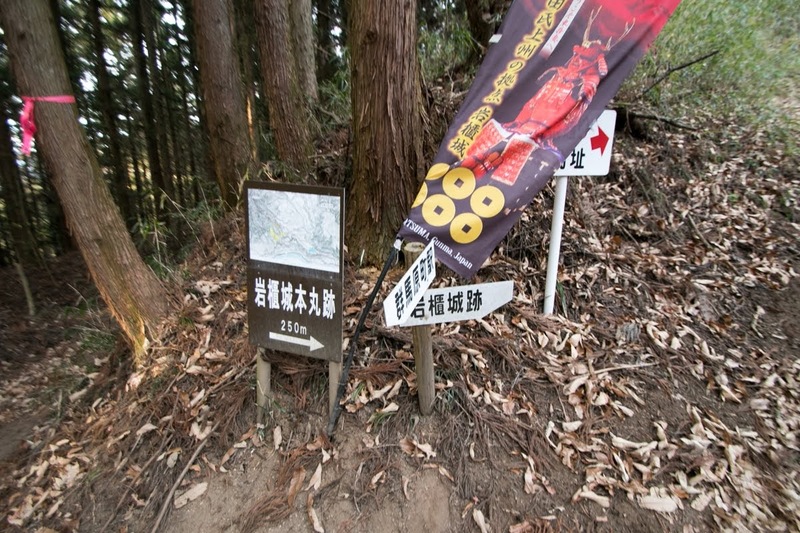 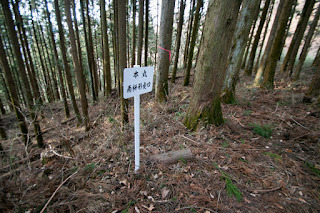 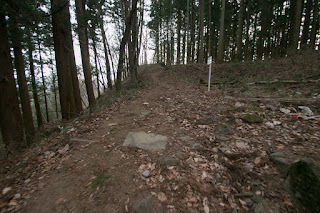 The main route from Gunma to Nagano was Nakasendo way pass through Usui Touge path 50km south of Torii Touge path, but Shinshu Kaido way was also an important by-pass way because the slope is looser than Nakasendo way and it was closer to Joetsu area (western part of Niigata prefecture). 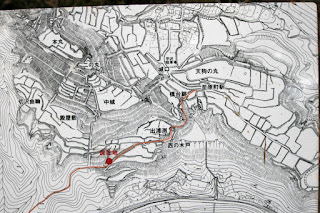 Iwabitsu area was a prosperous posting town of this Shinshukaido way. 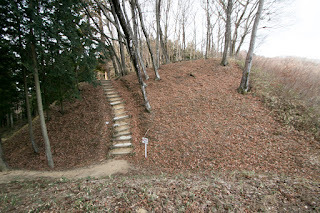 Iwabitsu castle was said to be built by Agatsuma clan, a local clan in 13th century. 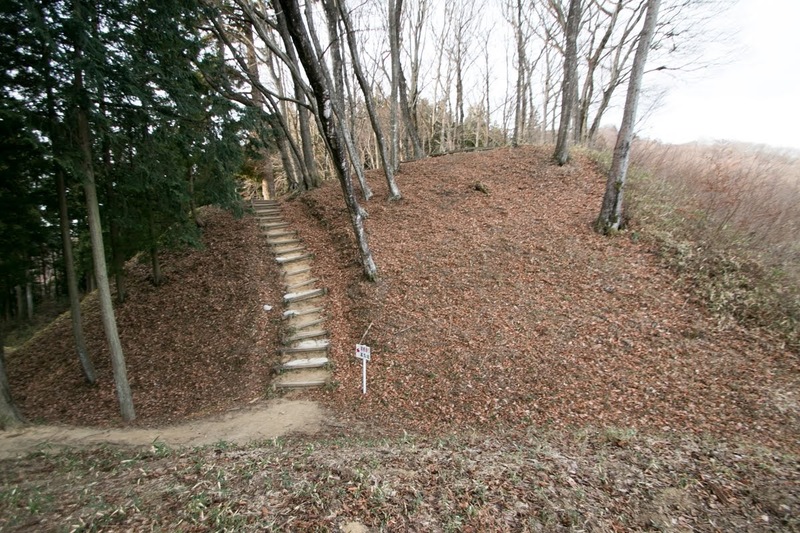 During Muromachi era, Iwabitsu castle was held by Saito clan, also a local lord. 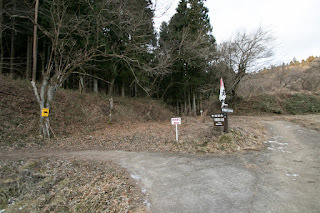 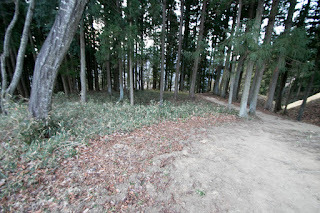 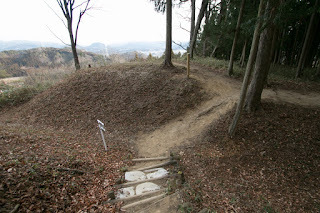 In the middle of 16th century, Yukitaka Sanada (1512-1574), leader of Sanada clan at Sanada area opposite of Torii Toge pass, attempted to advance into Agatsuma area under the assist from Shingen Takeda (1521-1573), a warlord of Kai province (Yamanashi prefecture). 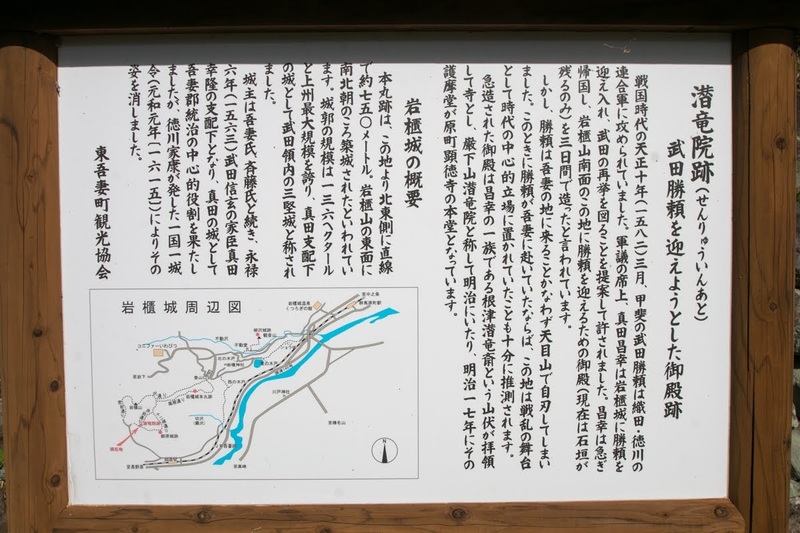 In response to this Saito clan resisted to Sanada clan cooperating with Kenshin Uesugi (1530-1578), a warlord of Echigo province (Niigata prefecture) and rival of Kenshin. But due to plot of Yukitaka and difficulty of assistance from far distant Echigo province, Yukitaka finally captured Iwabitsu castle in 1563, and seized whole Agatsuma area in a few years. 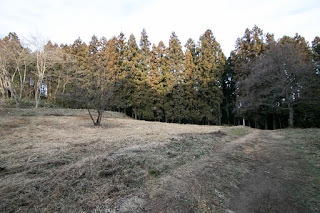 Masayuki Sanada (1547-1611), son of Yukitaka, expanded his territory to Kozuke country utilising Iwabitsu castle. 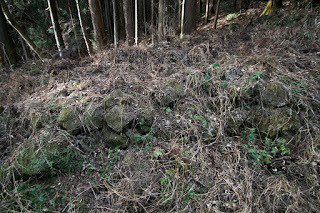 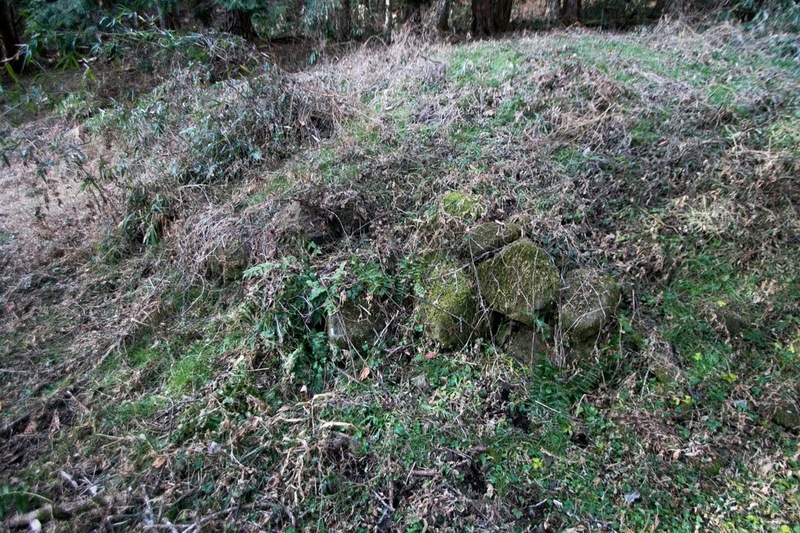 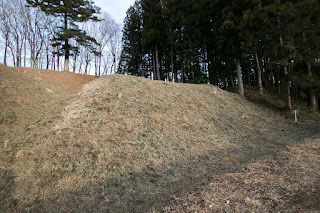 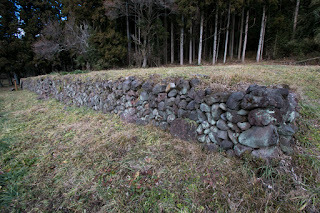 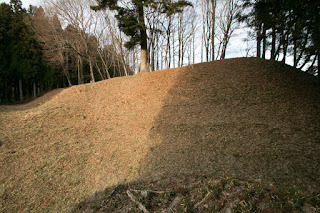 Masayuki seized Nagurumi castle as a bridgenead, and in 1579, Masayuki captured Numata castle, a major castle at norther part of Kozuke province. 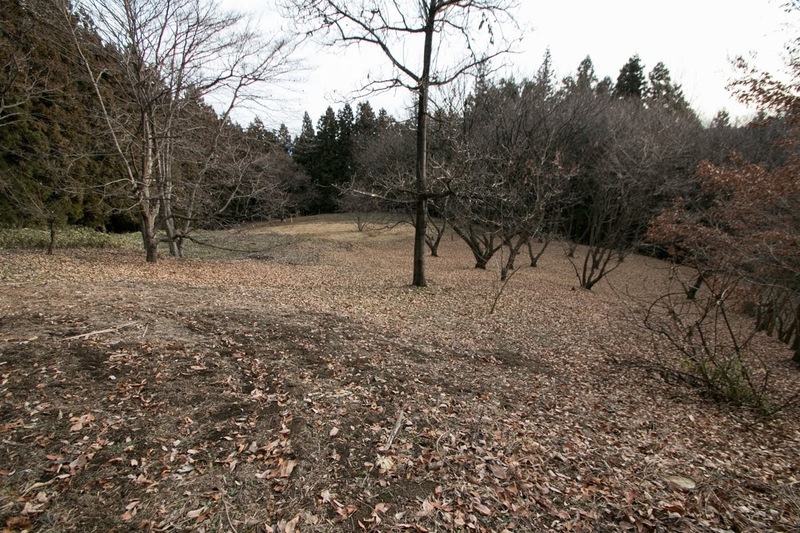 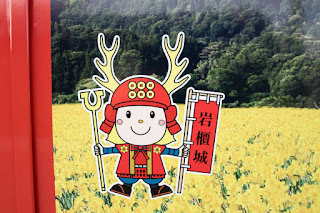 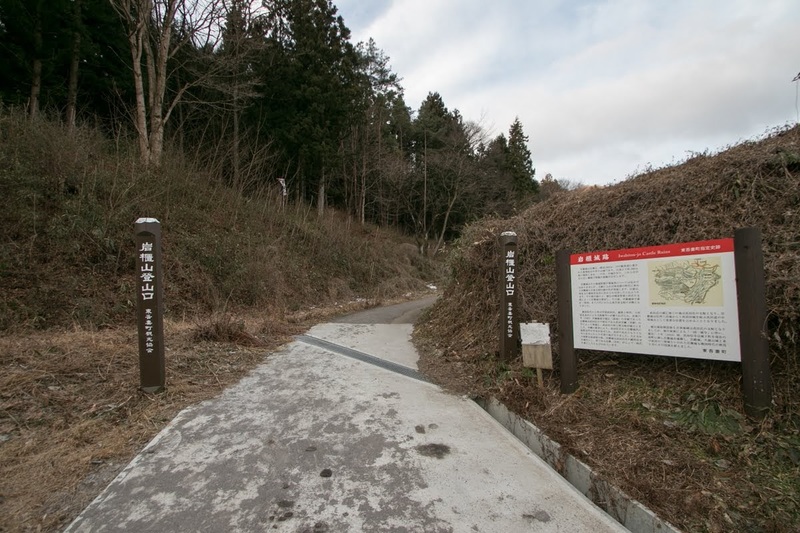 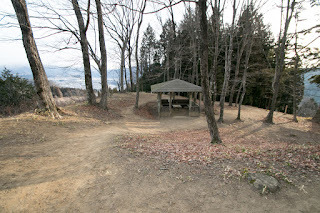 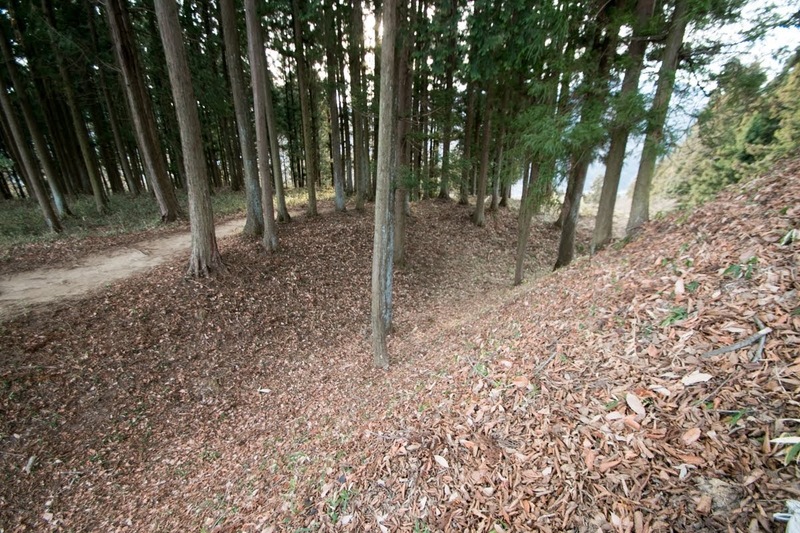 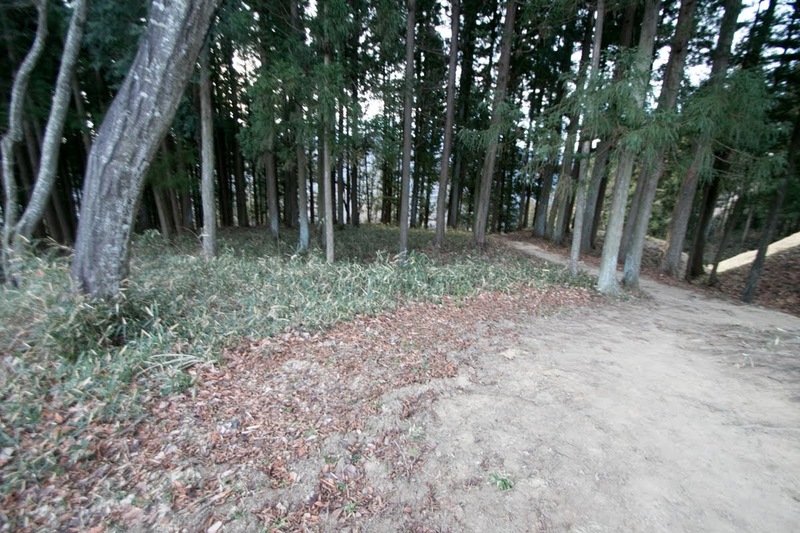 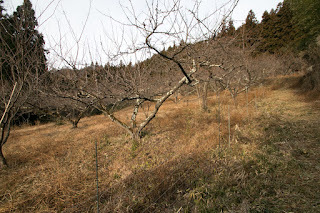 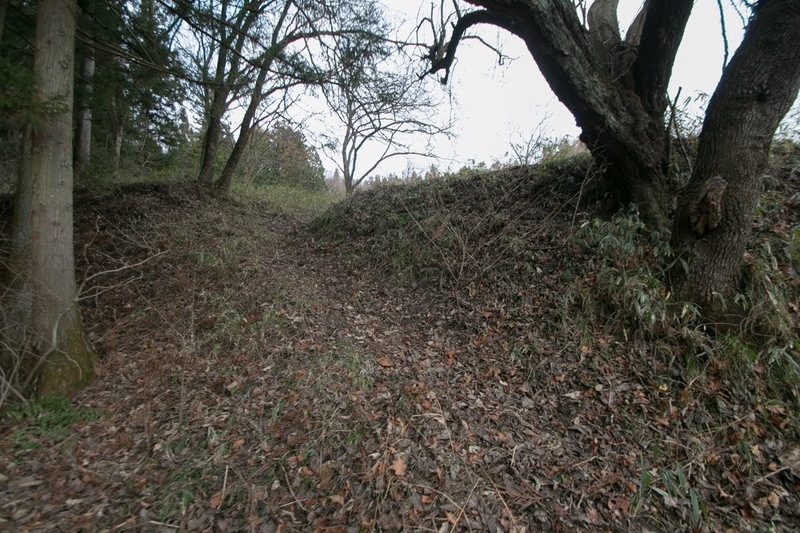 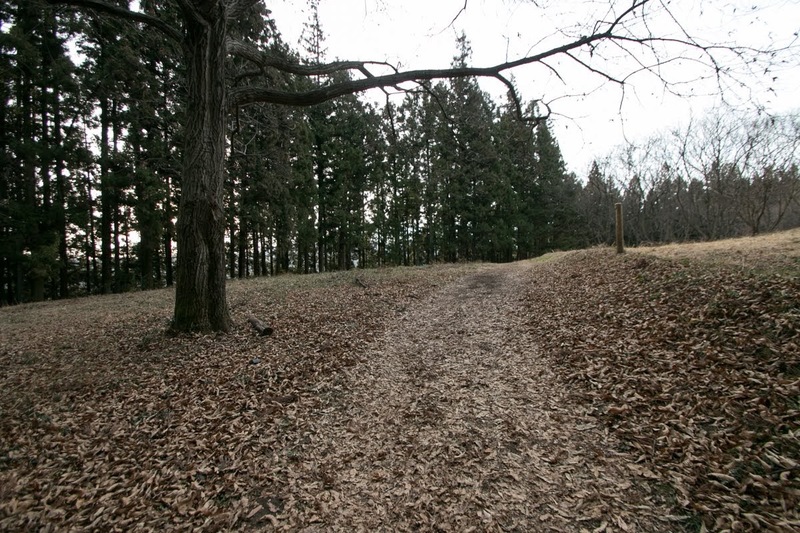 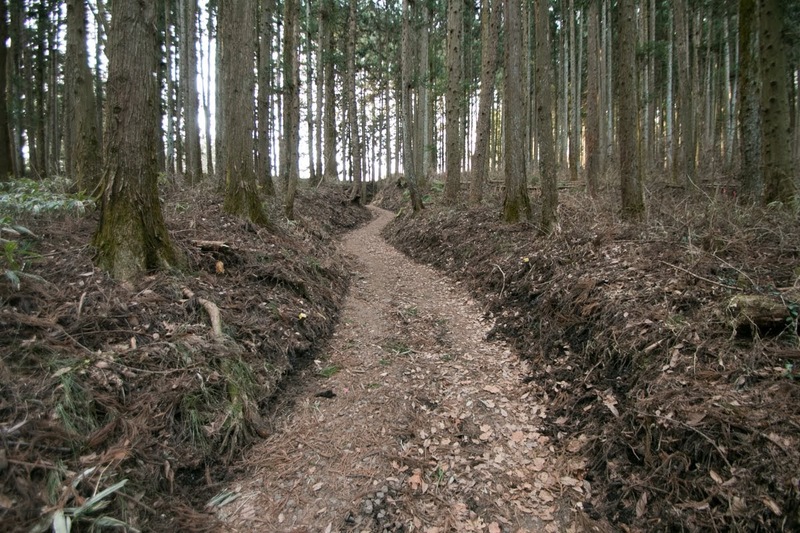 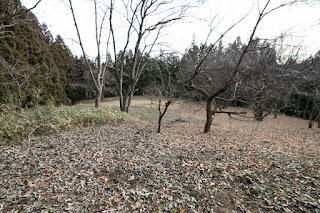 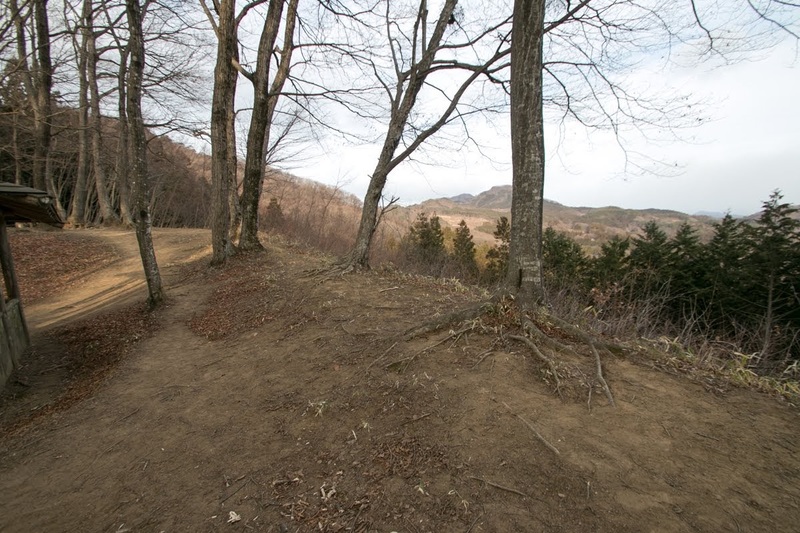 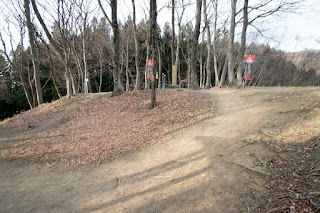 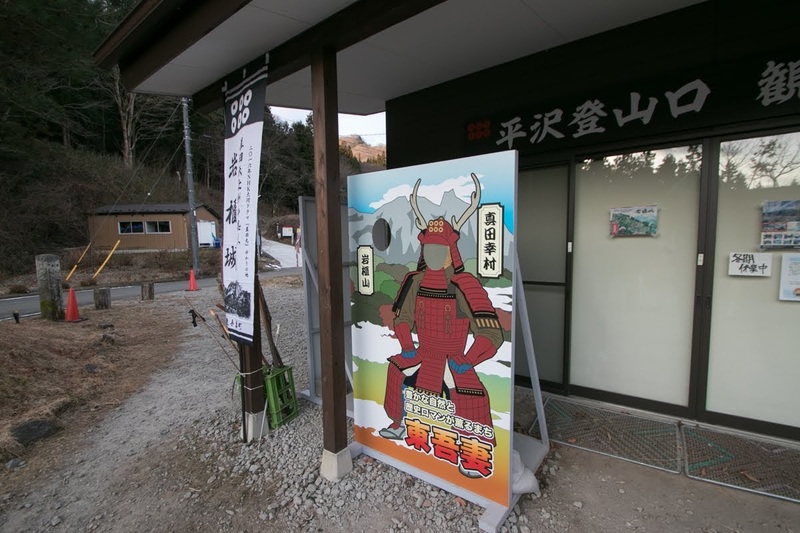 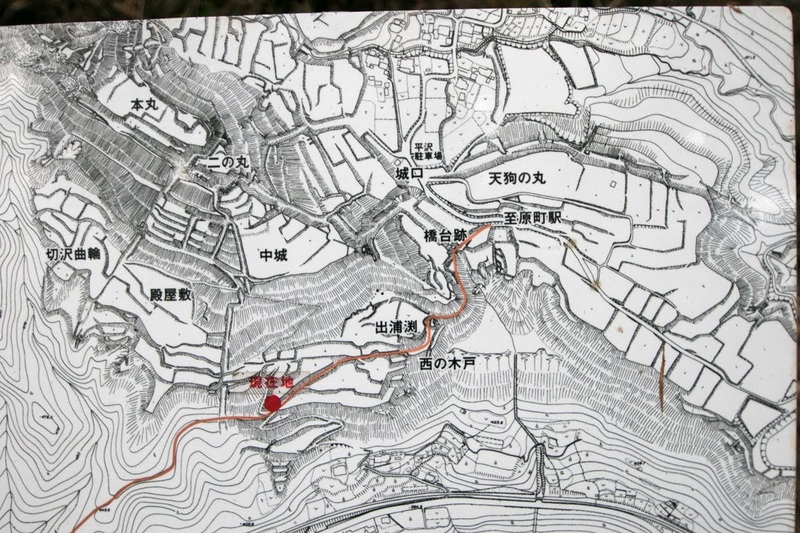 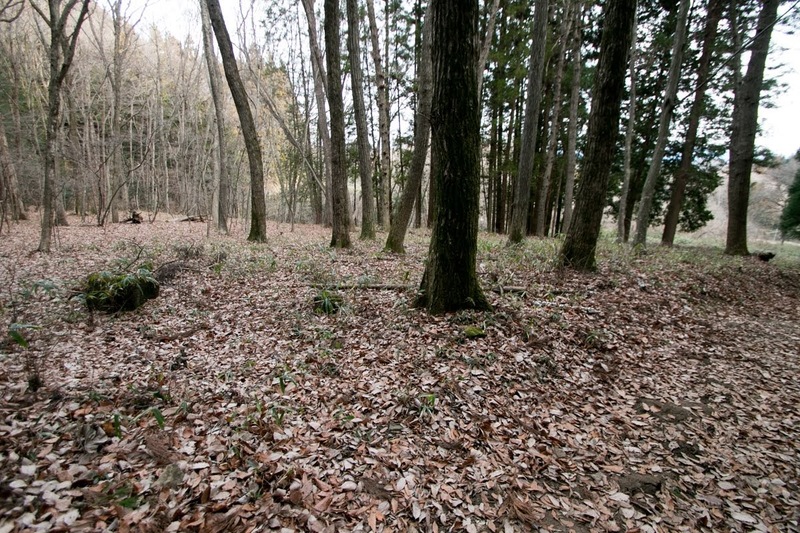 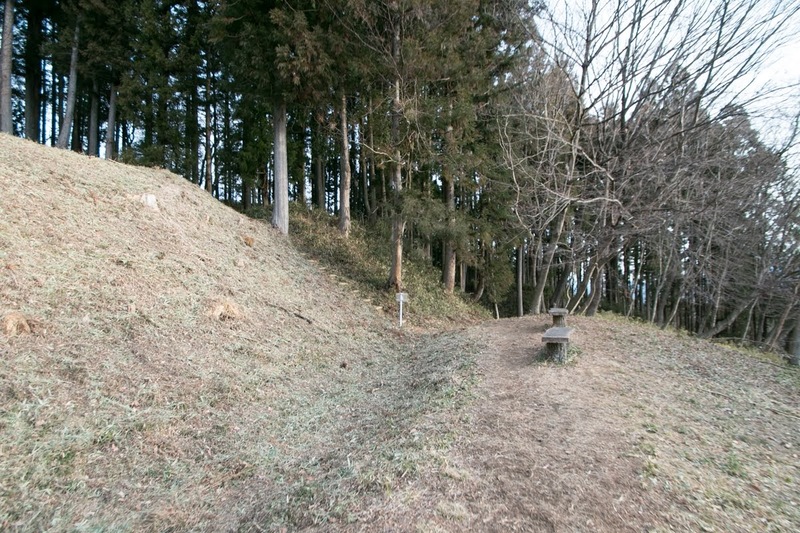 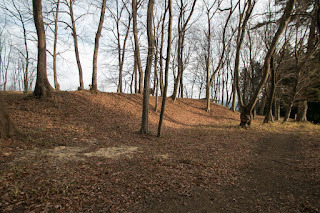 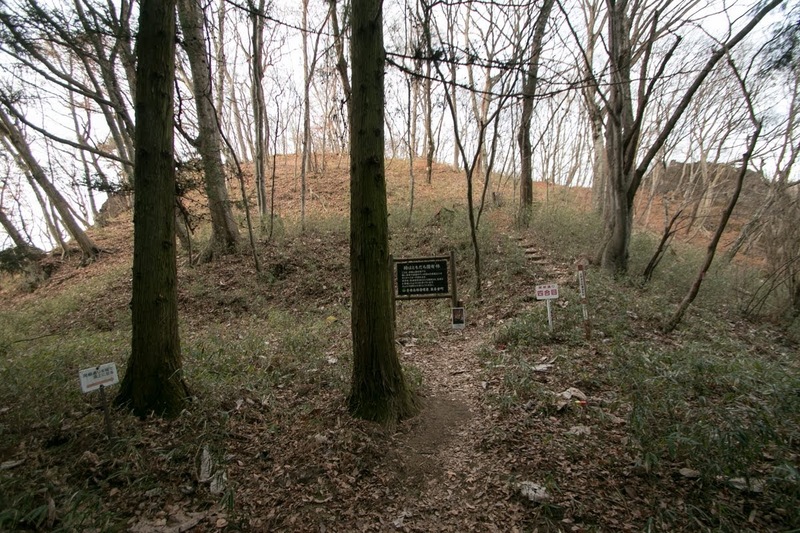 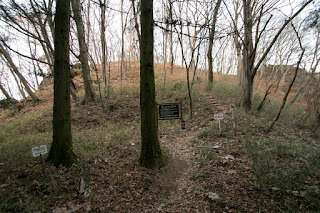 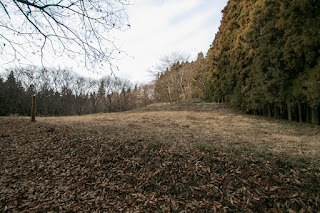 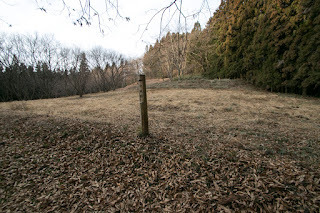 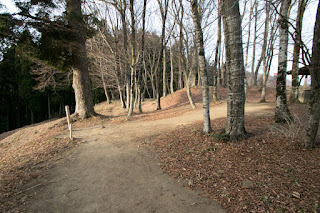 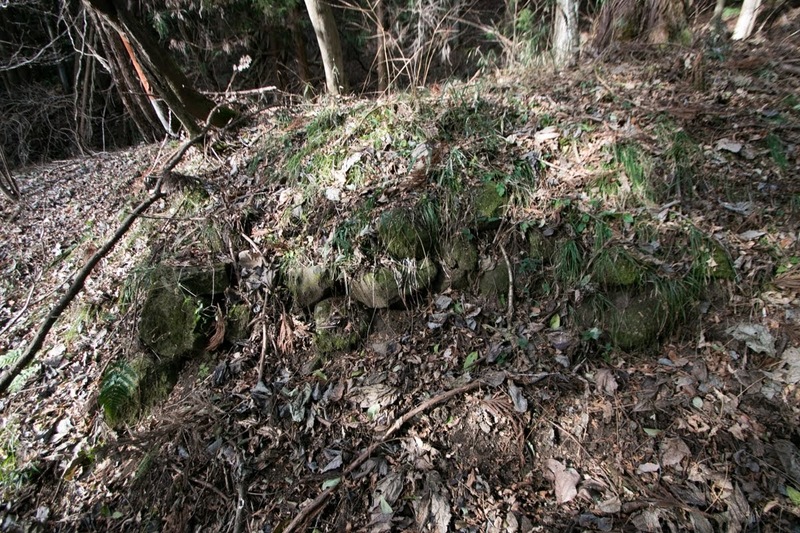 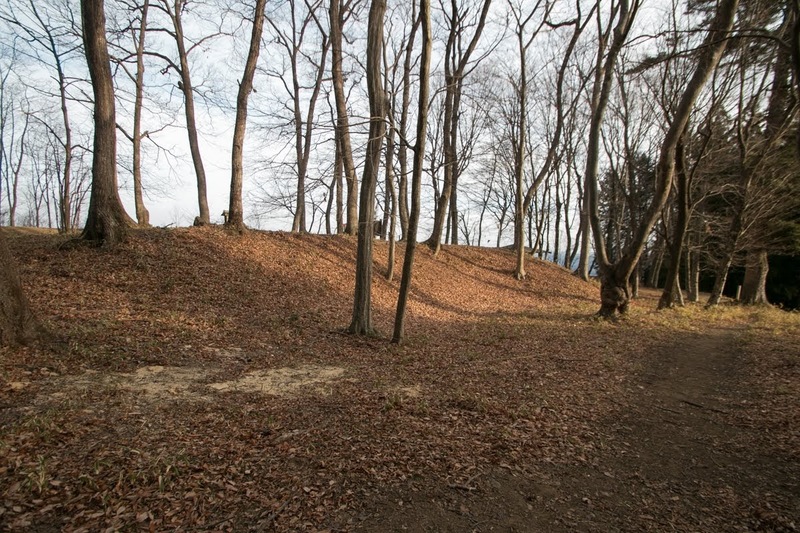 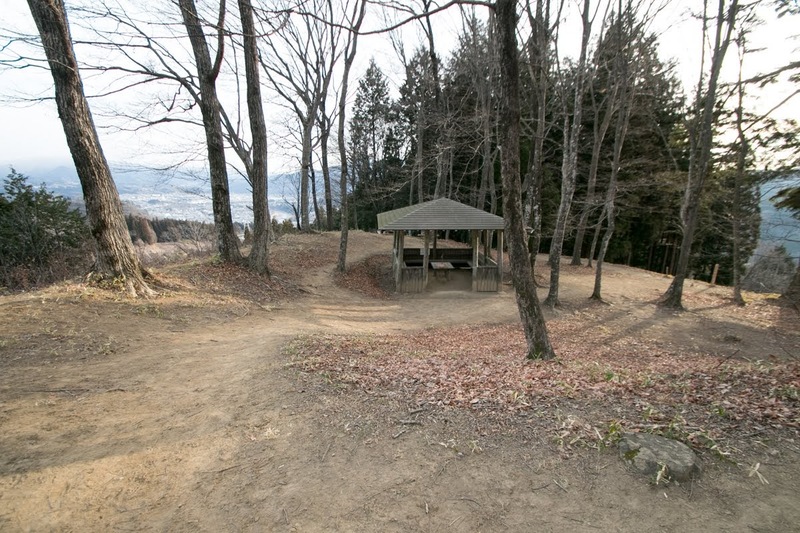 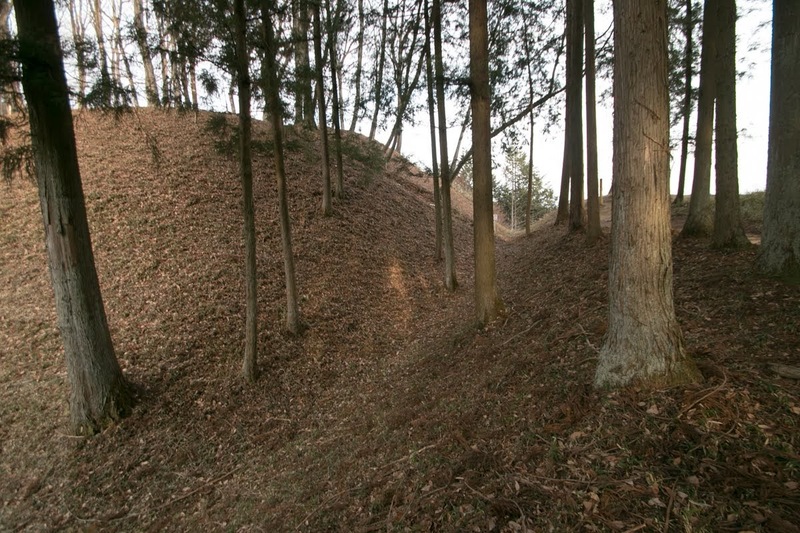 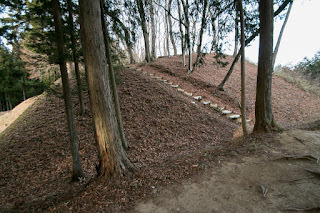 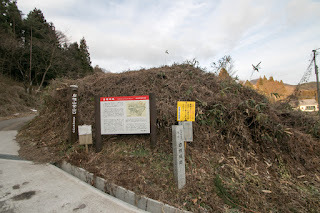 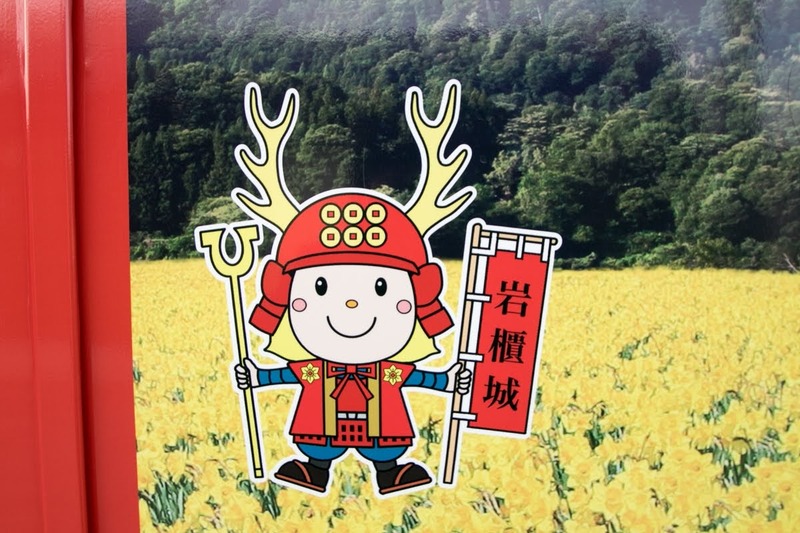 After the capture of Numata castle, the territory of Sanda clan continued about 100km from Ueda castle at Shinano province to Numata castle along Shinshu Kaido way, and Iwabitsu castle became the connecting point of territory. Masayuki also expanded Iwabitsu castle into a fortress city. 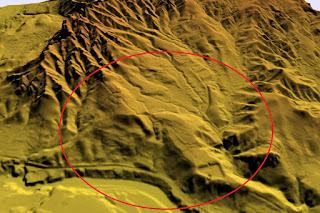 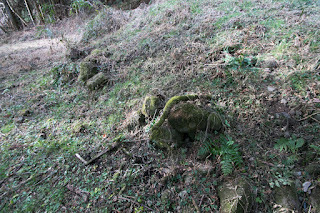 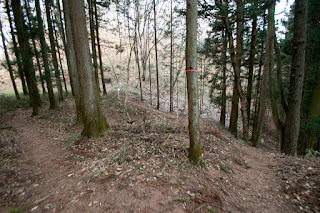 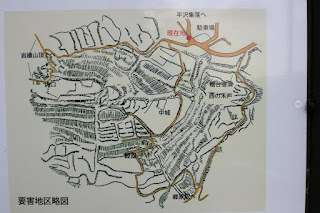 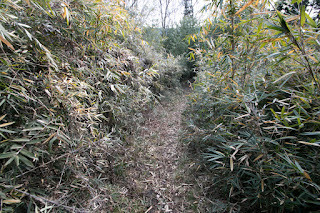 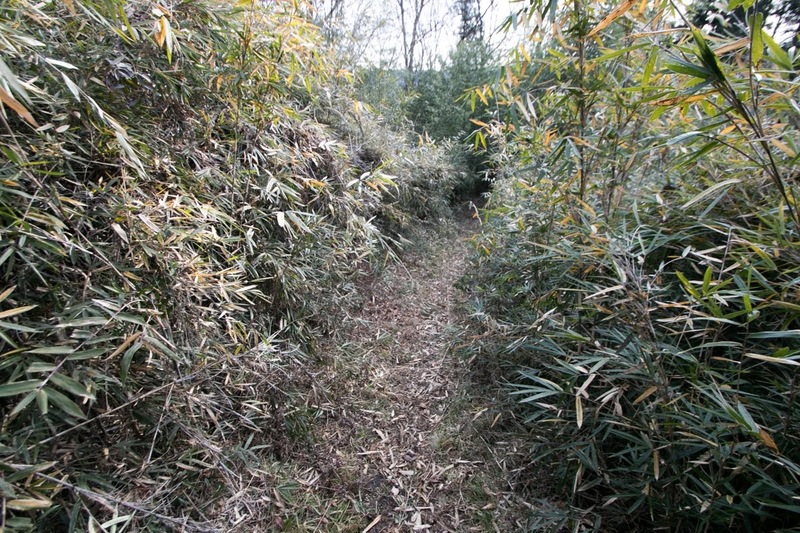 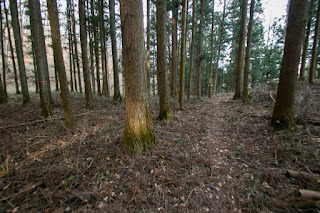 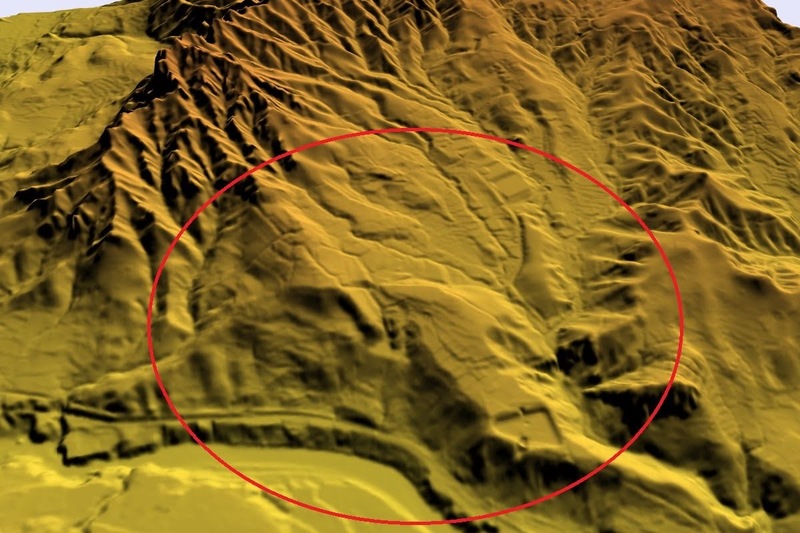 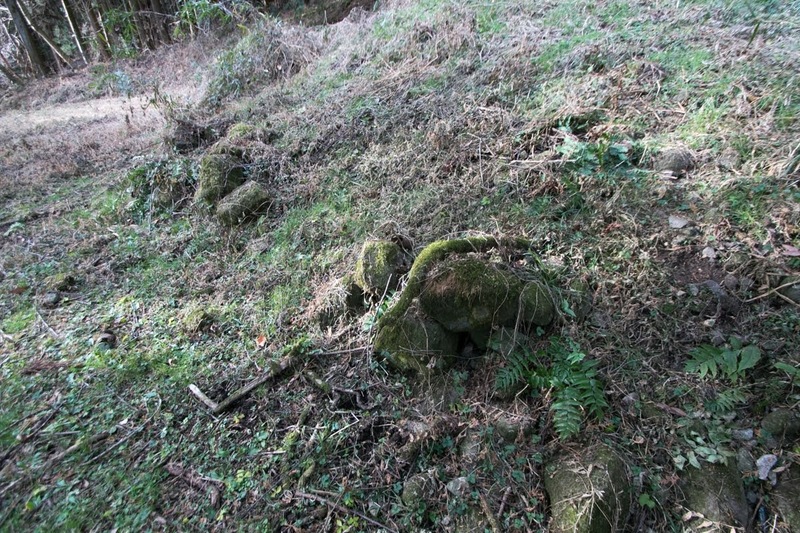 He placed castle town at the tableland of 1km long connecting to the mountain, and surrounded whole town by forts and gates. 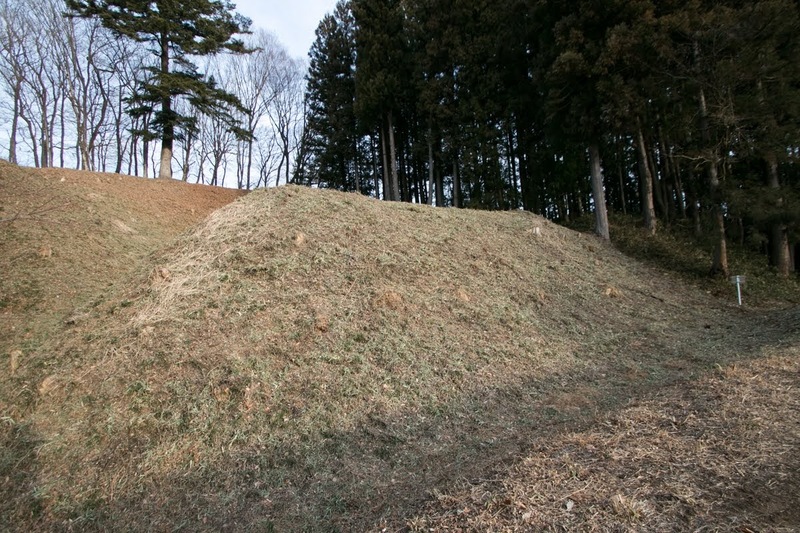 This structure resembles to Shinpu castle and town built by Katsuyori Takeda (1546-1582), master of Masayuki, under the planning of Masayuki. 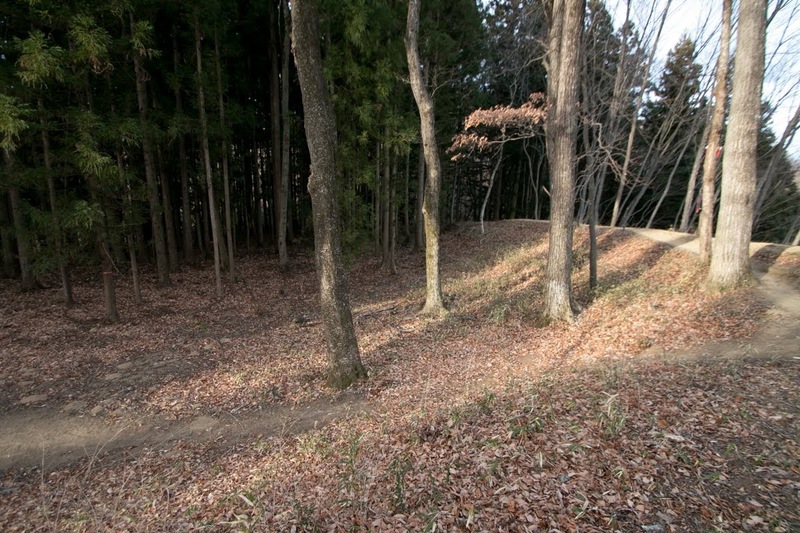 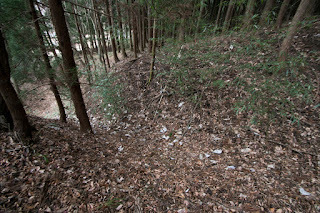 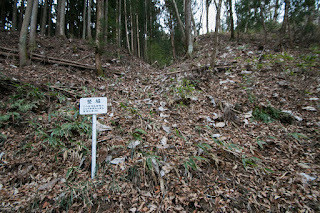 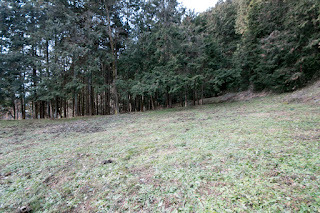 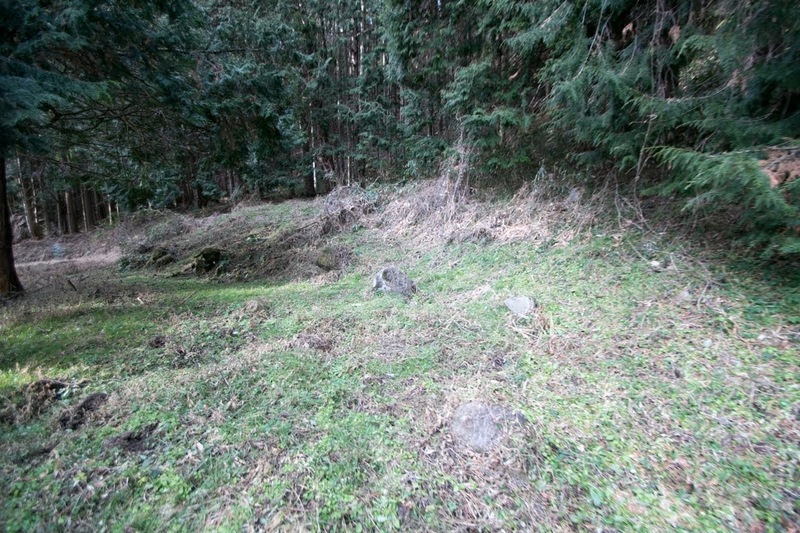 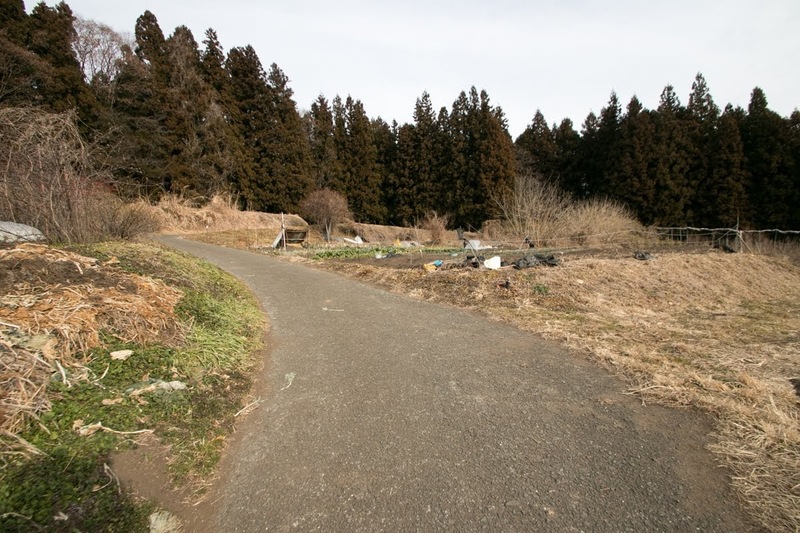 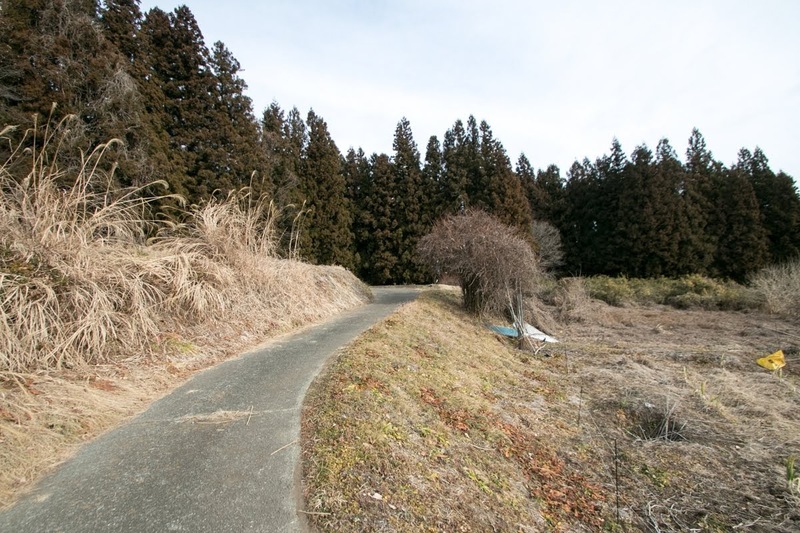 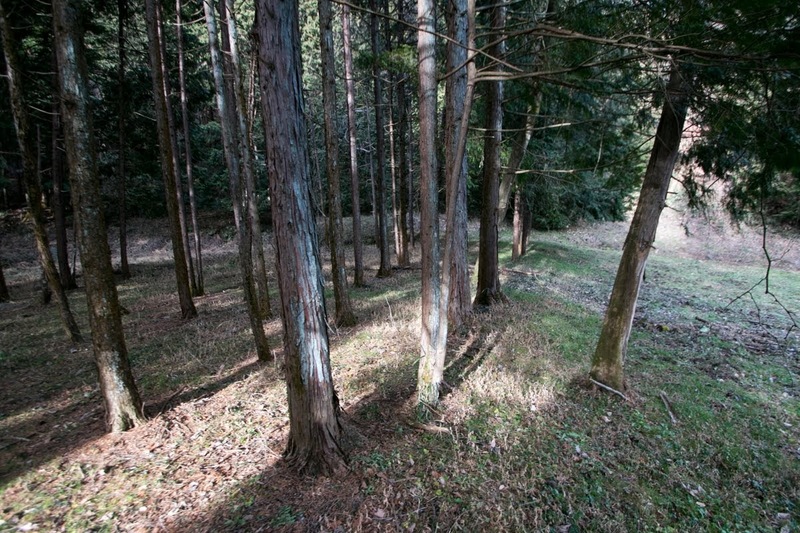 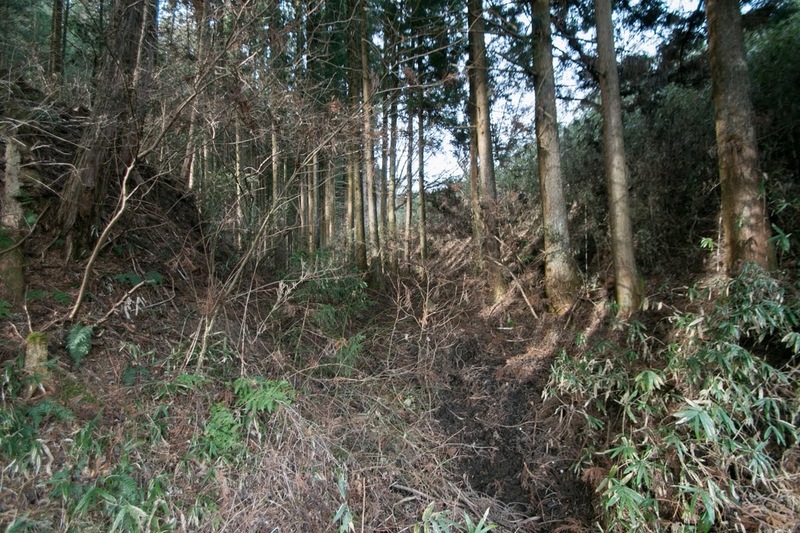 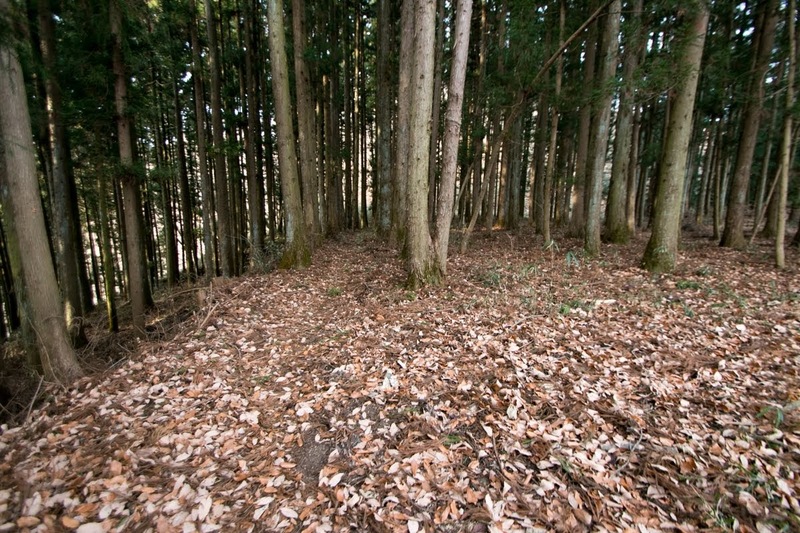 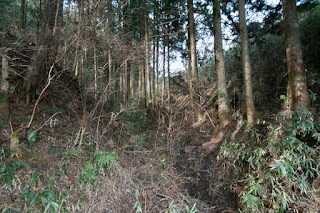 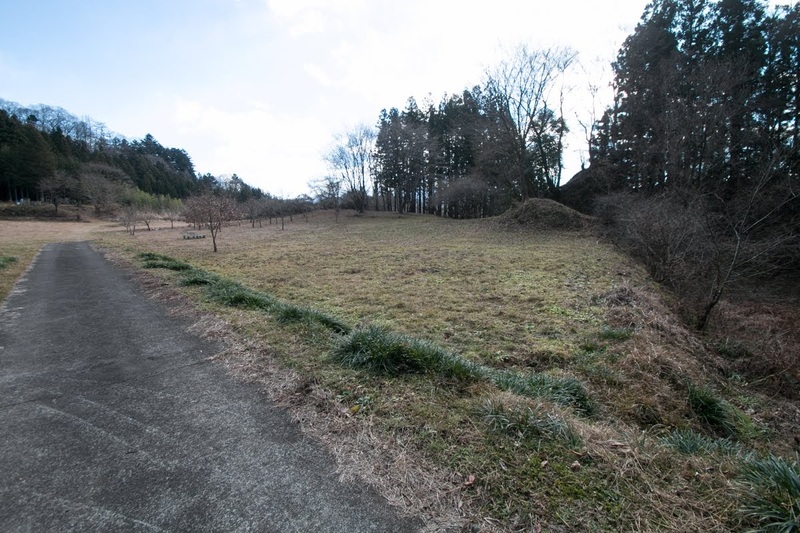 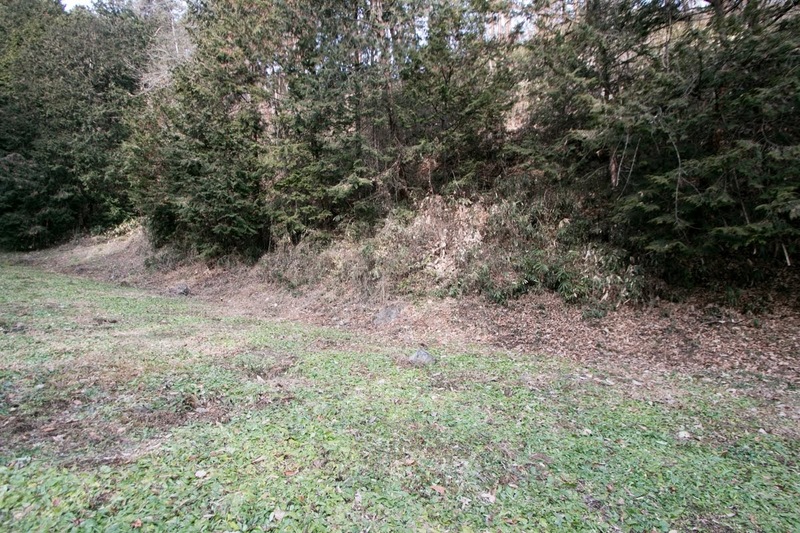 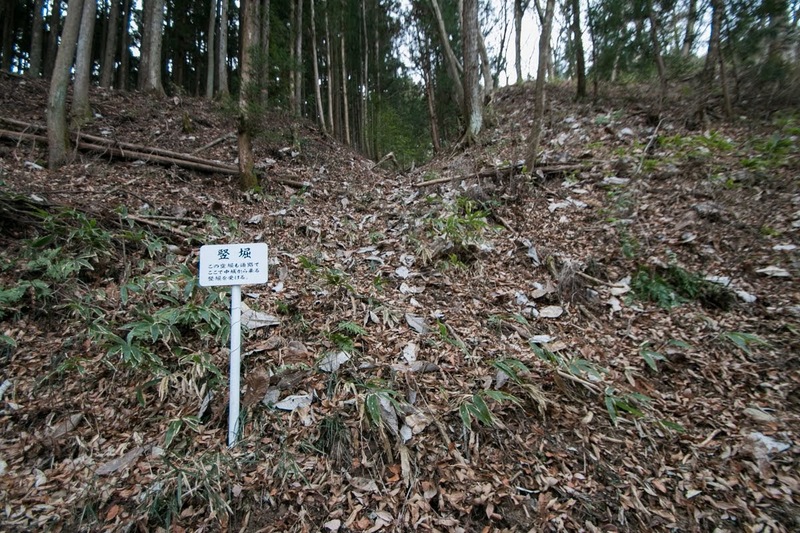 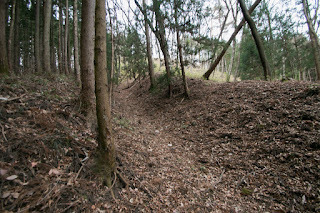 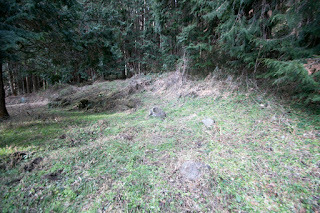 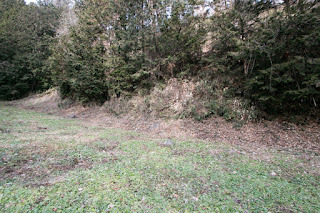 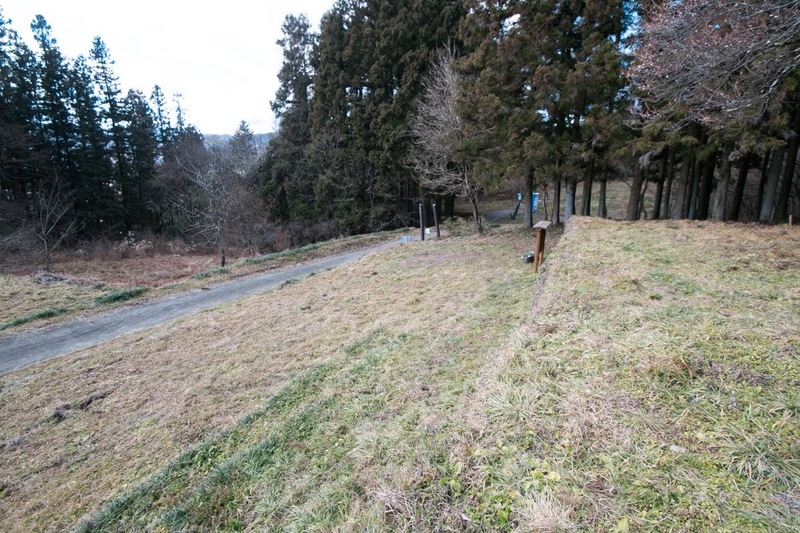 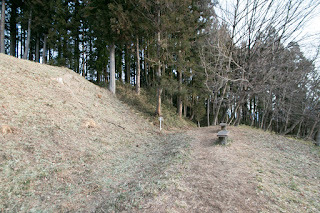 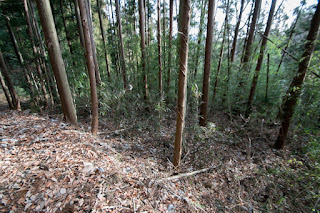 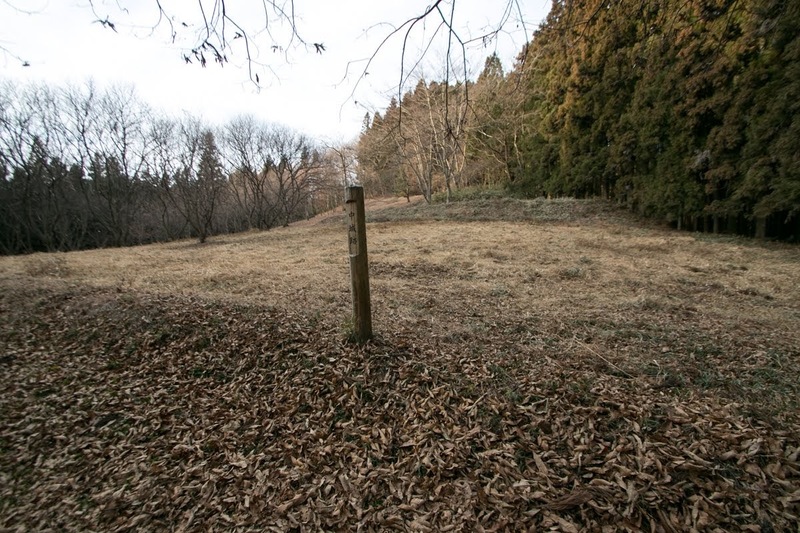 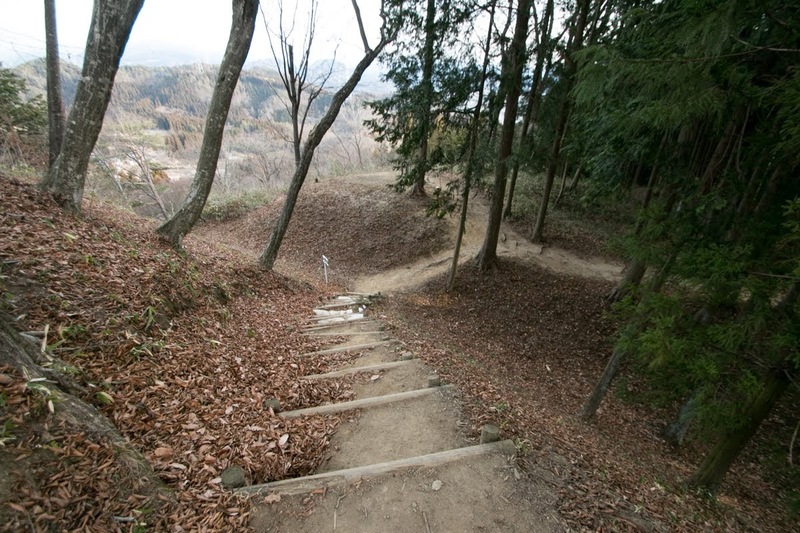 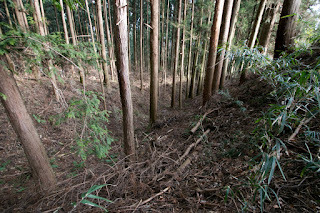 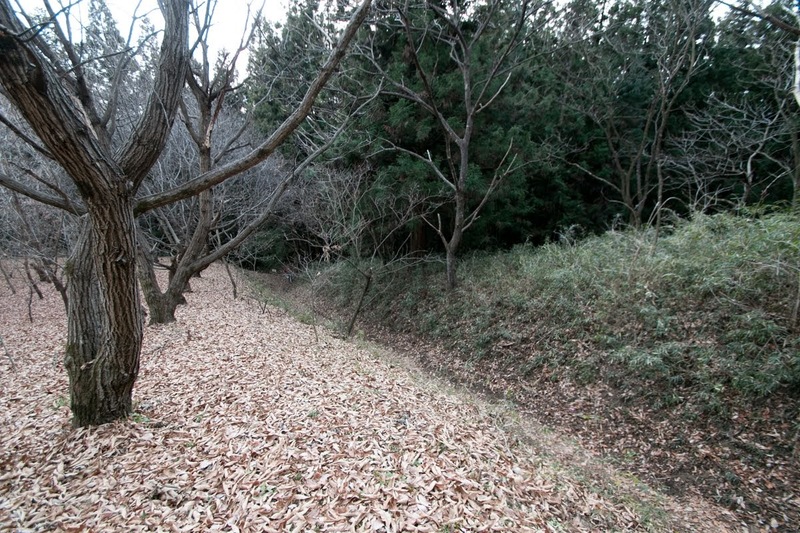 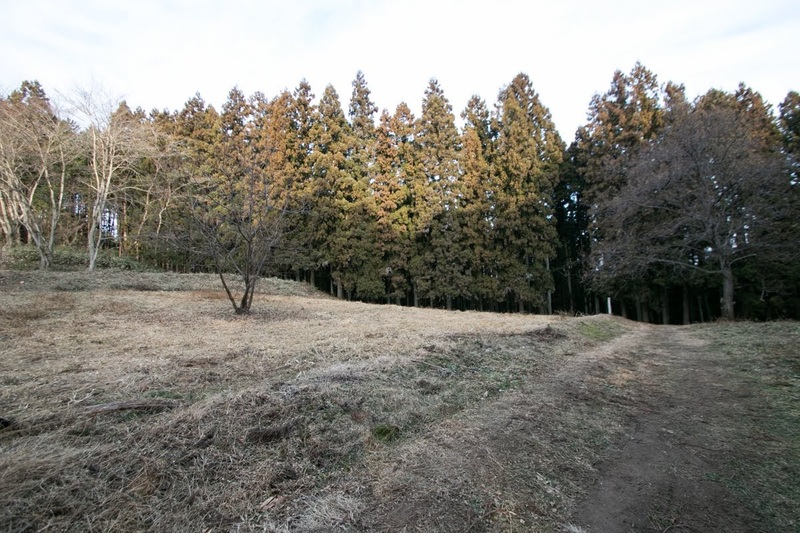 Iwabitsu area became a secure area as both edge of the valley was held by Sanada clan, and adding to existence of fortress, Iwabitsu town became prosperous and supported Sanada clan. 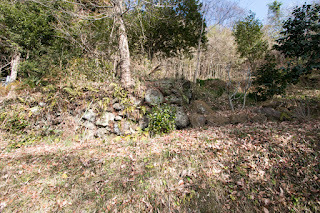 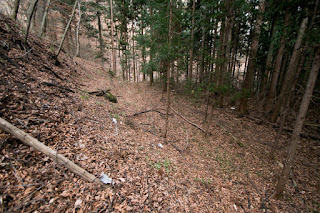 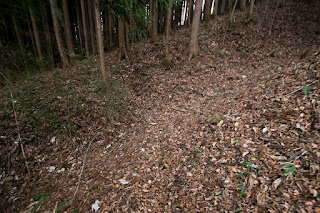 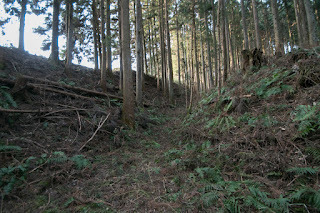 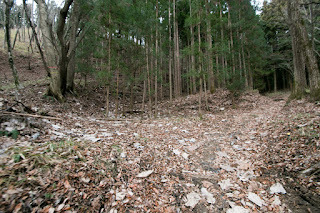 At the fall of Takeda clan in 1582, it was said that Masayuki planned to receive refuging his master Katsuyori in this castle, but Katsuyori did not come and suicided, then this castle was saved from war. After the fall of Takeda clan in 1582, Sanada clan had to fight two front war against Tokugawa clan and Hojyo clan to protect their territory. 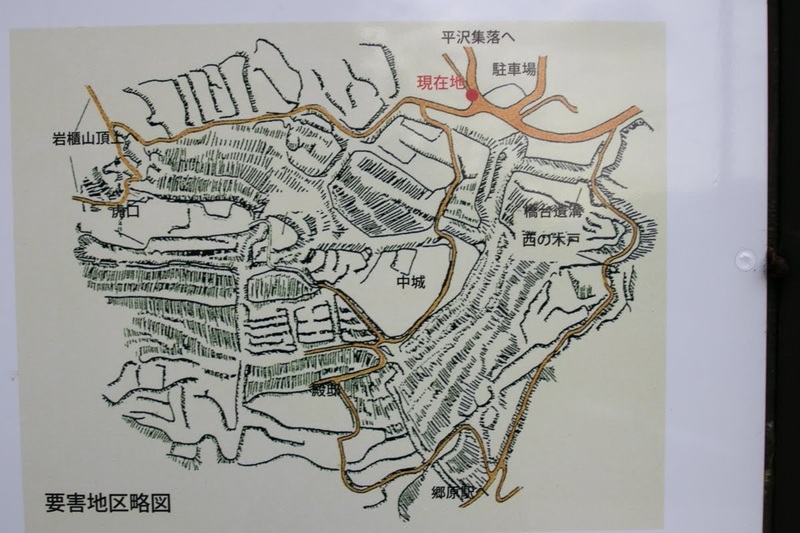 But Masayuki used interior lines utilizing Iwabitsu castle along with Ueda castle and Numata castle, and finally kept whole region both at Shinano province and Kozuke province. 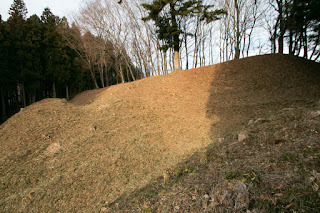 Once the situation became stable under Toyotomi government, Masayuki gave Iwabitsu castle to his eldest son Nobuyuki Sanada (1566-1658), along with Numata castle. After the death of Hideyoshi Toyotomi in 1598, there arose a conflict between Ieyasu Tokugawa (1543-1616), the largest lord, and former Toyotomi supporting lords lead by Mitsunari Ishida (1560-1600), a chief administrative staff of Toyotomi government. 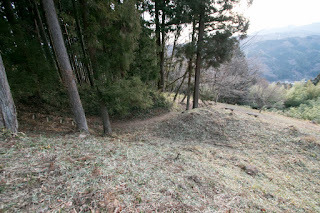 Masayuki and his second son Yukimura Sanada (1567-1615) were close to Toyotomi government and supported Mitsunari, but Nobuyuki married with daughter of Tokugawa general and belonged to Tokugawa side. 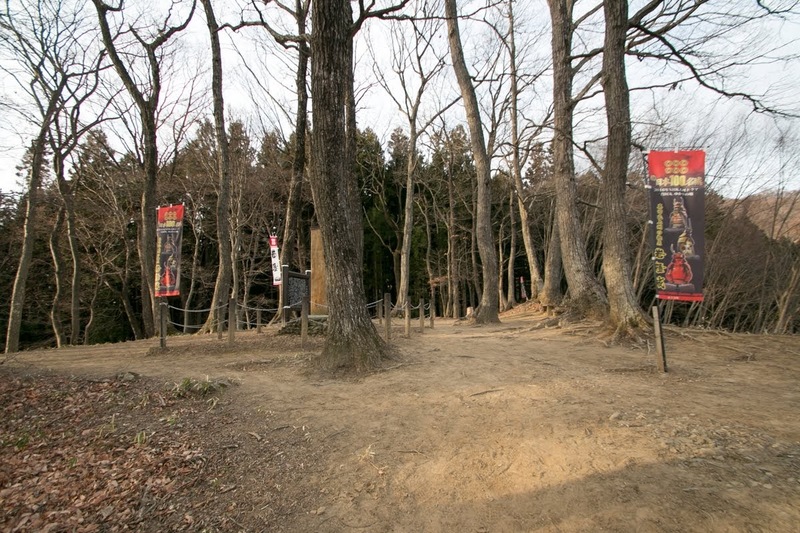 Finally Ieyasu won against Mitsunari at the battle of Sekigahara in 1600, and Nobuyuki was admitted to keep whole former territory of Sanada clan including Iwabitsu castle. But due to Ikkoku Ichijo Rei (one domain one castle rule) published in 1615, Iwabitsu castle was abolished and castle town moved to riverside area. 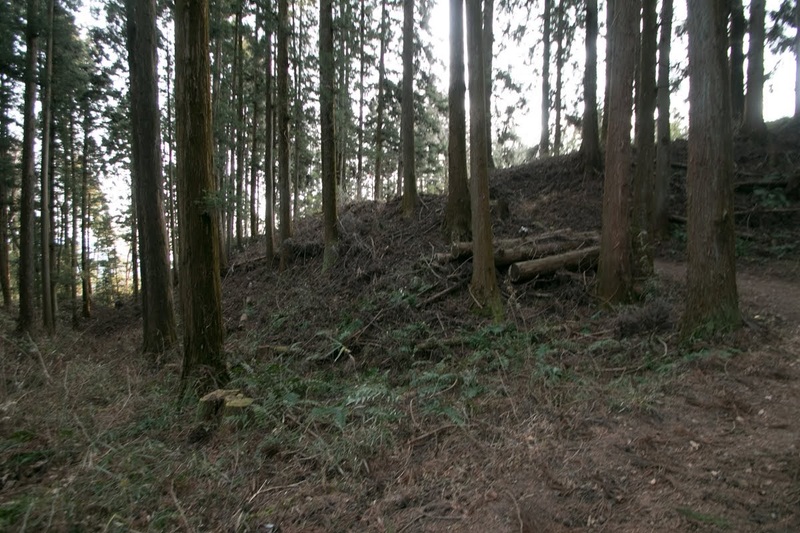 As castle area is apart from central town, although there is no building, whole shape of castles and attached town clearly remains in trees. 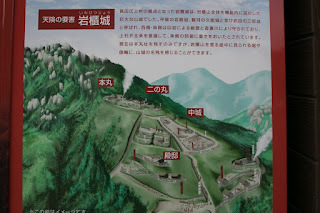 Today we can imagin the source of military power of small lord held their own against large powers. 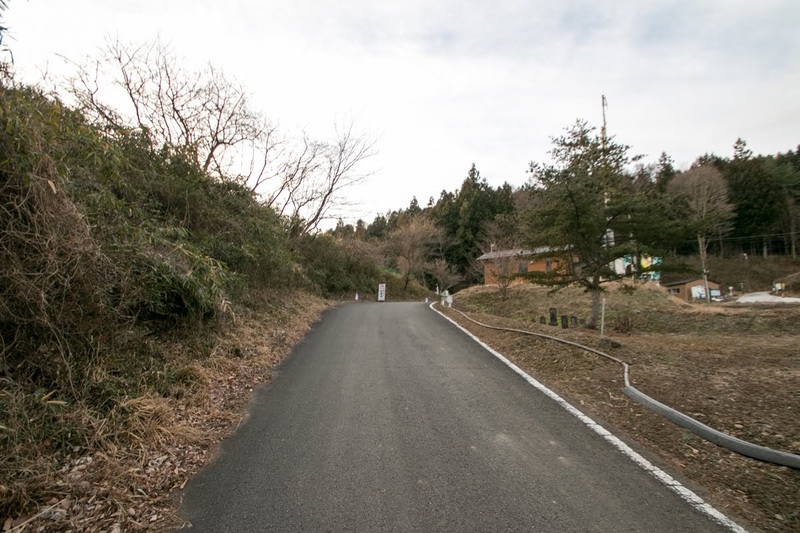 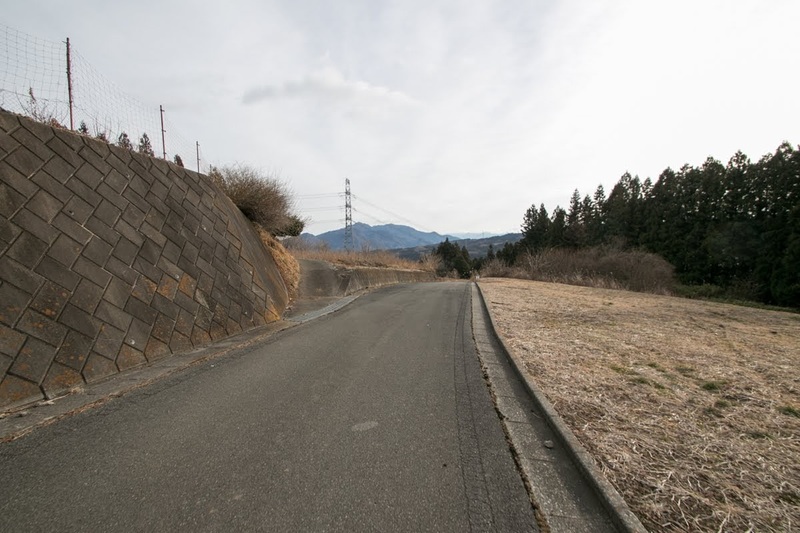 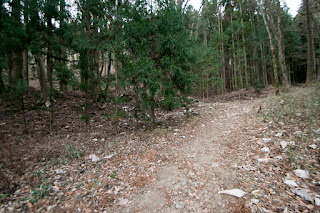 30 minutes walk to entrance of climbing road from JR East Agatsuma line Haramachi station. 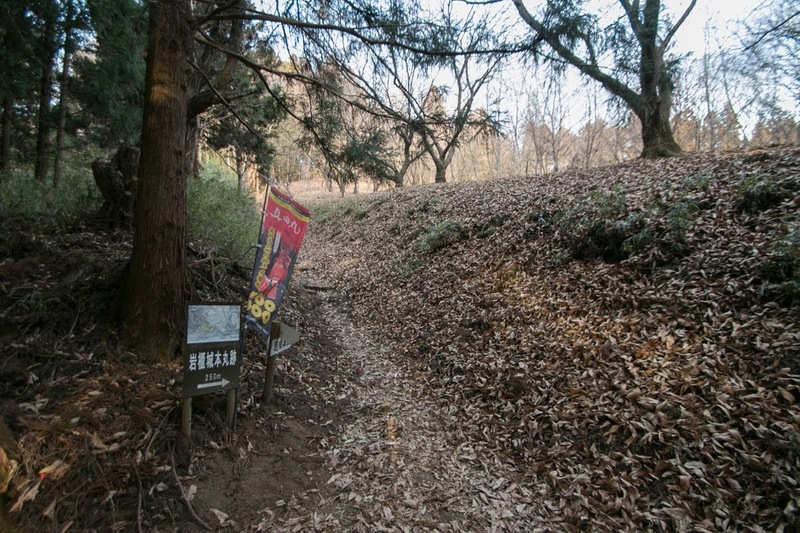 Another 30 minutes walk to central area. 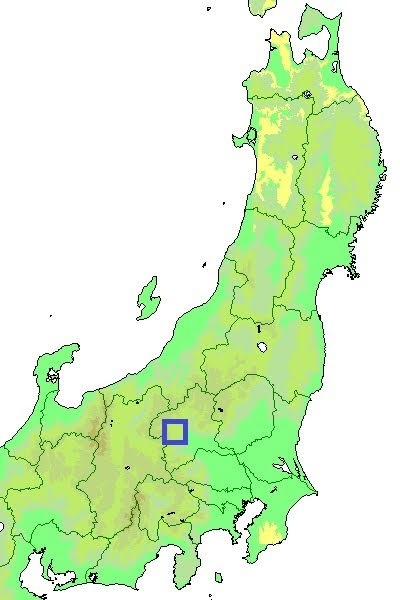 30 minutes drive from Kanetsu Jidoshado Expressway Shibukawa-Ikaho interchange.